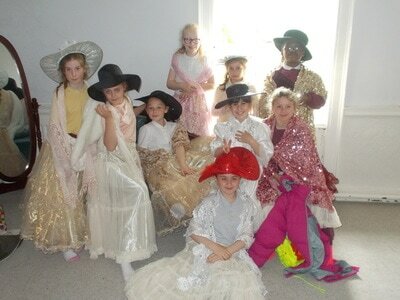 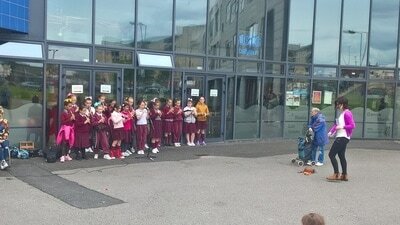 We had great fun performing for our school show 'Virgin Mary's got talent'. 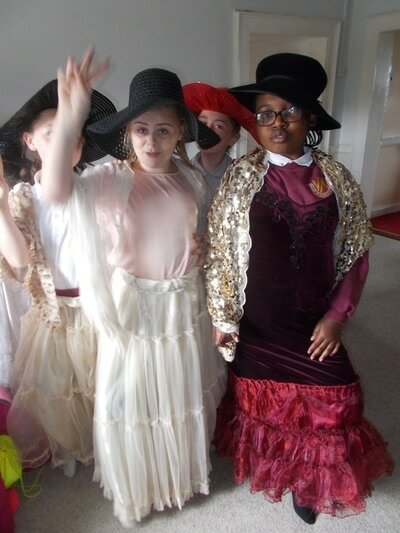 We performed a drama/dance mix to 'Saturday night'. Have a look at how our final dress rehearsal went before we took to the stage for the real thing! 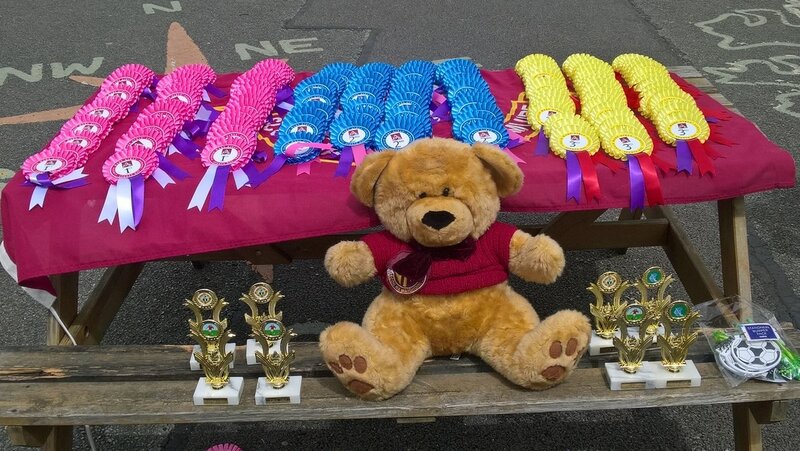 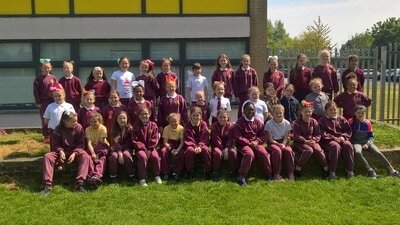 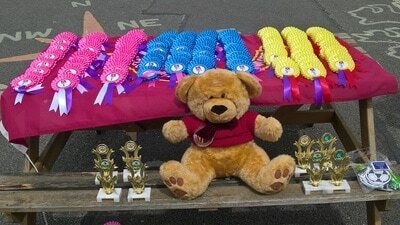 A massive well done to everyone for taking part in our sports day. 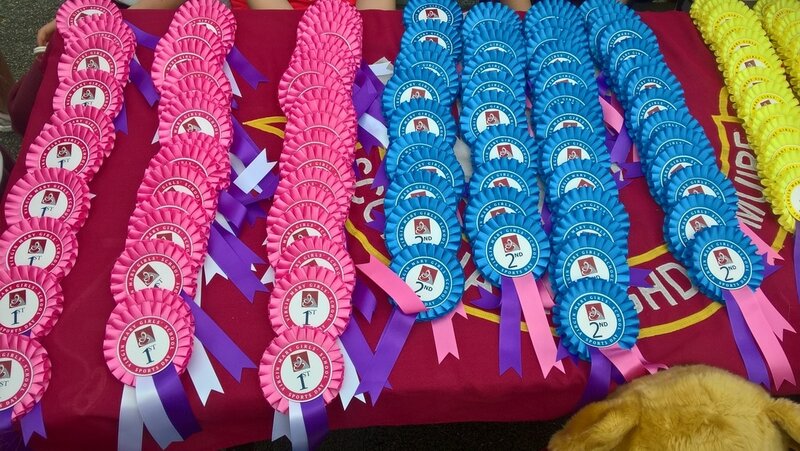 events There were lots of team and individual prizes up for grabs on the day. Our team pictures can be seen on the home page of our school website. 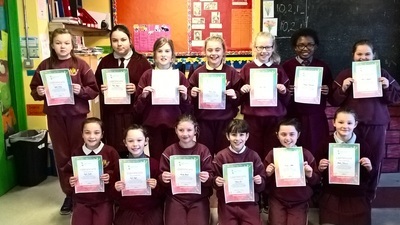 Here are some of our individual winners from the prize giving ceremony. 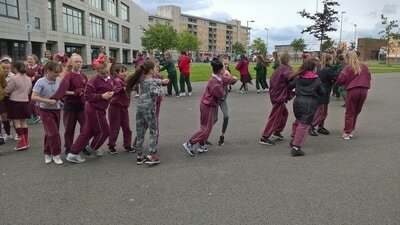 We had great fun taking part in active week. 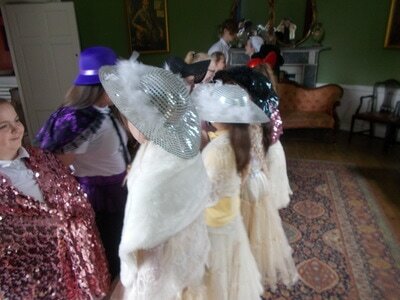 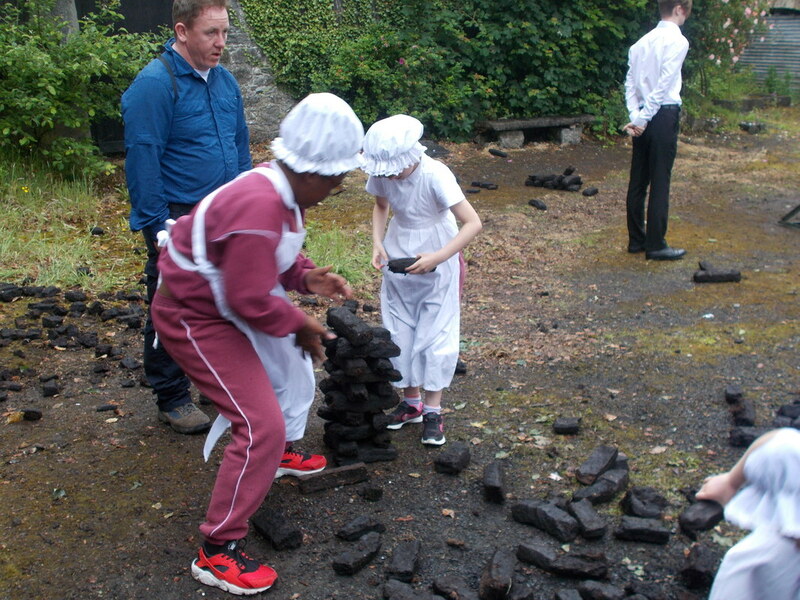 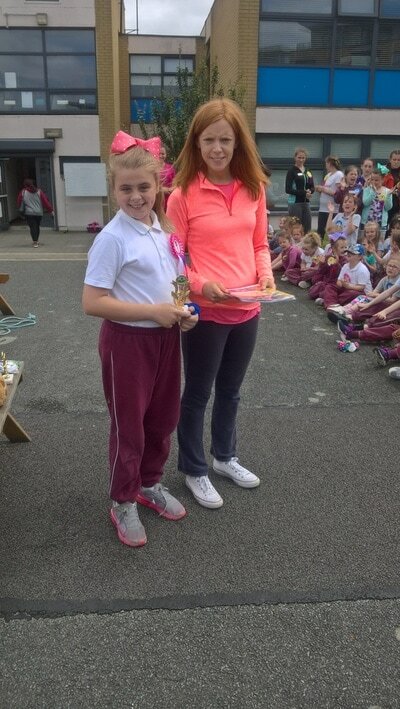 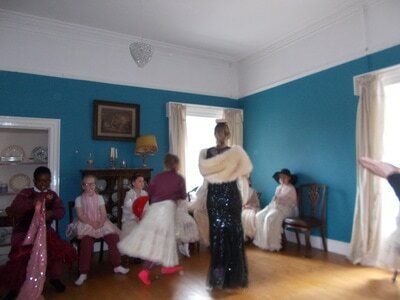 We did lots of fun activities including disco dancing in the school yard, soccer, and a camogie blitz. 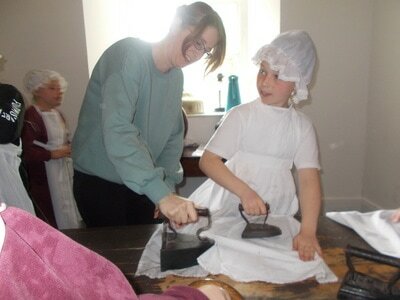 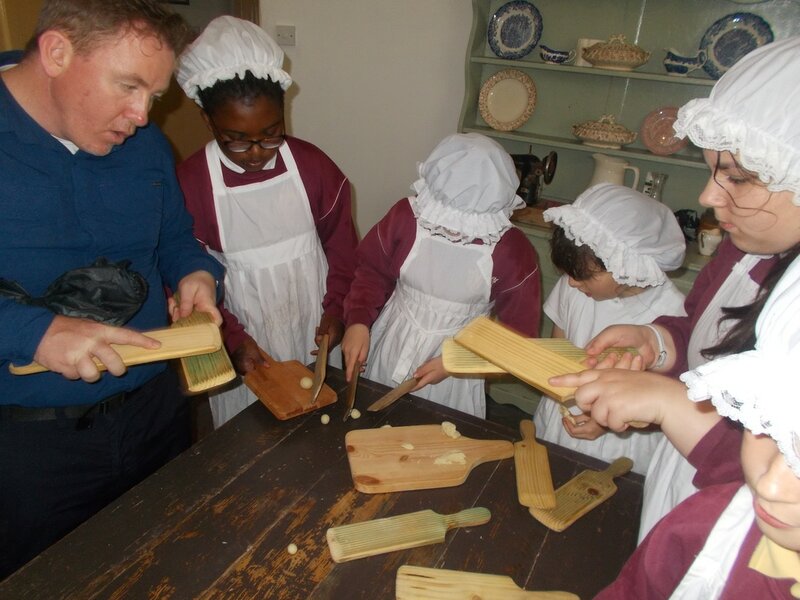 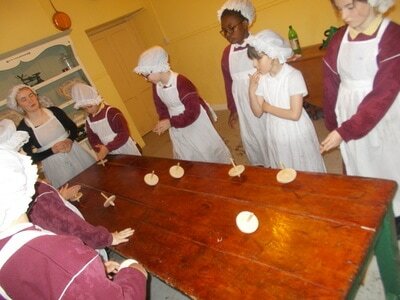 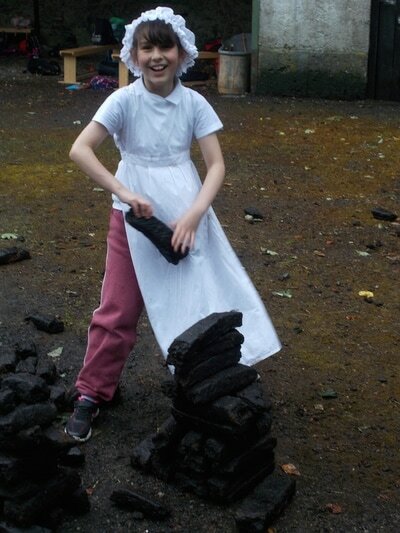 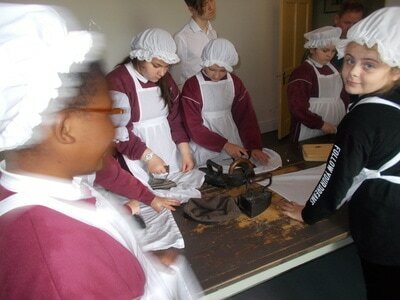 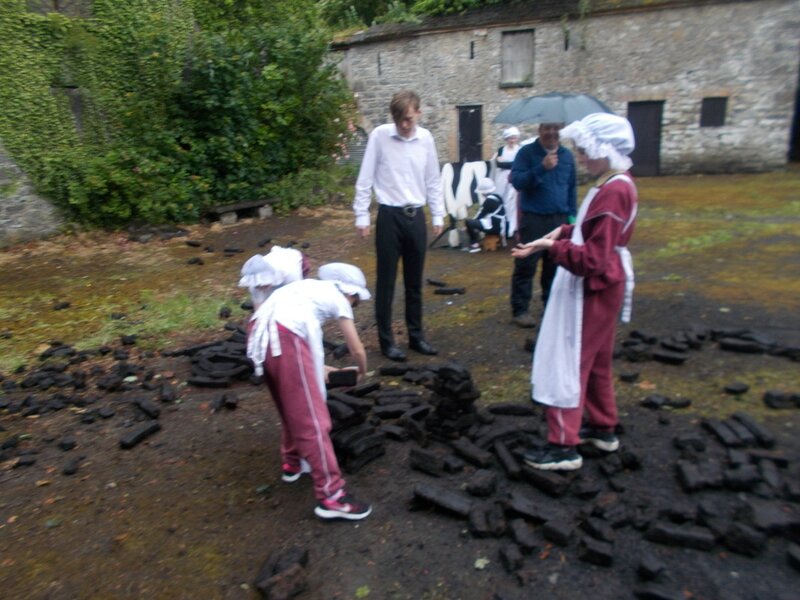 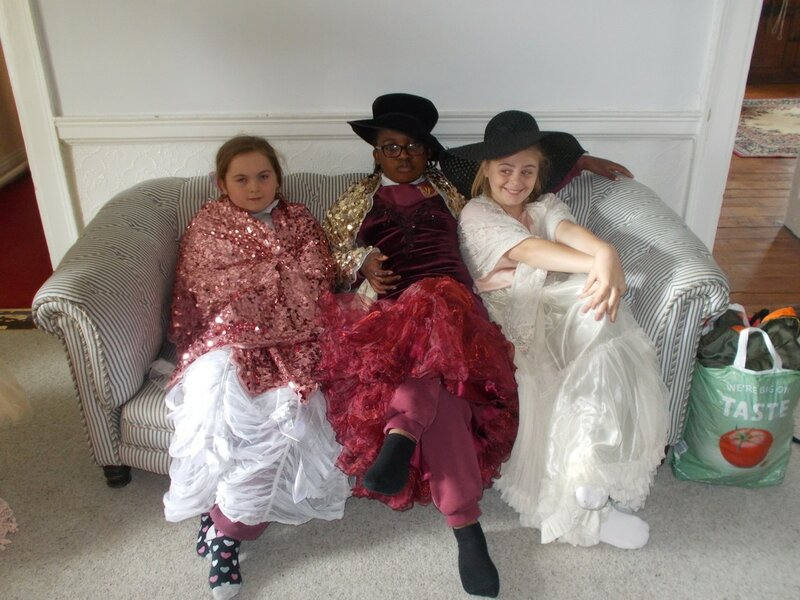 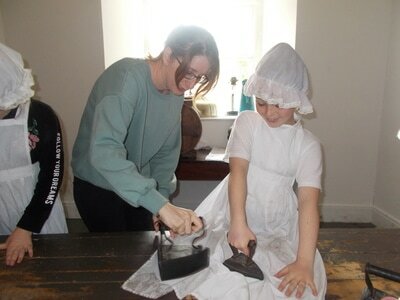 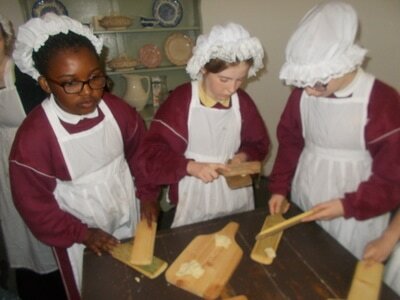 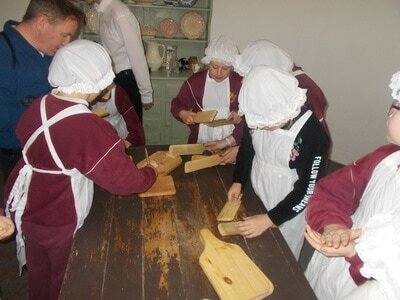 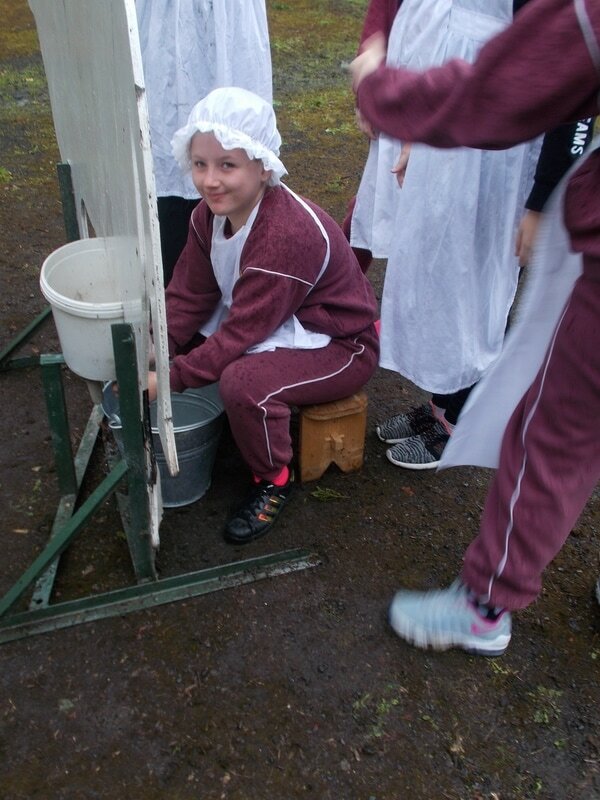 Here are a few pictures from activities we took part in over the week. 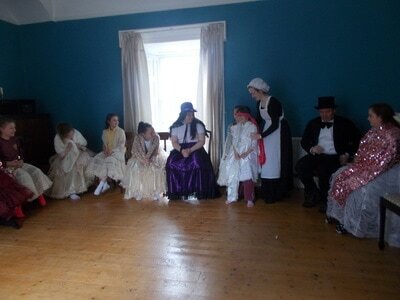 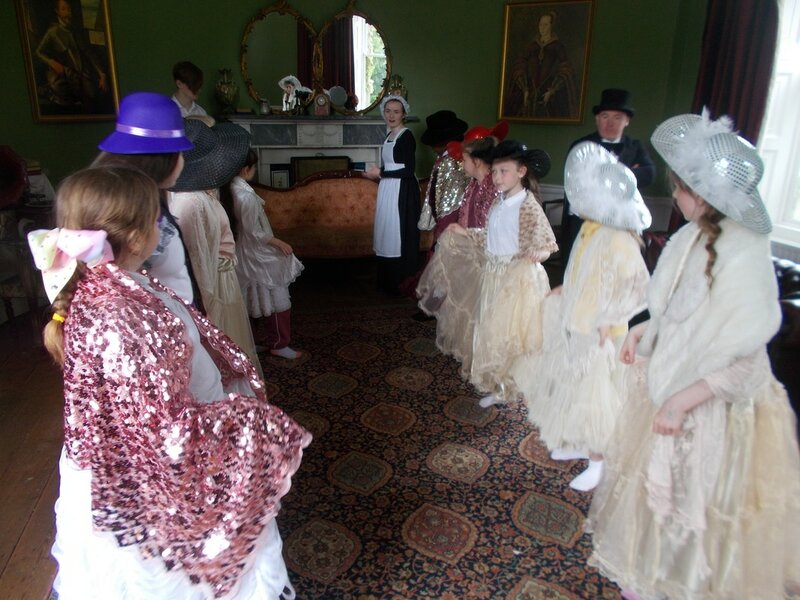 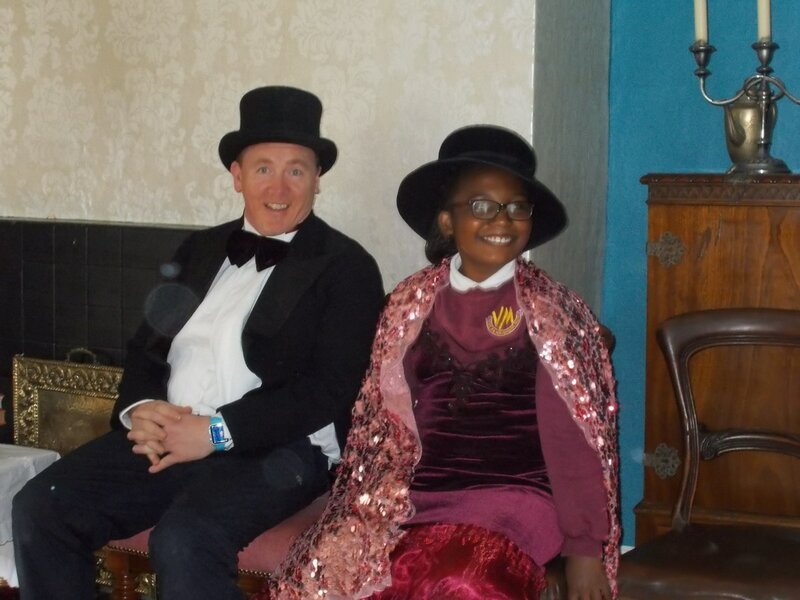 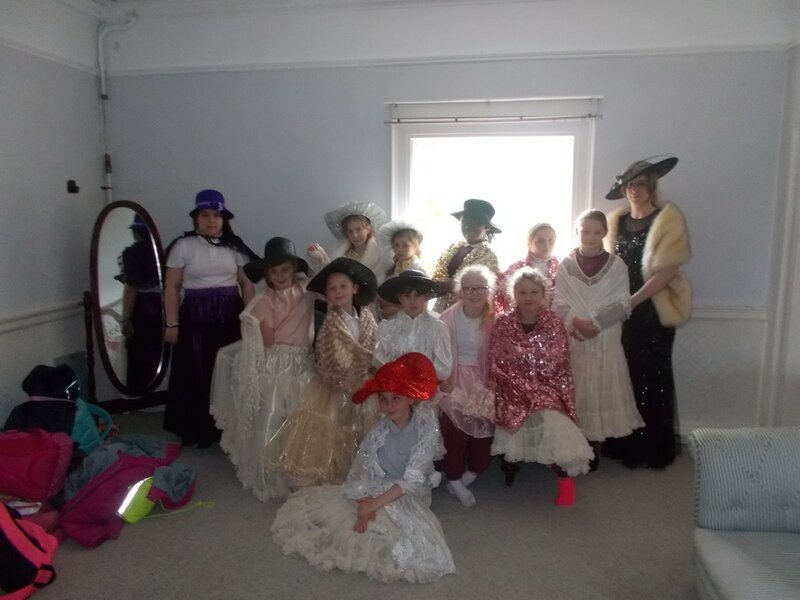 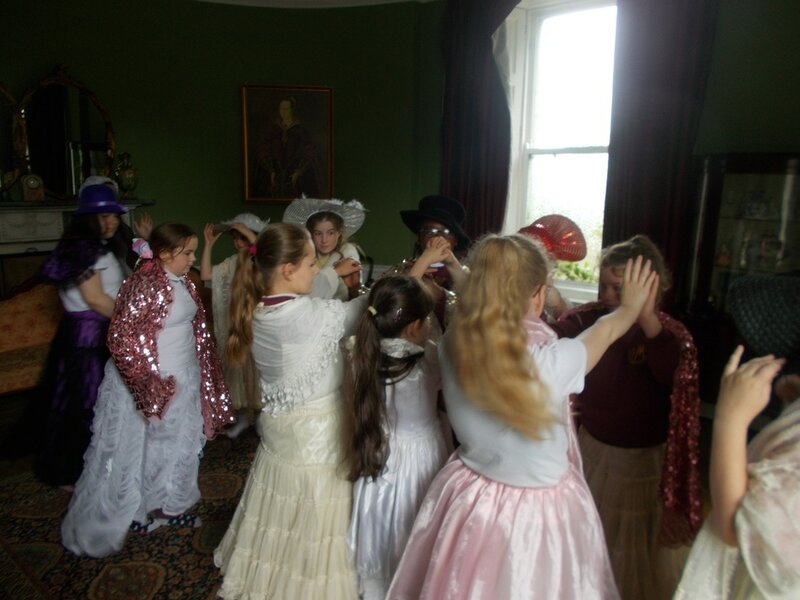 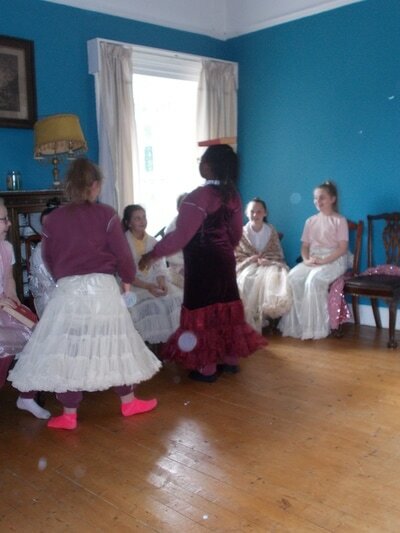 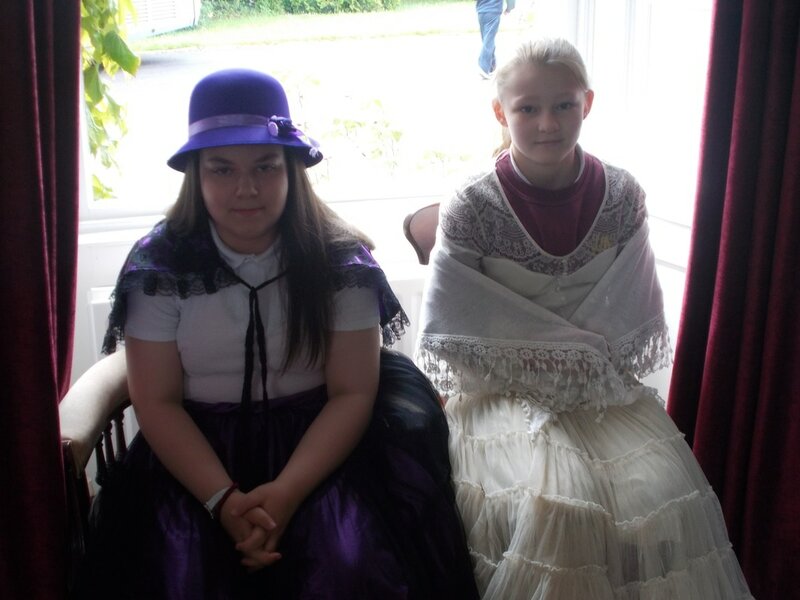 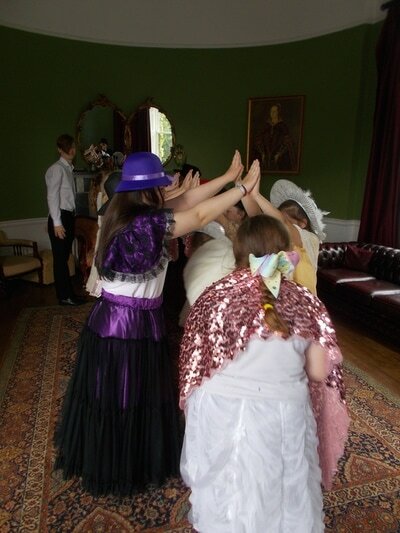 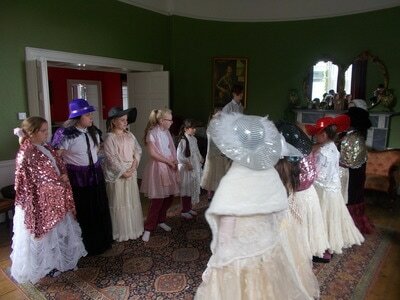 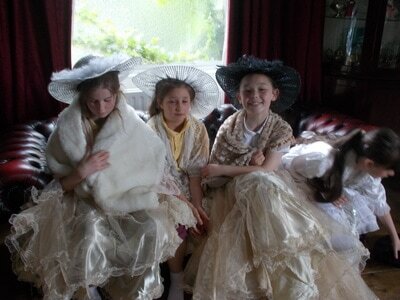 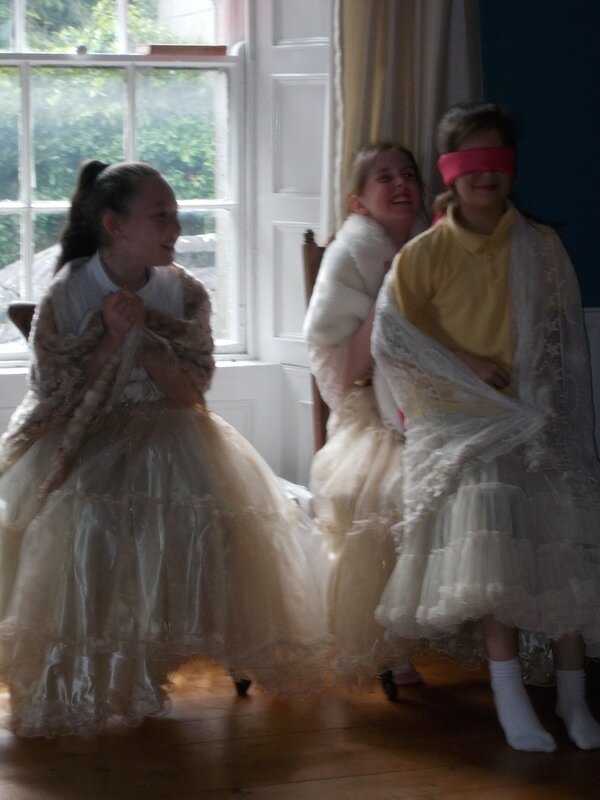 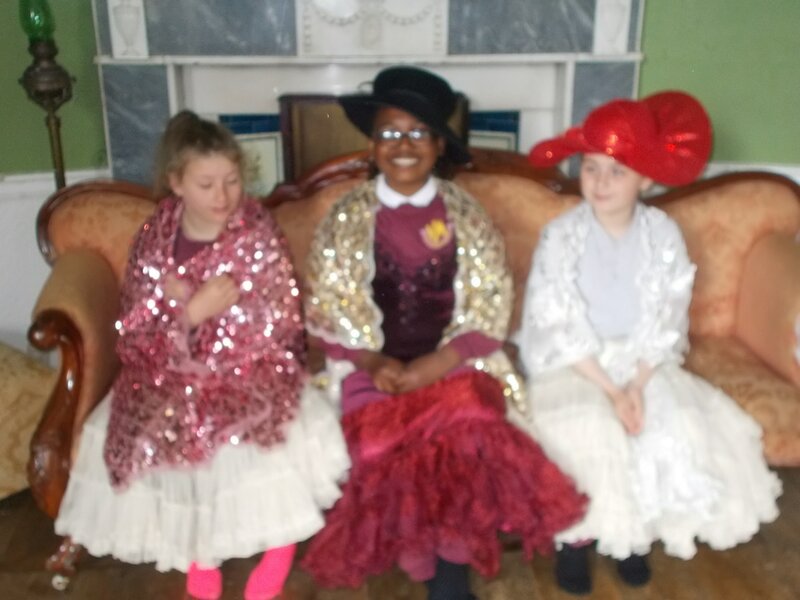 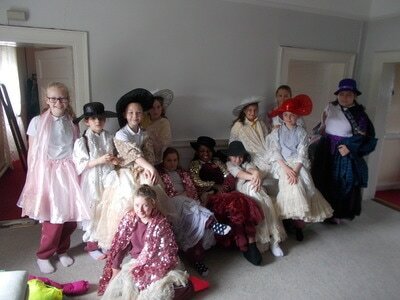 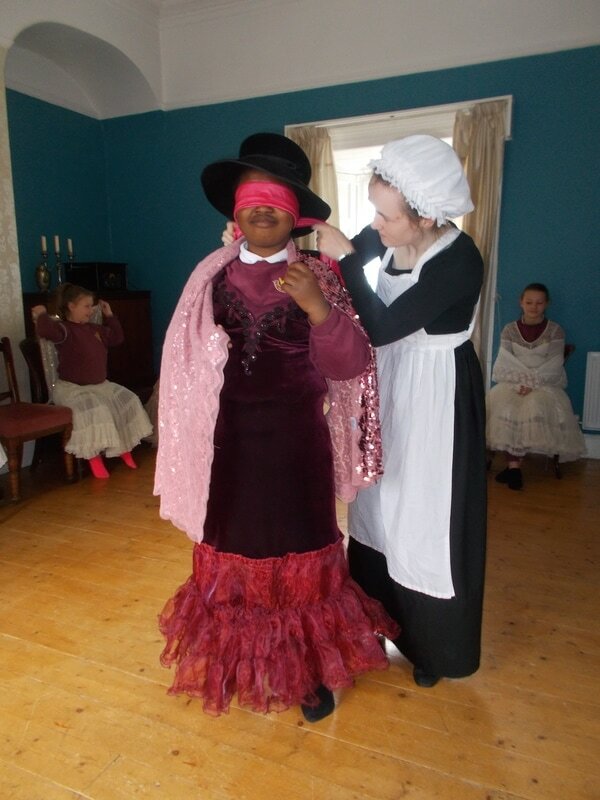 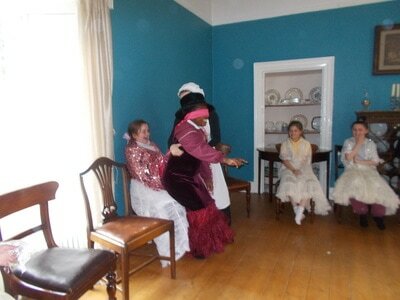 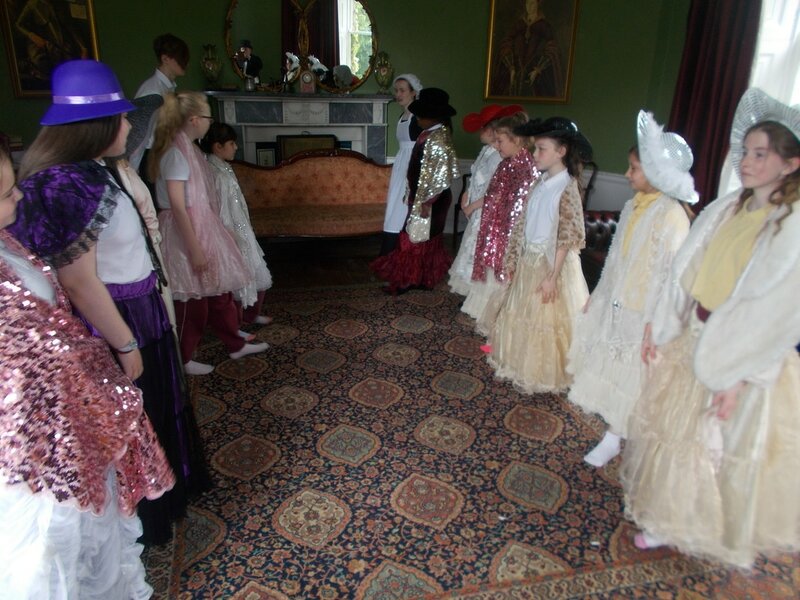 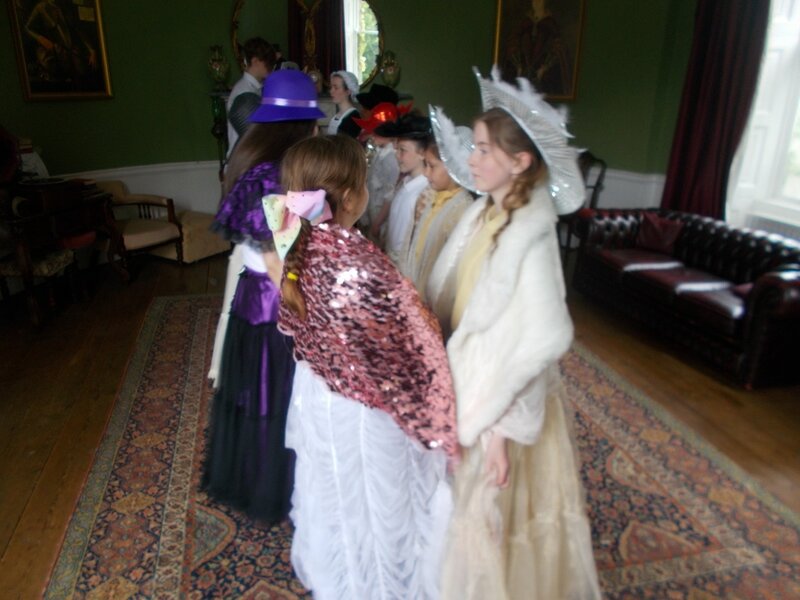 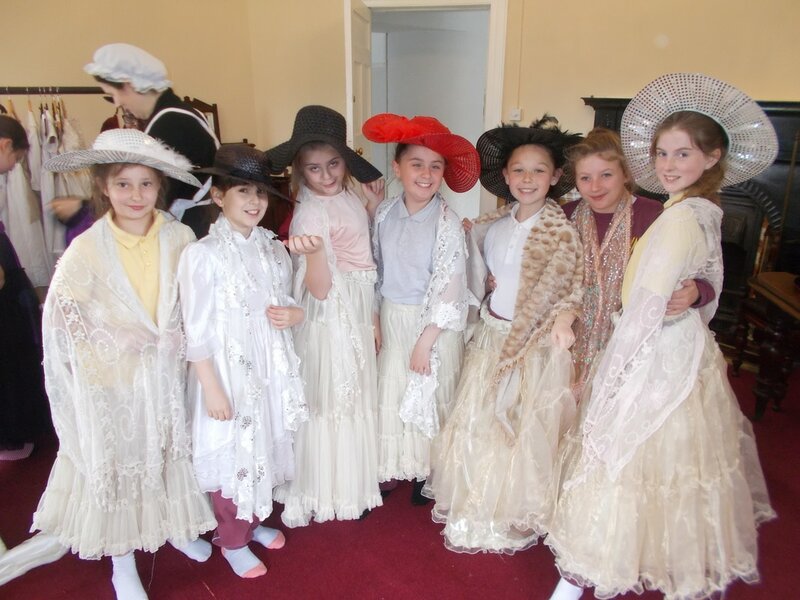 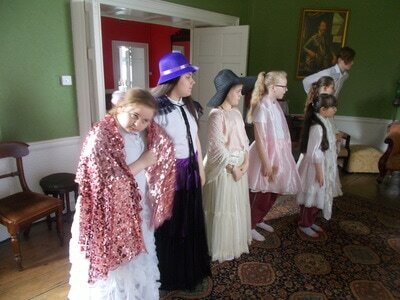 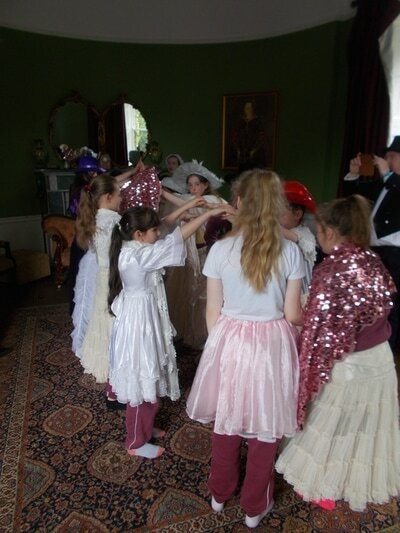 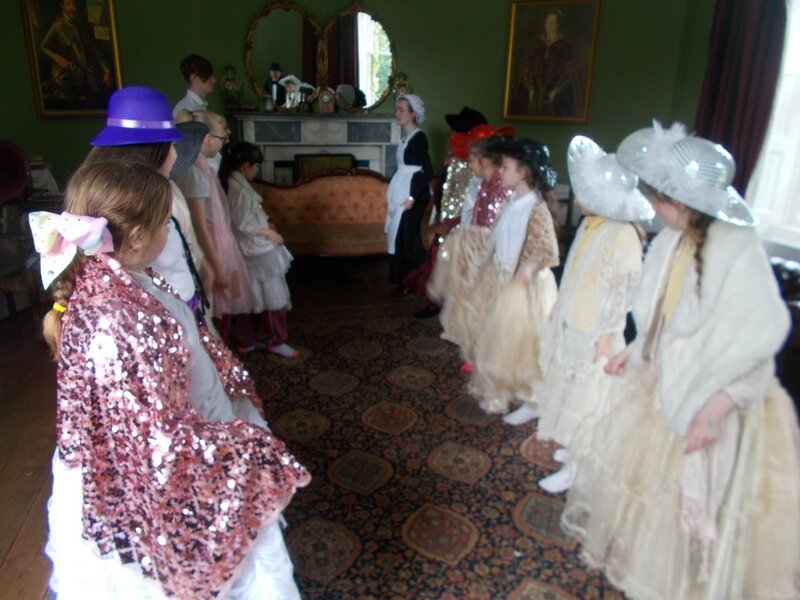 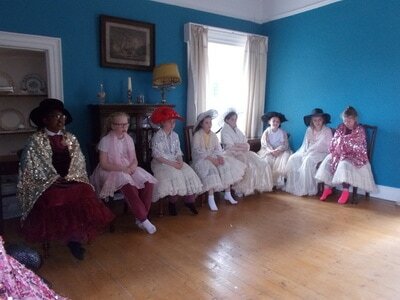 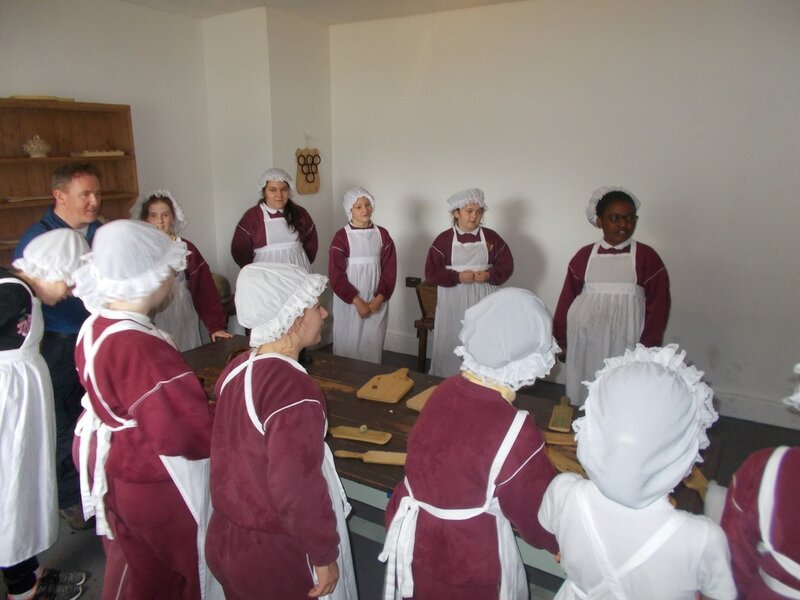 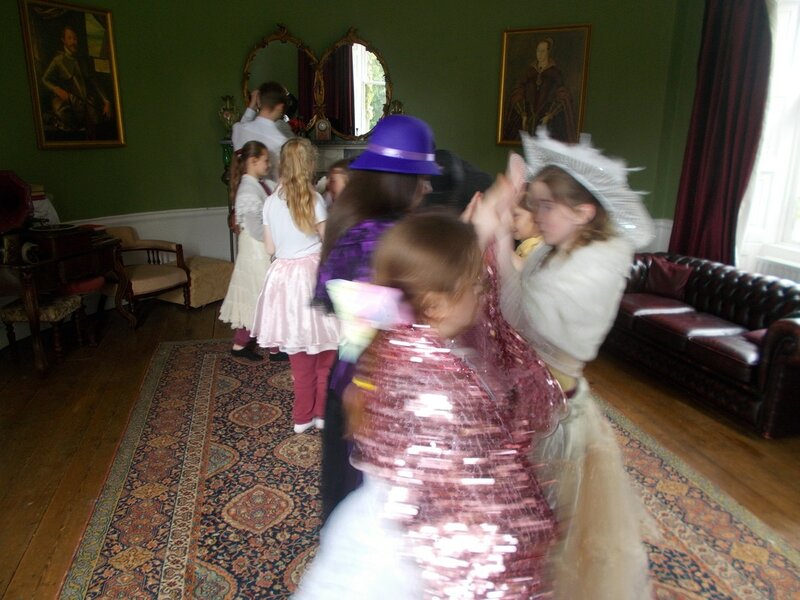 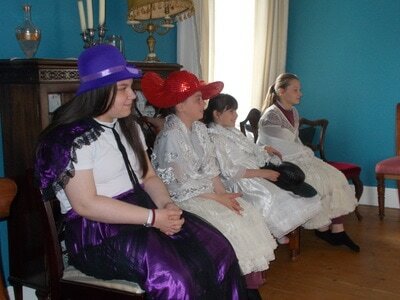 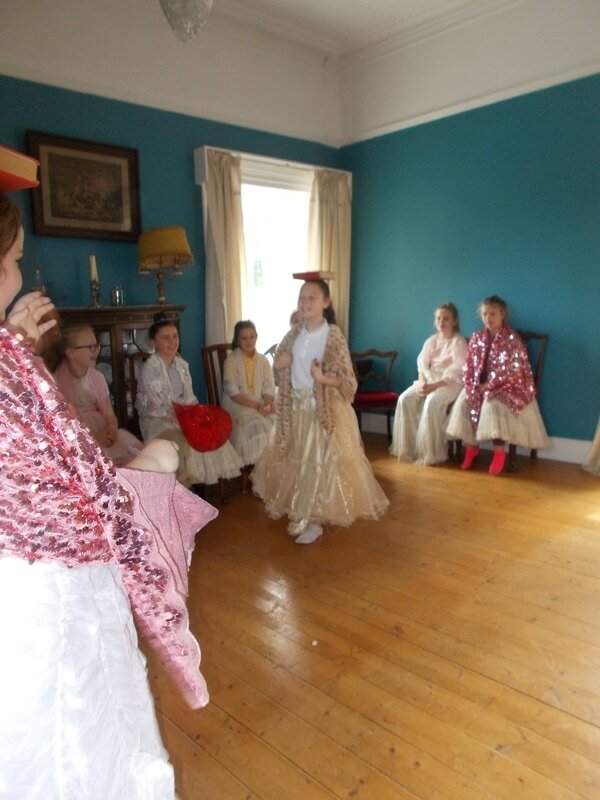 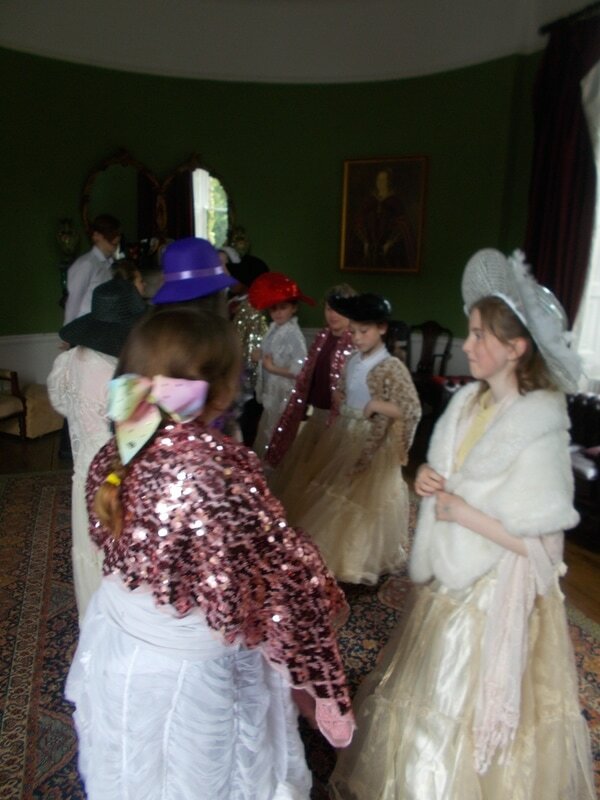 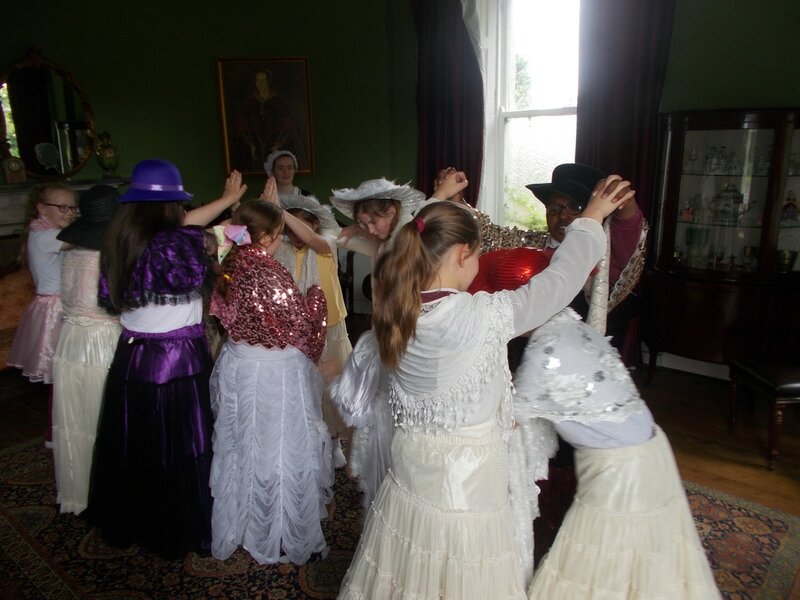 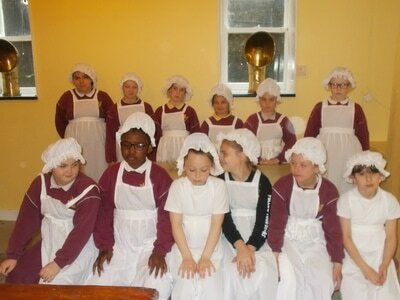 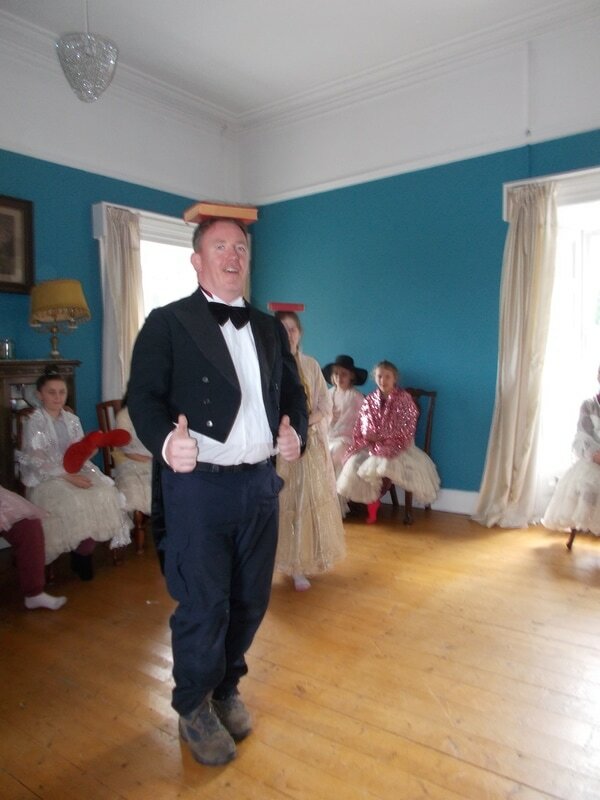 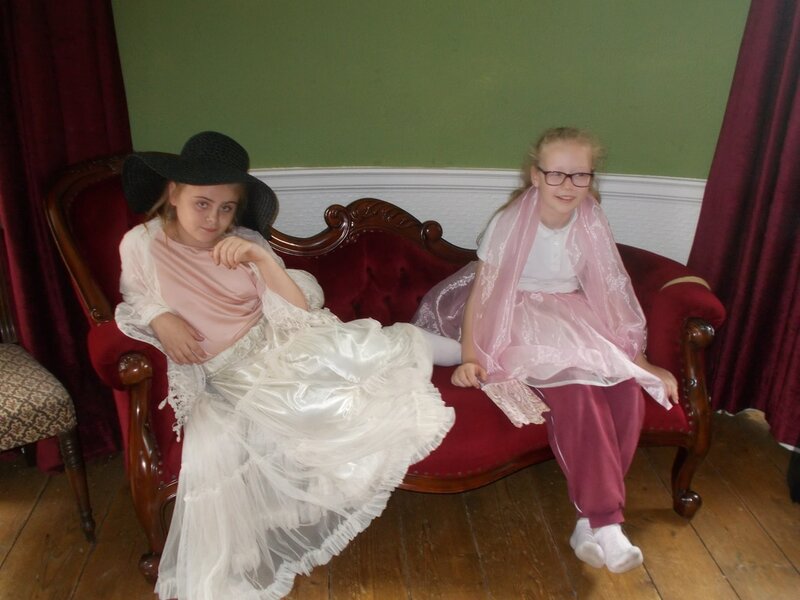 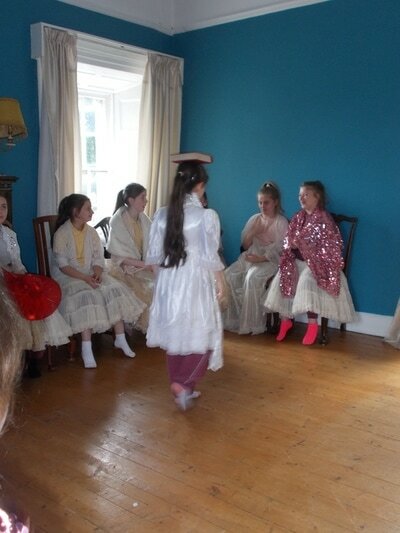 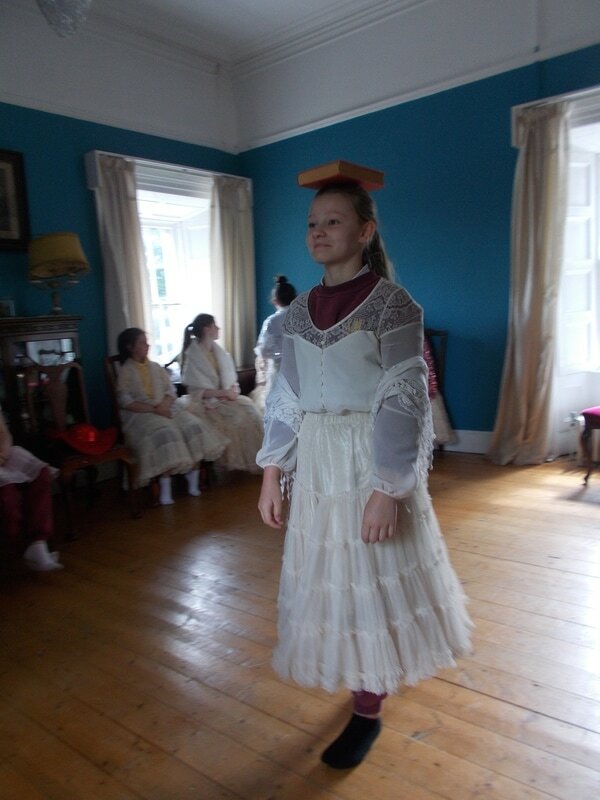 For our school tour we travelled back in time to the Victorian era and paid a visit to Clonard house in Mullingar, Co. Westmeath. 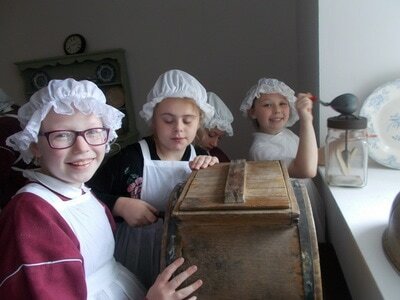 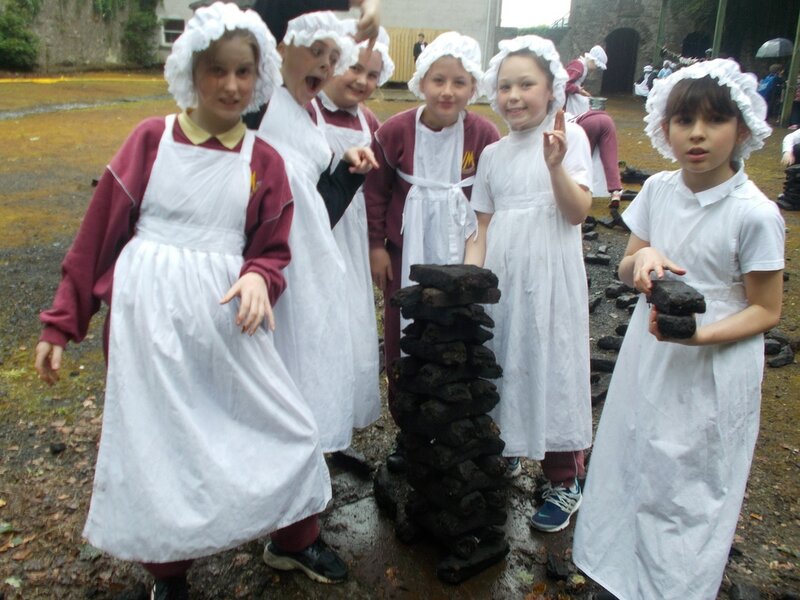 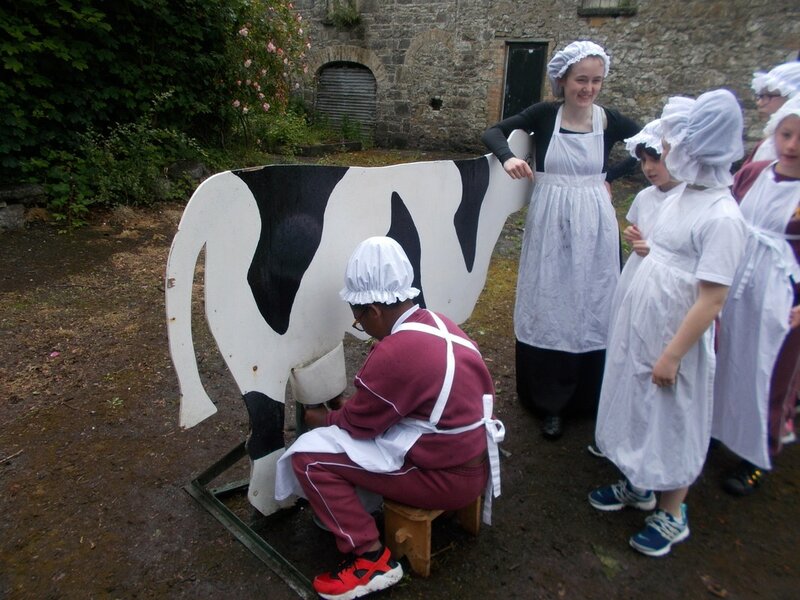 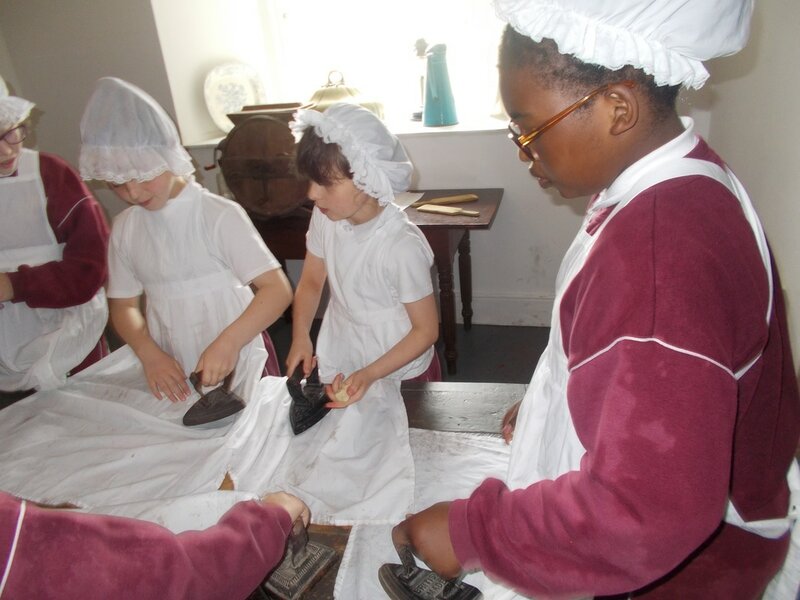 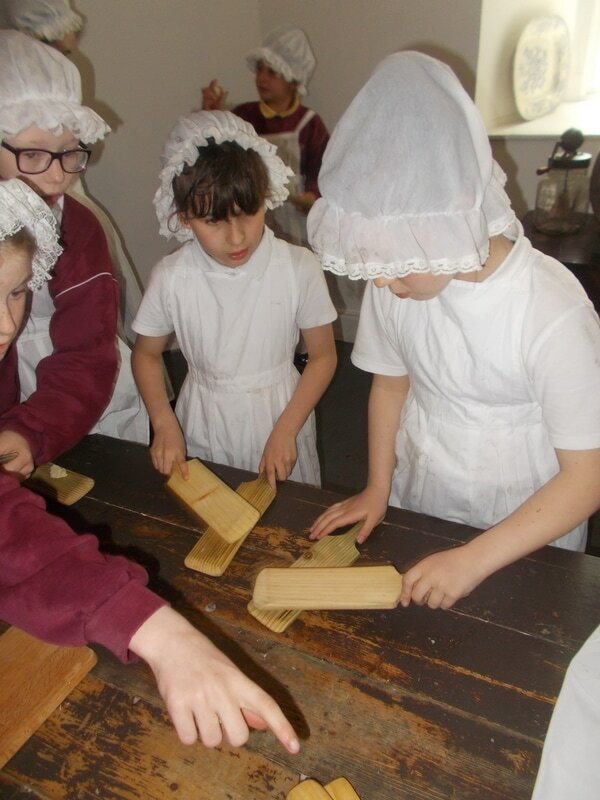 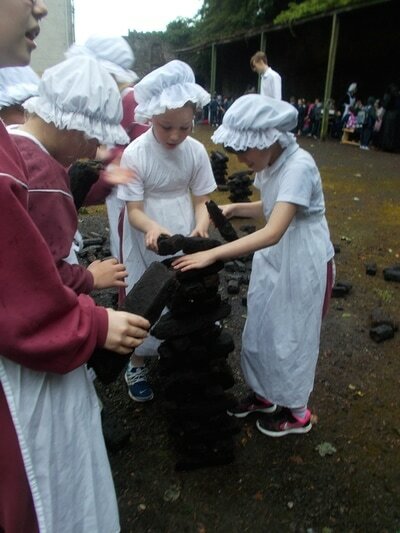 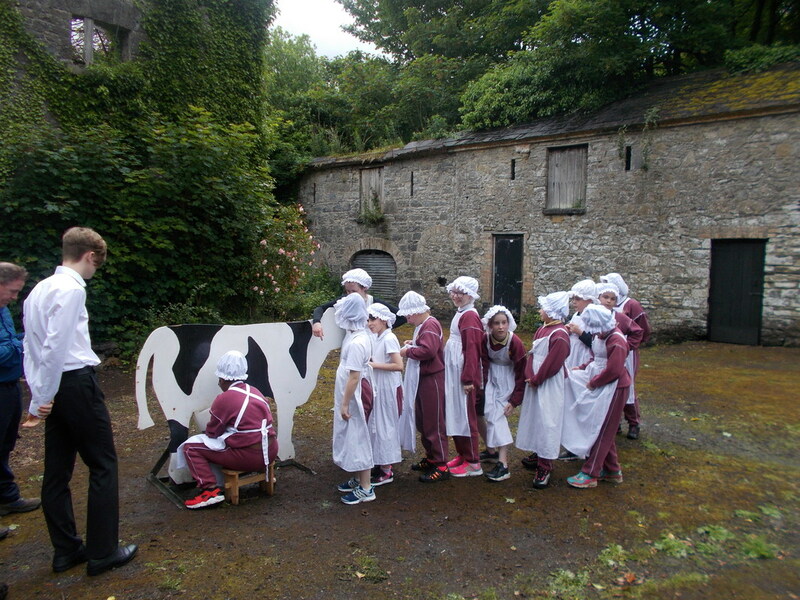 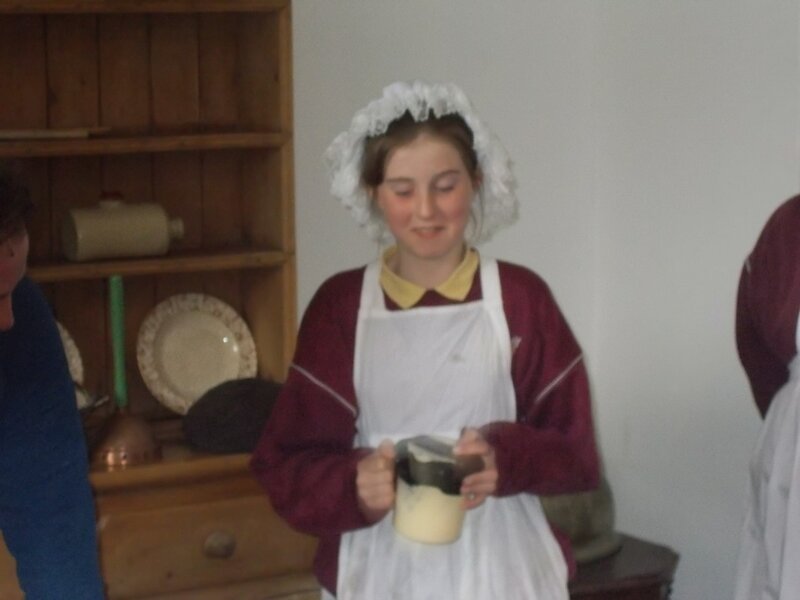 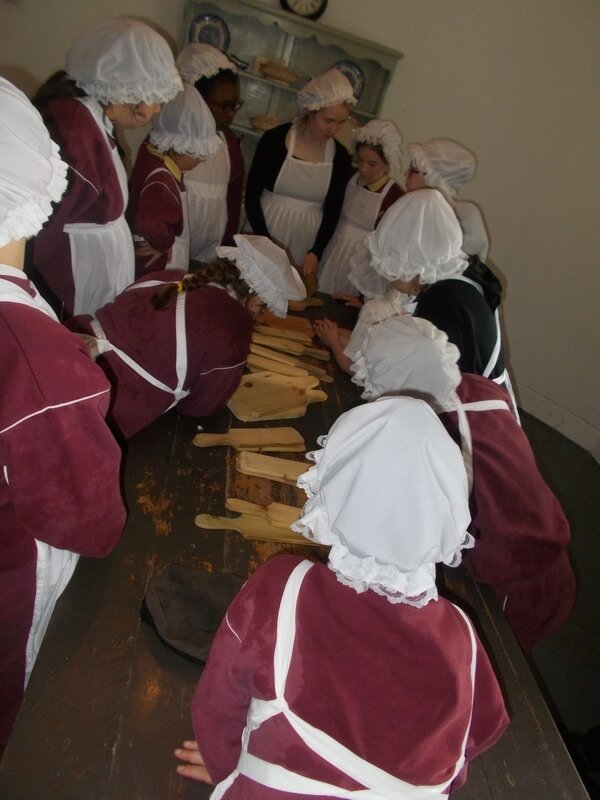 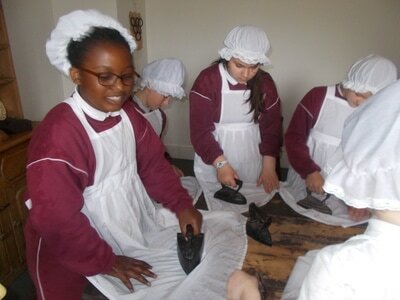 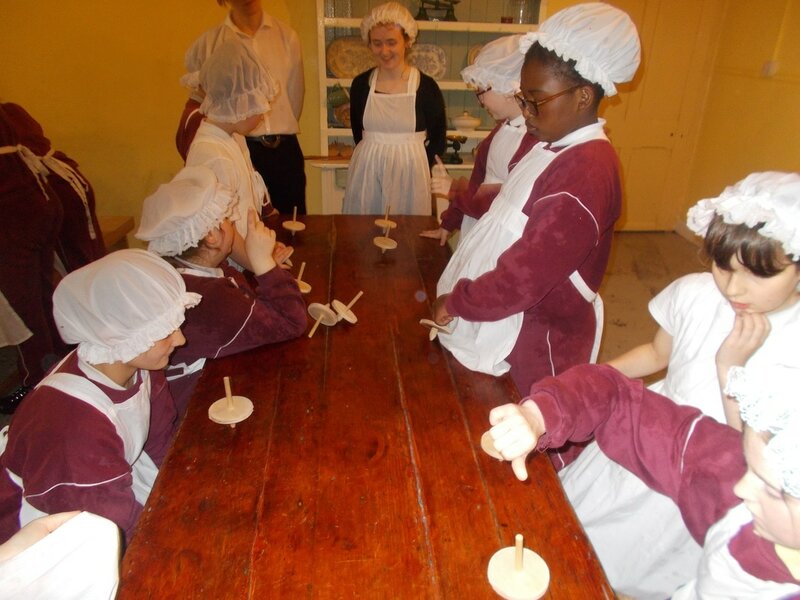 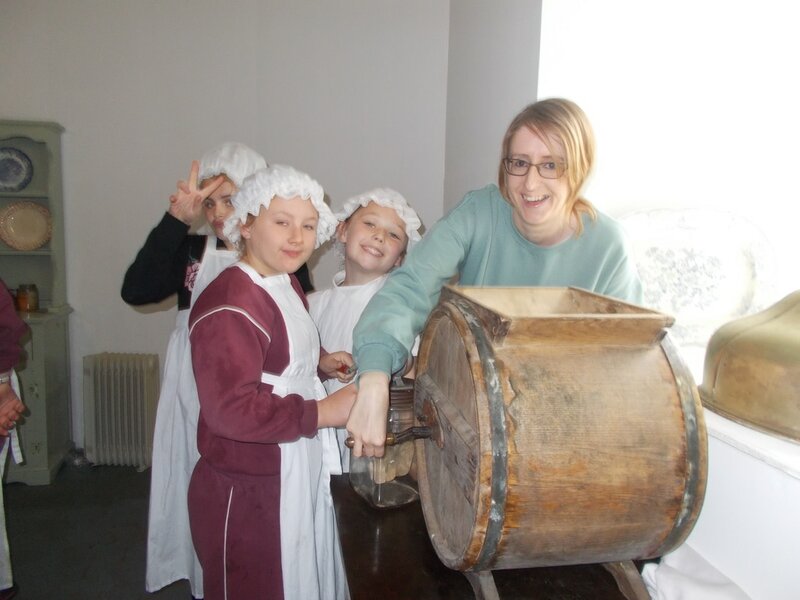 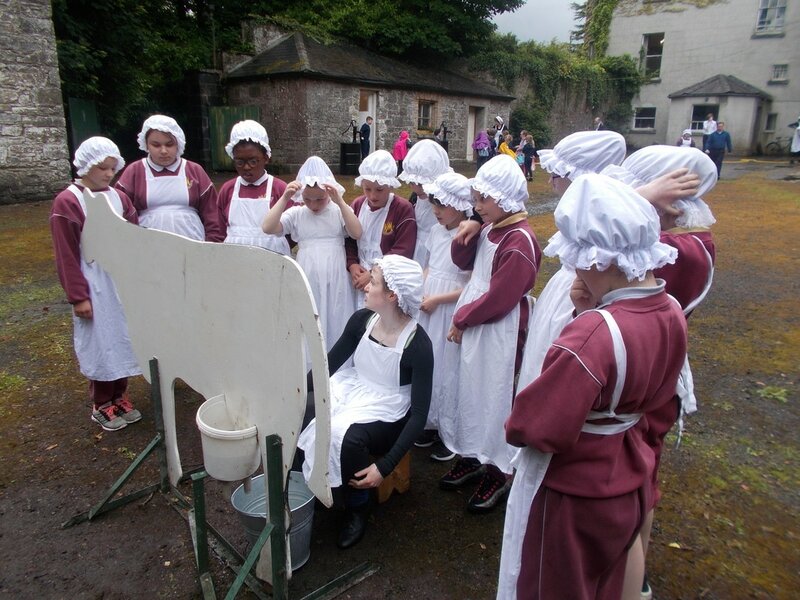 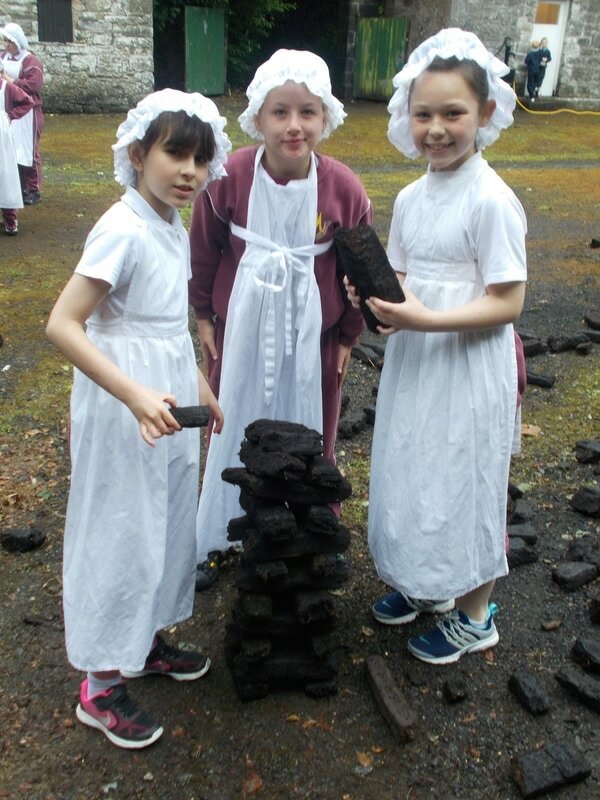 Here we got the chance to be ladies of the house and the help, as well as taking part in some fun activities like making butter, milking the cows and much more. 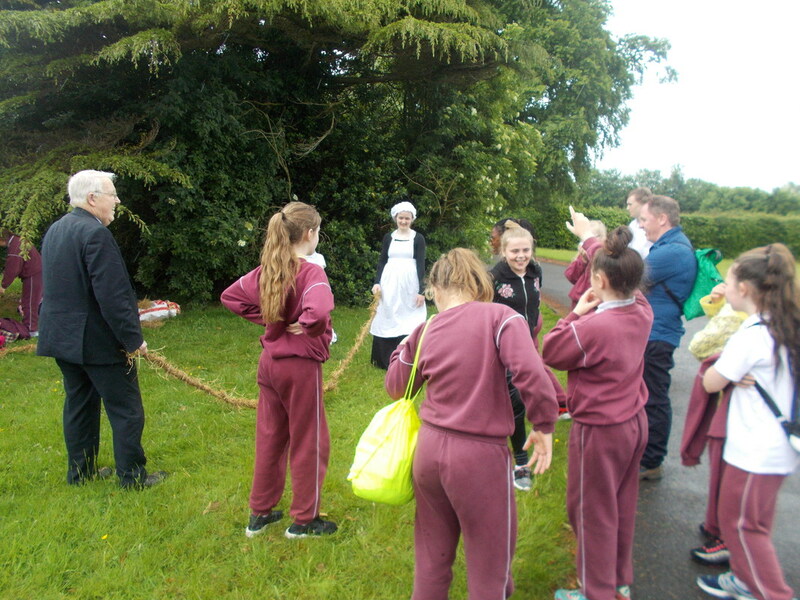 A huge thank you to Mr O Donovan who accompanied us on the day. 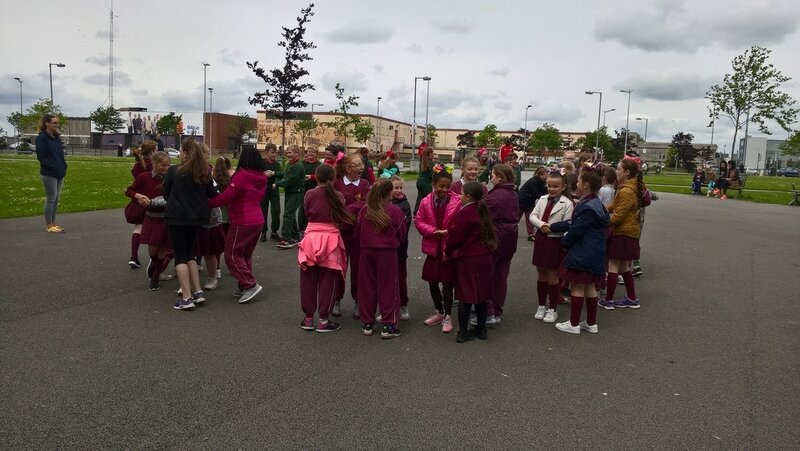 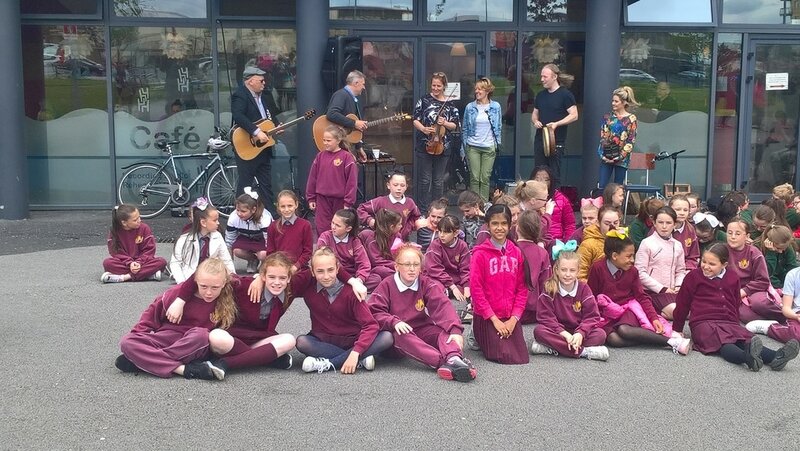 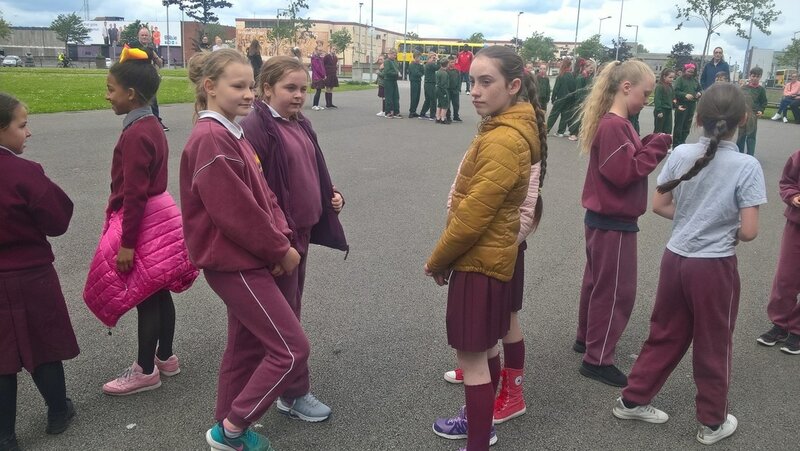 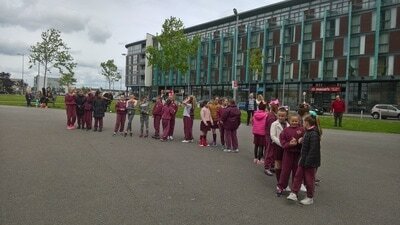 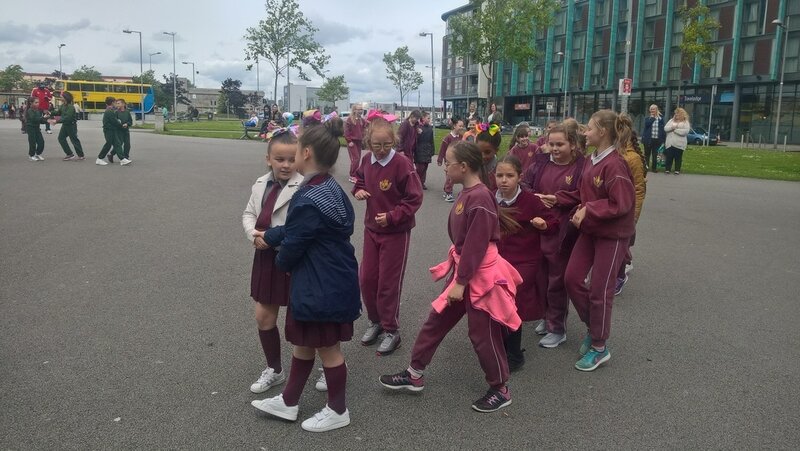 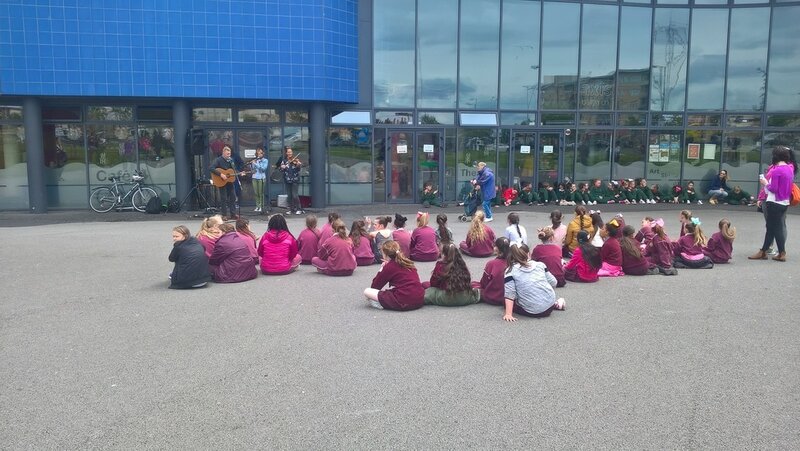 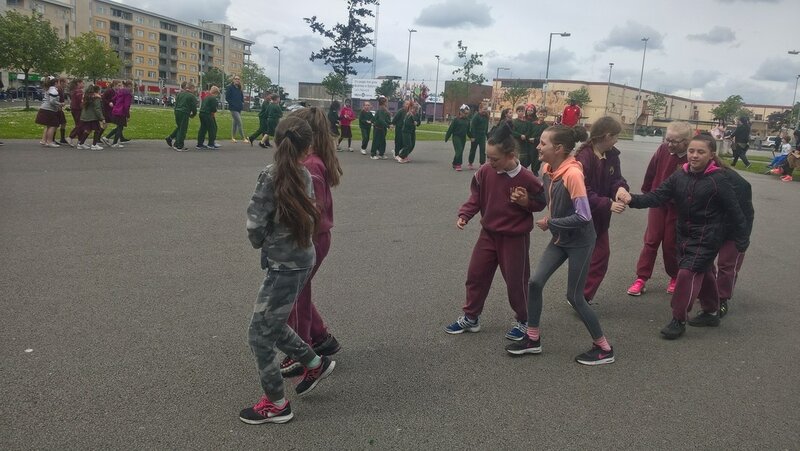 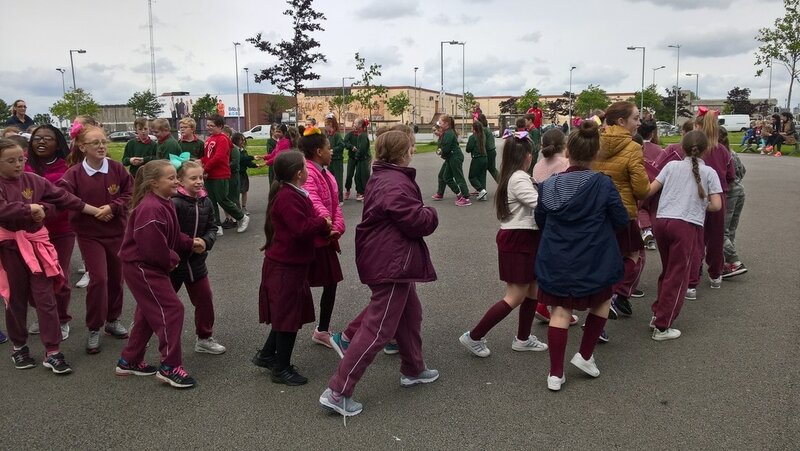 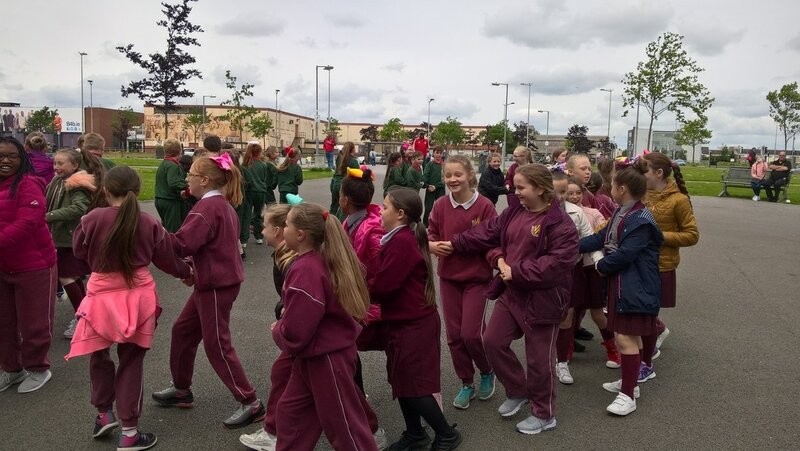 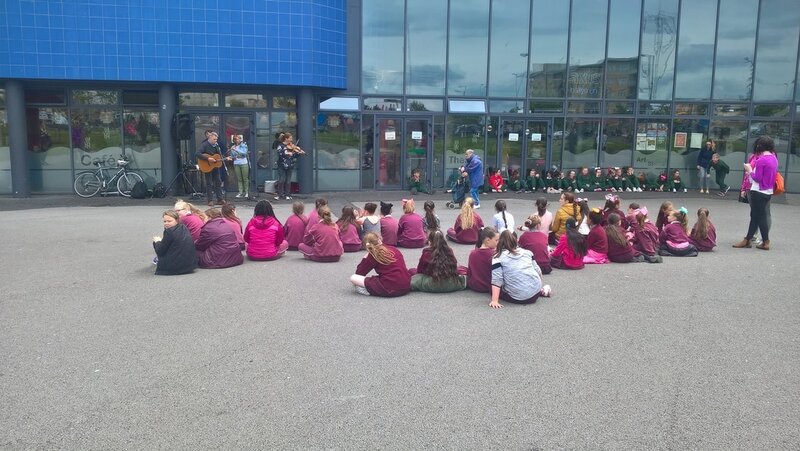 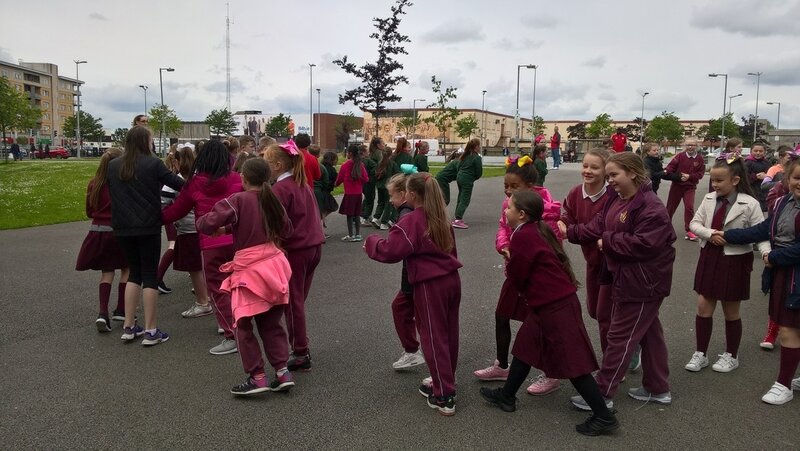 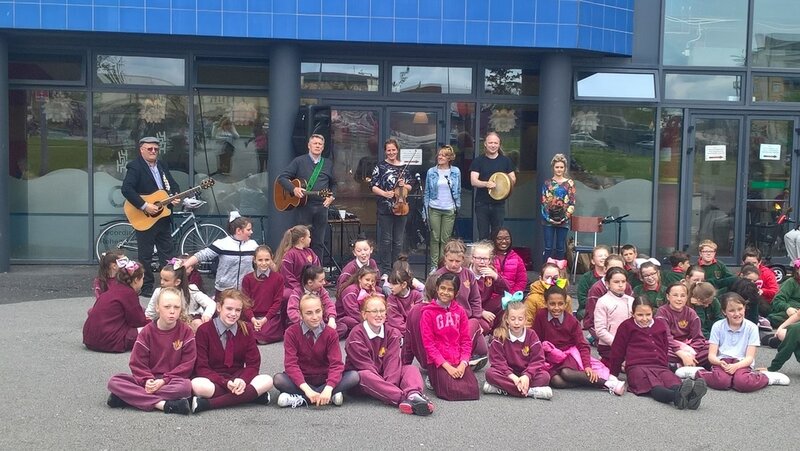 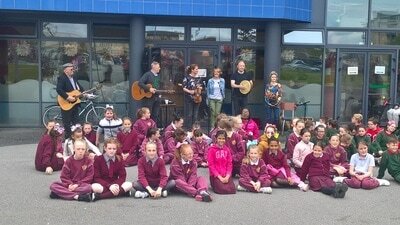 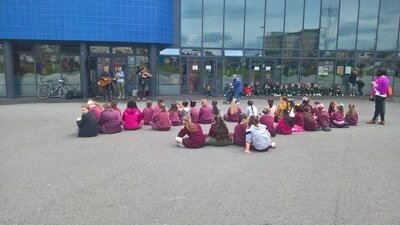 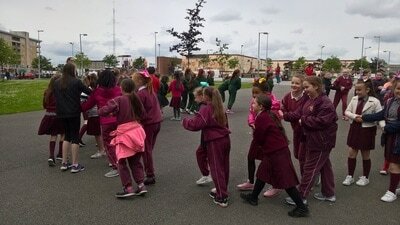 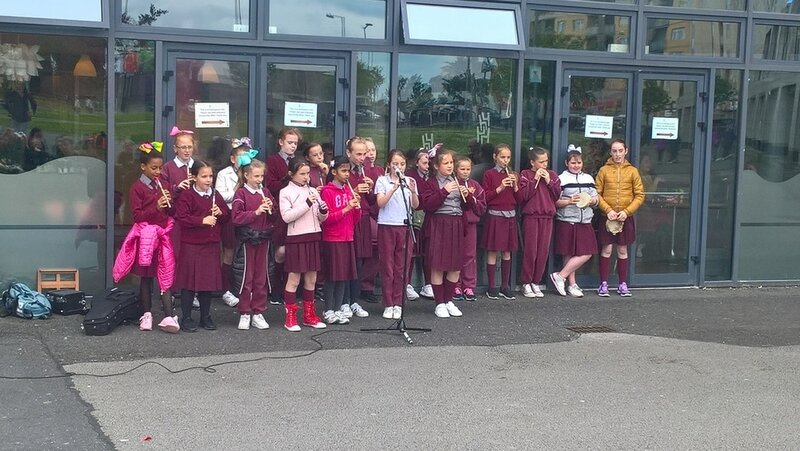 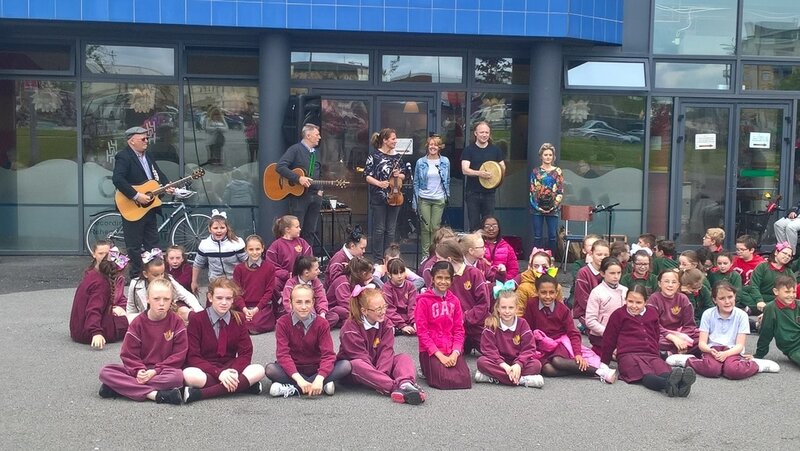 The girls in 4th and 5th classes were very lucky to be invited to a very special event in Ballymun, the 'céilí on the plaza'. 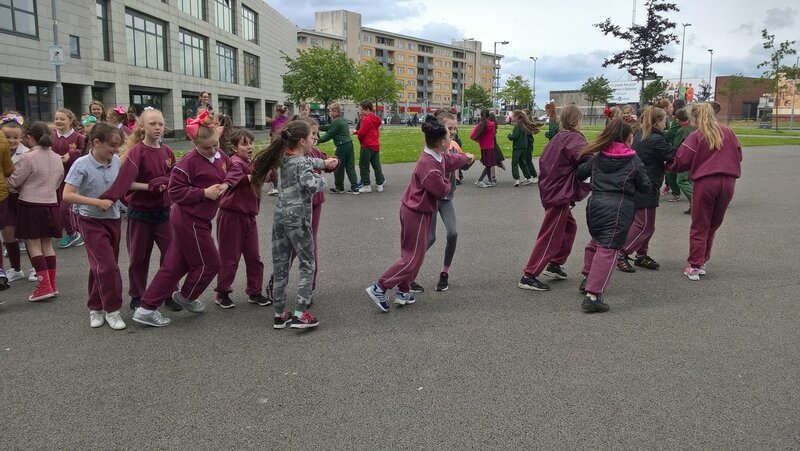 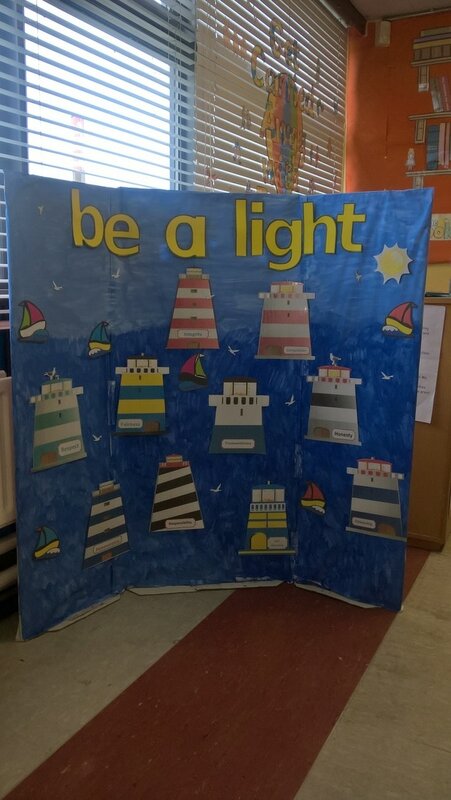 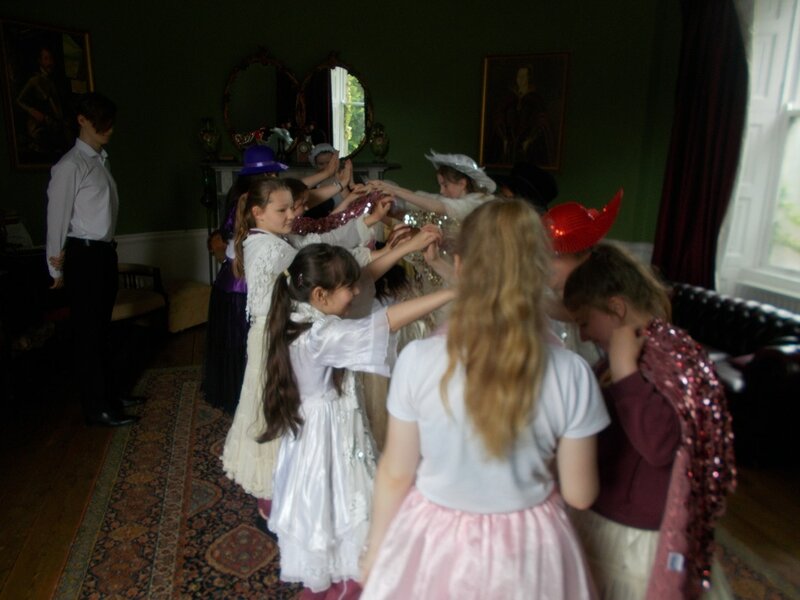 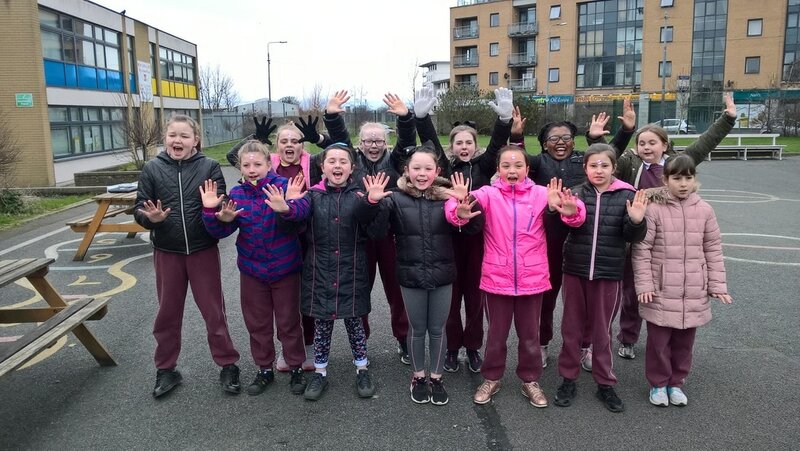 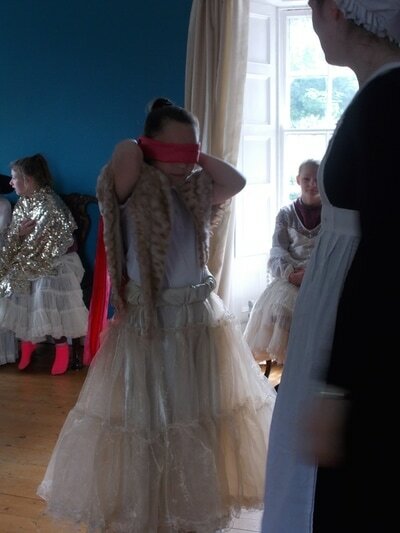 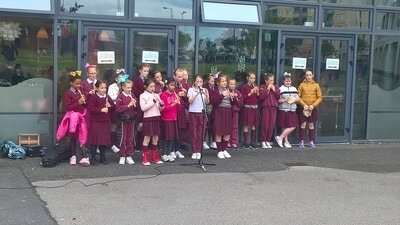 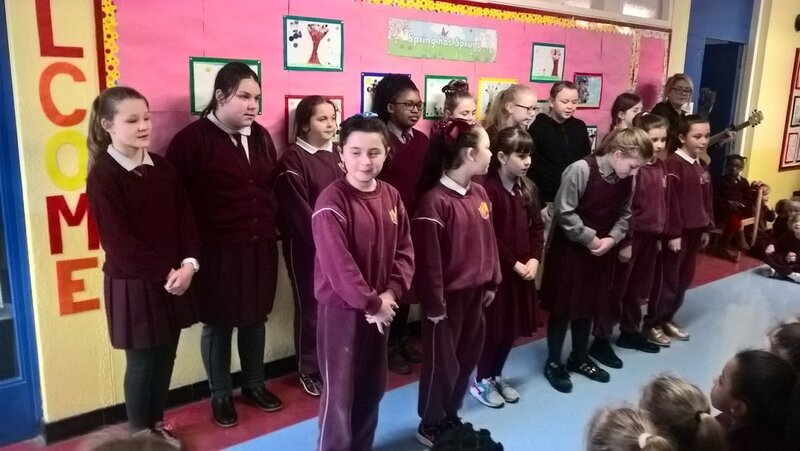 Both classes took part in a number of dances along with children from Gaelscoil Baile Munna, whilst also performing a number of songs on the day. 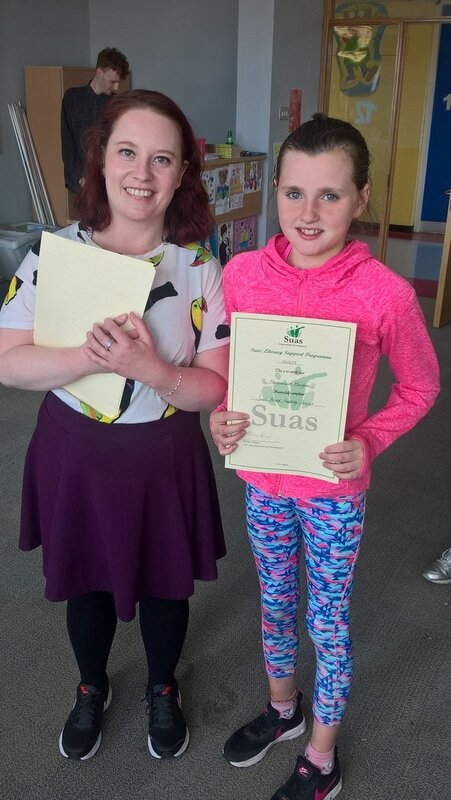 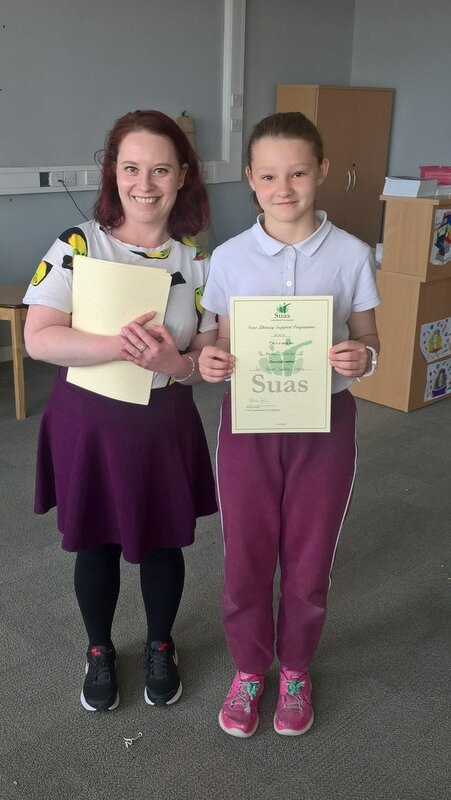 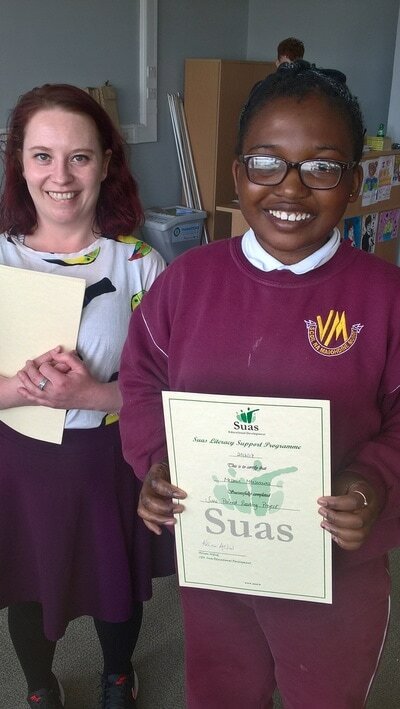 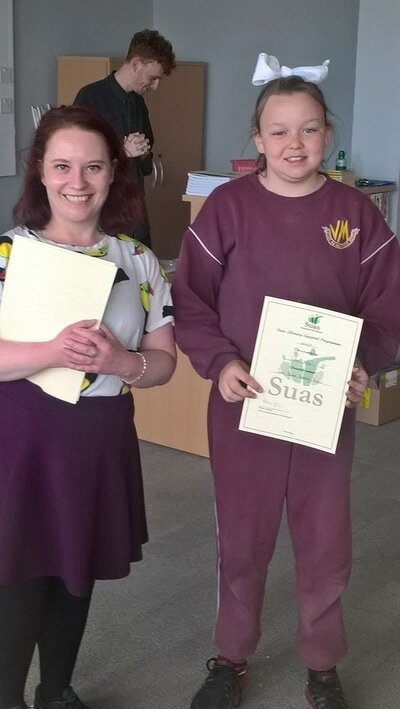 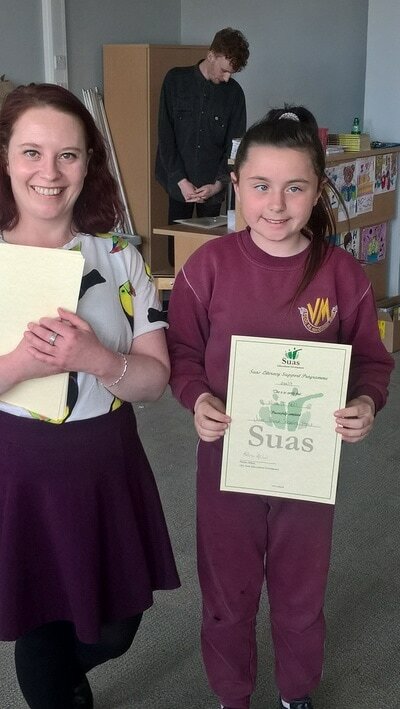 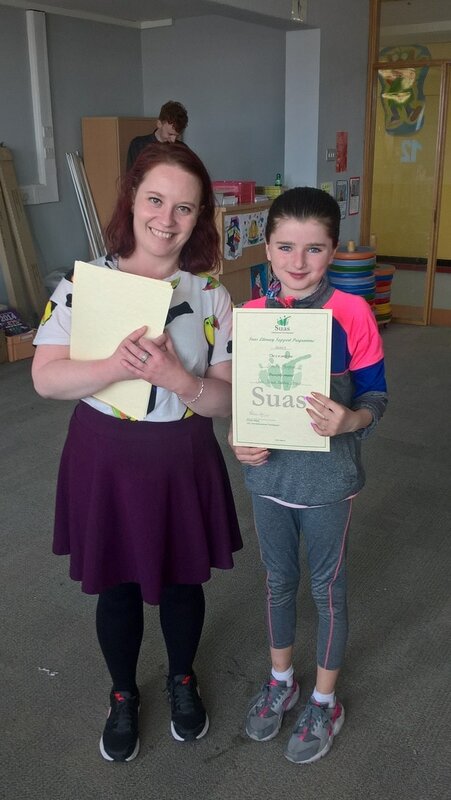 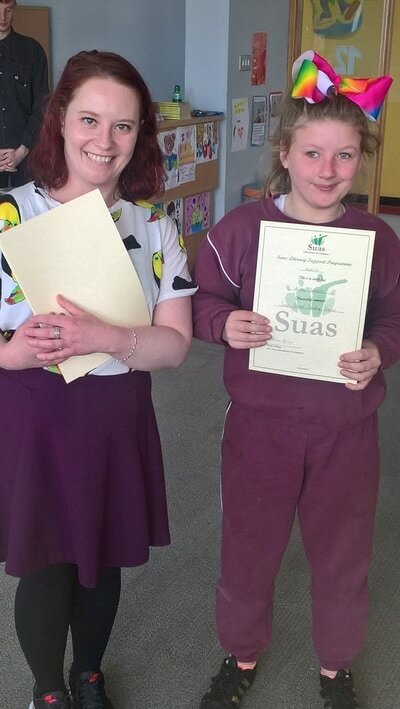 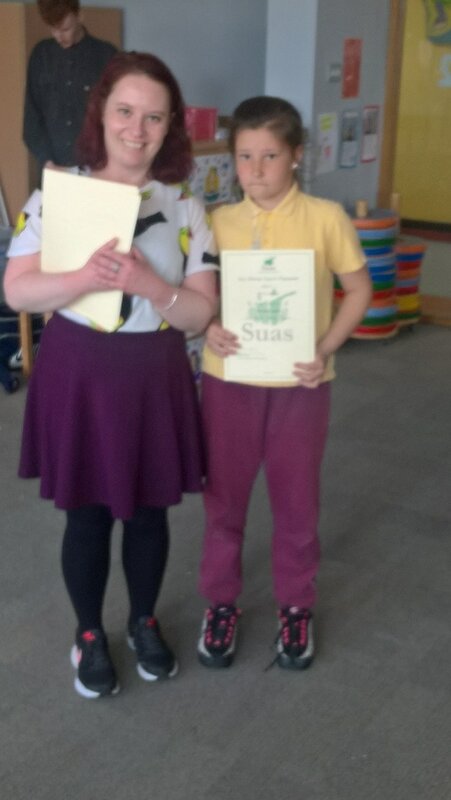 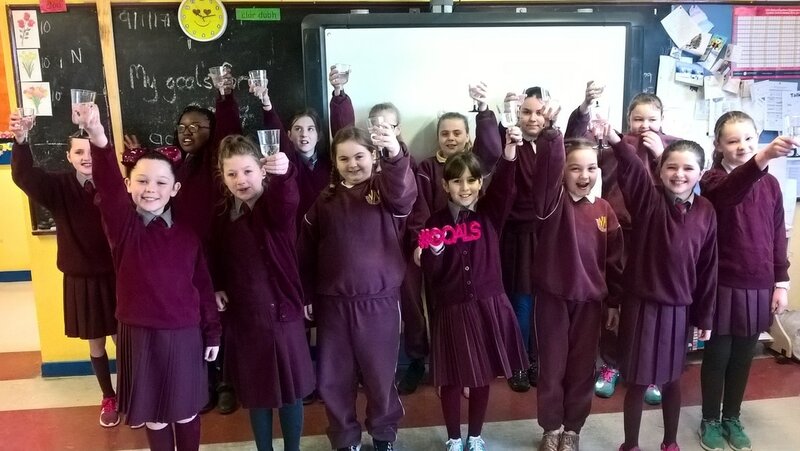 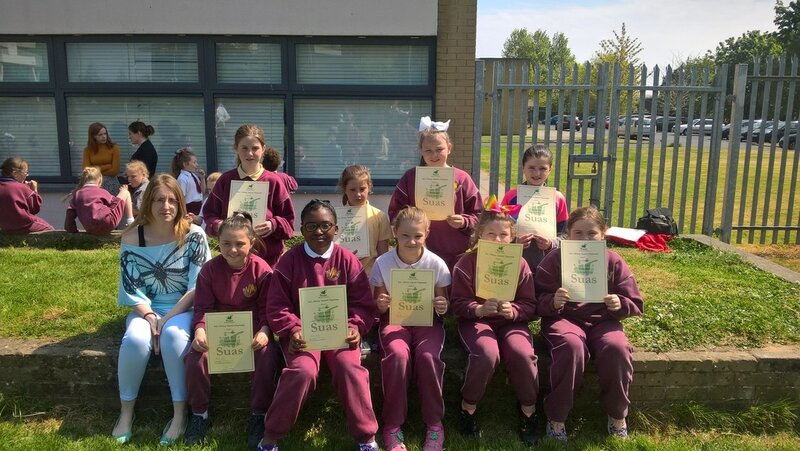 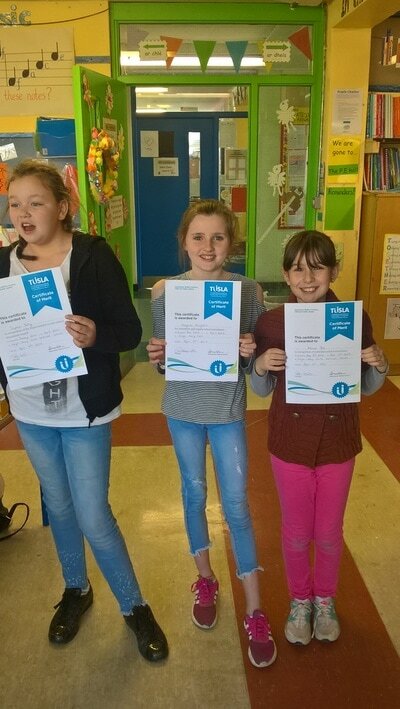 Well done to the girls in 3rd, 4th and 5th class, who graduated from the '16/'17 SUAS programme. 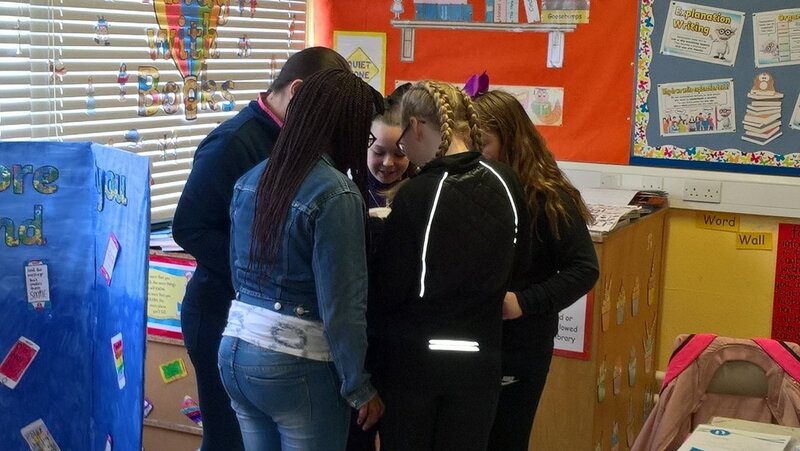 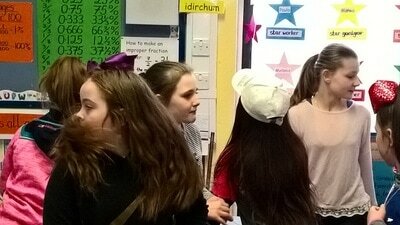 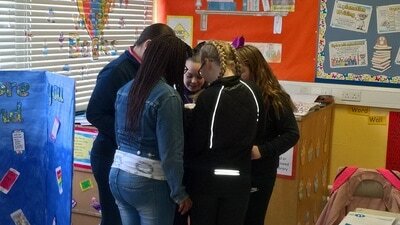 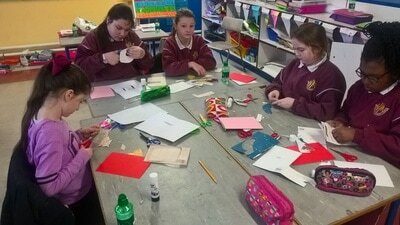 The girls took part in weekly paired reading sessions with volunteers from DCU. They really enjoyed the experience. We held a graduation ceremony in our school library and the girls received a lovely certificate for taking part in the programme. The mobile farm paid a visit to our school. 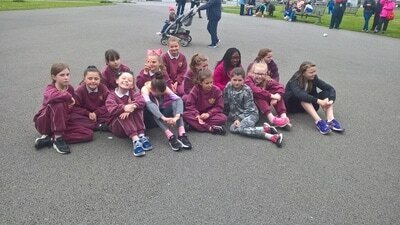 We saw lots of different animals including lambs, ducklings, hens and rabbits, and we were able to pet and hold them. 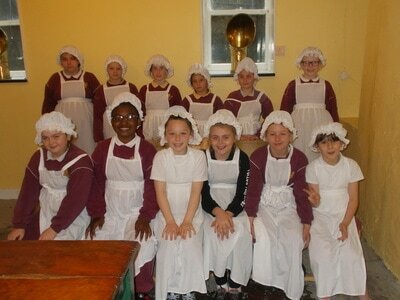 Some of us were even inspired to invest in a new pet rabbit or guinea pig!! 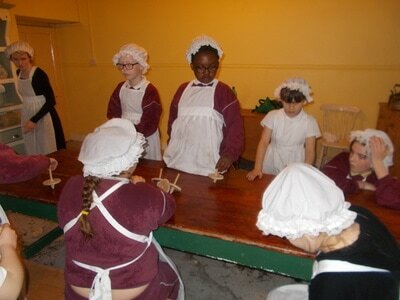 Have a look at how we got on. 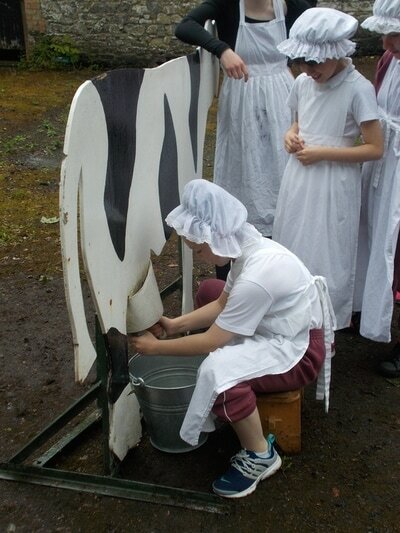 How many different kinds of farm animals can you name? ​ May is the month of Mary. 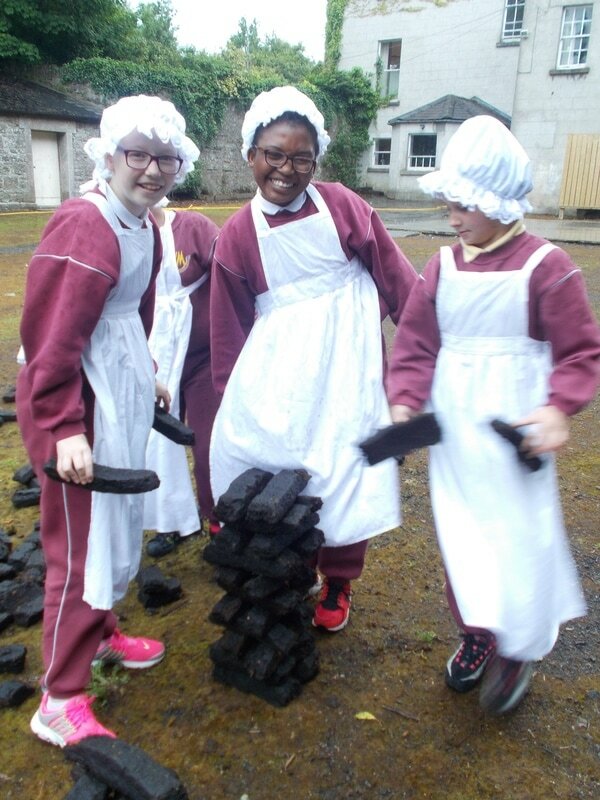 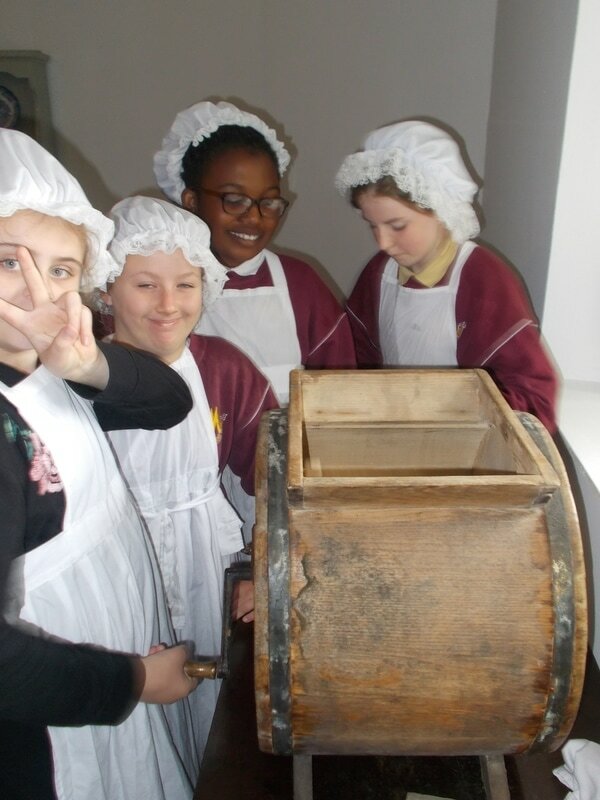 Fifth class girls took a trip to Kilmainham Gaol to learn all about the history of the jail and the leaders of the rebellions, who were imprisoned and executed there. We got to see some of the cells in which they were kept as well as the different wings and structures of the building. 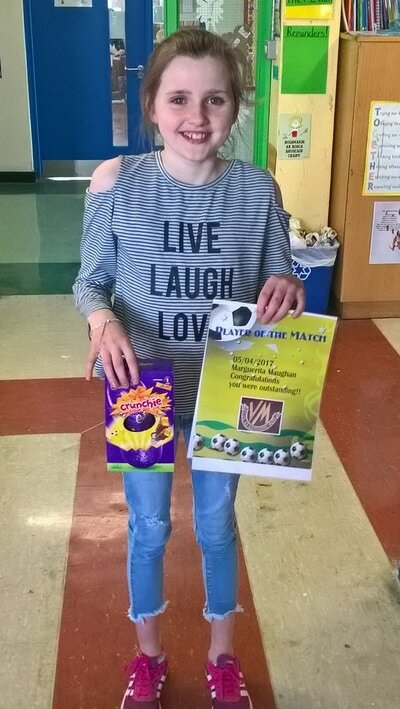 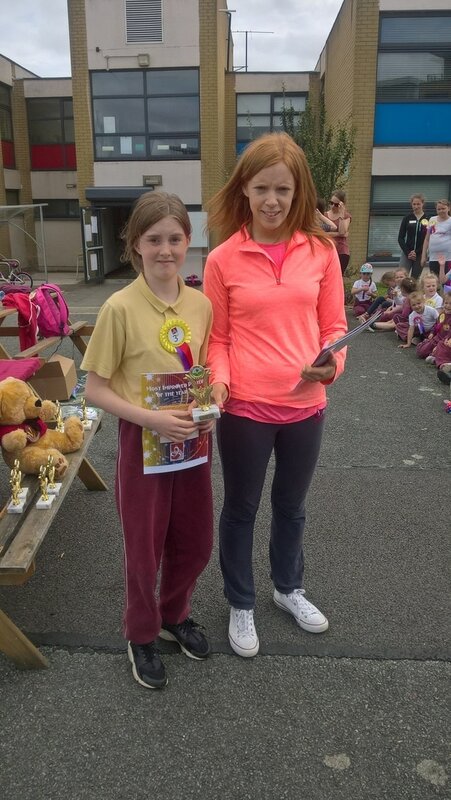 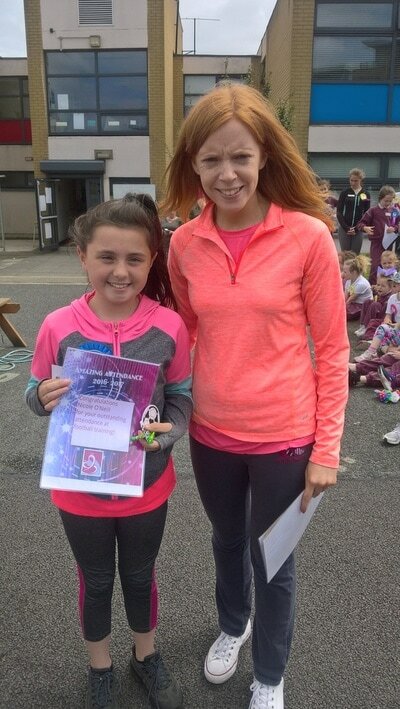 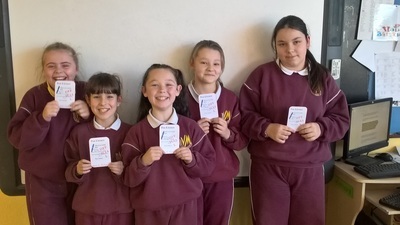 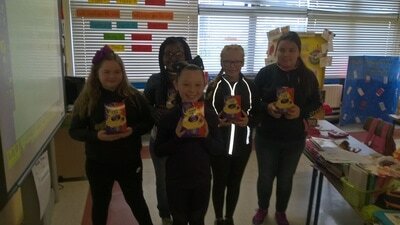 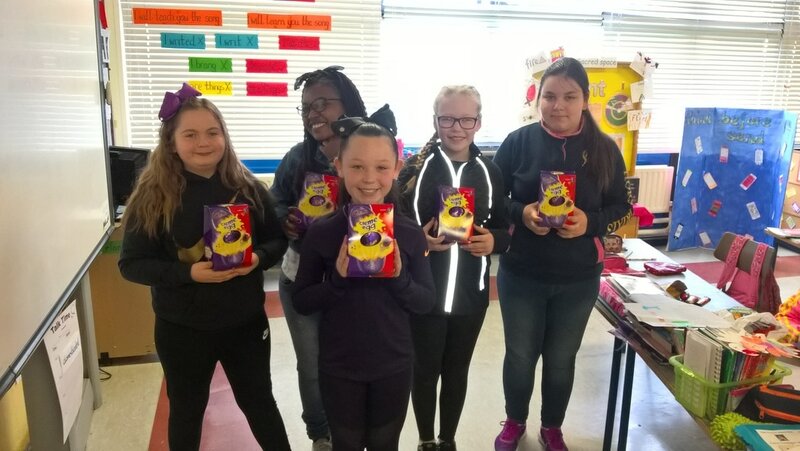 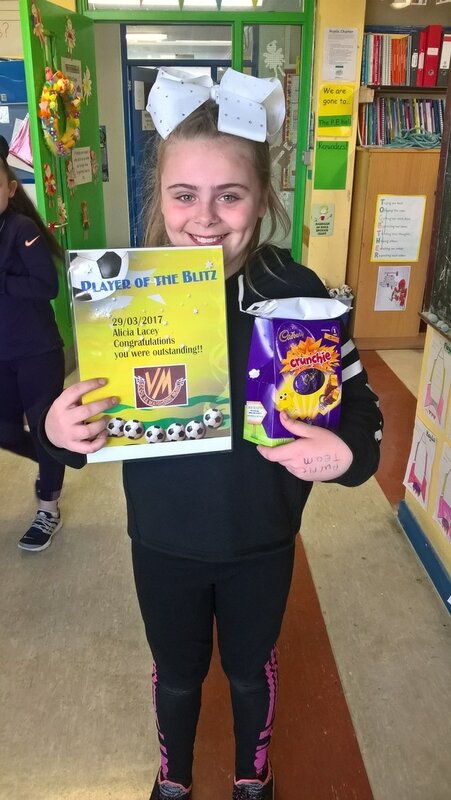 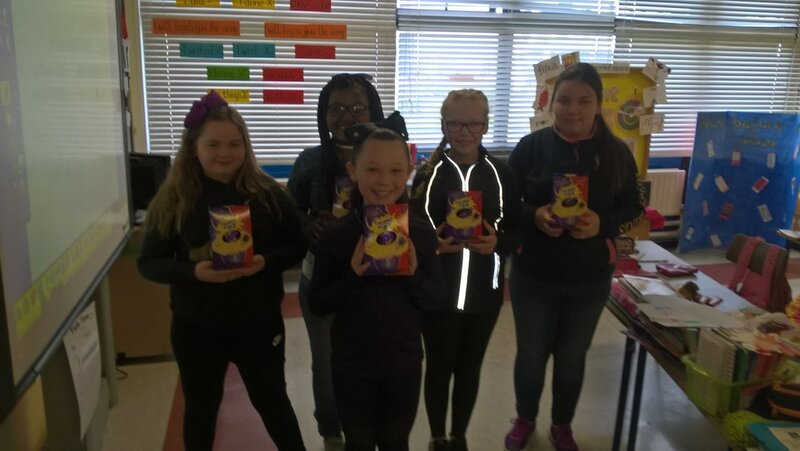 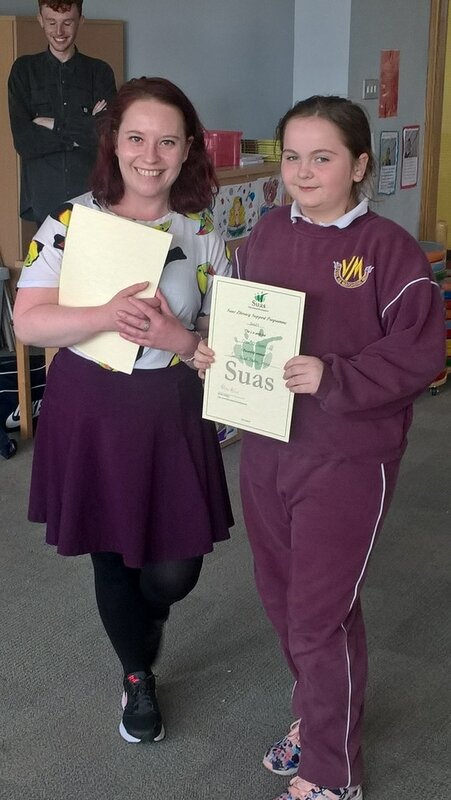 We had a number of prize winners at Easter for a range of different areas of improvement and achievement including spelling, attendance, soccer and Gaelic football. Well done to all girls involved. Keep up the good work! 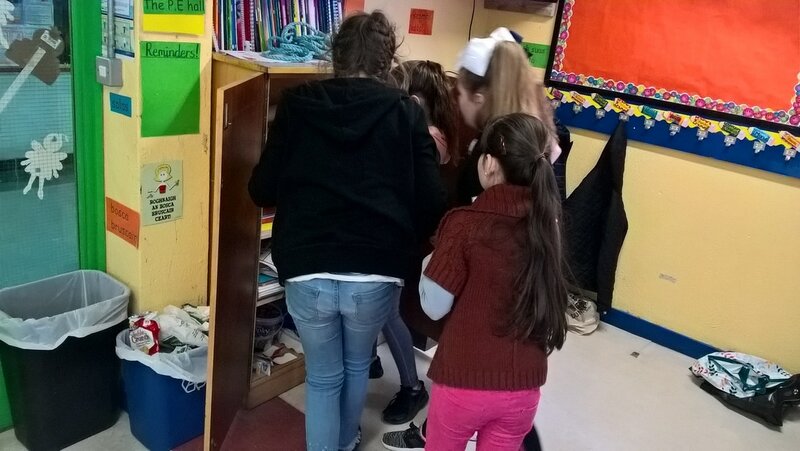 Easter wouldn't be Easter without an Easter egg hunt. 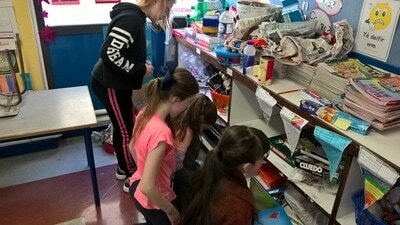 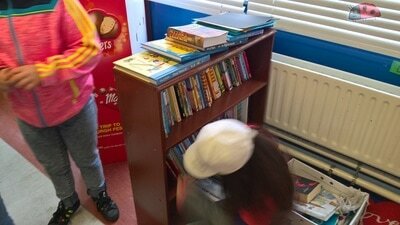 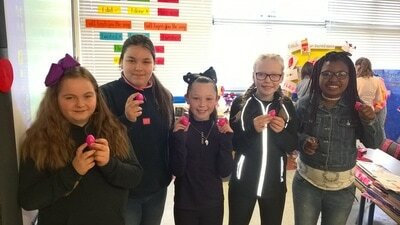 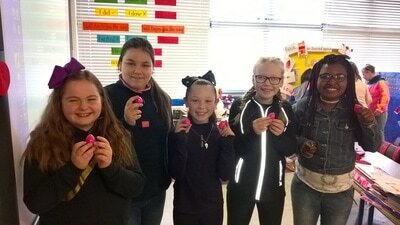 And we in 5th class had a fun Easter egg hunt on our last day of school before breaking up for the Easter holidays. 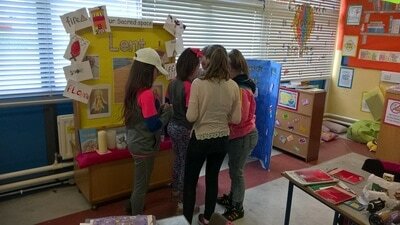 We divided up into three teams, but it was the pink team who were victorious on the day. Our history lesson took us back in time to the Renaissance. 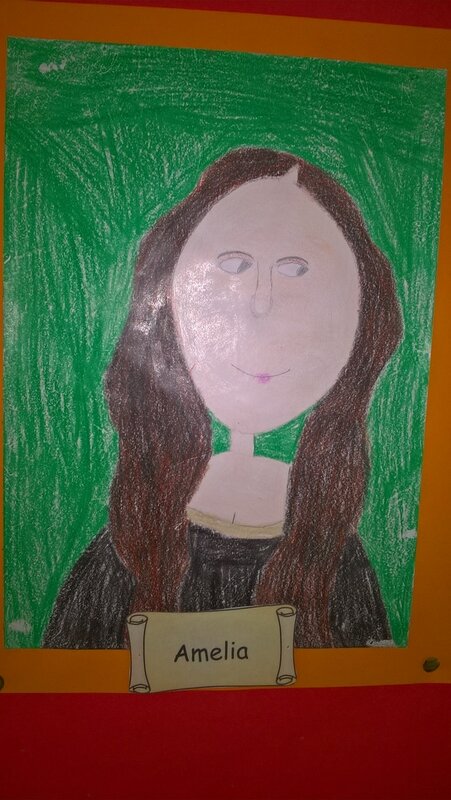 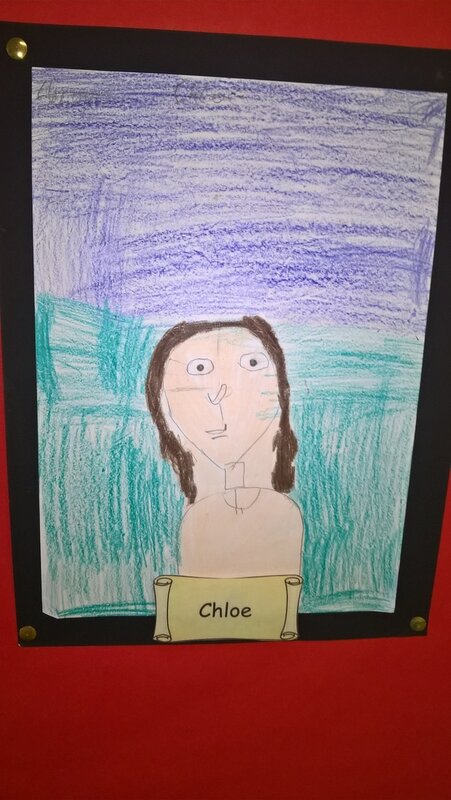 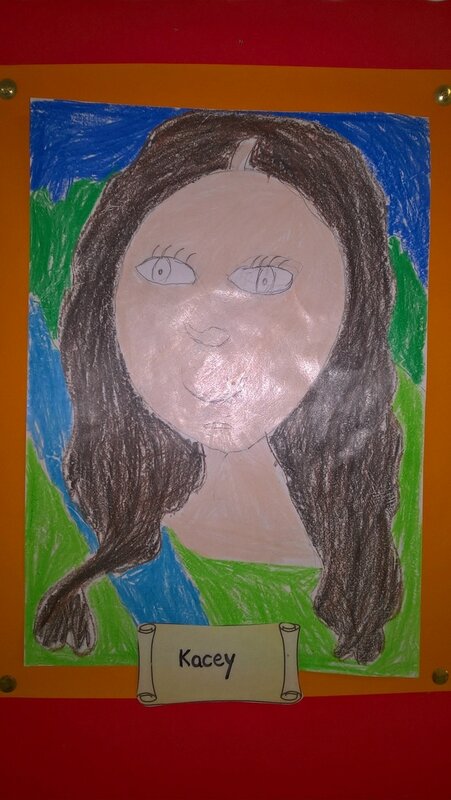 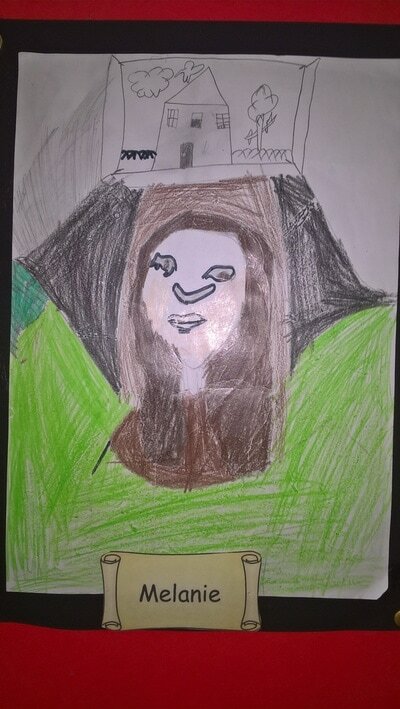 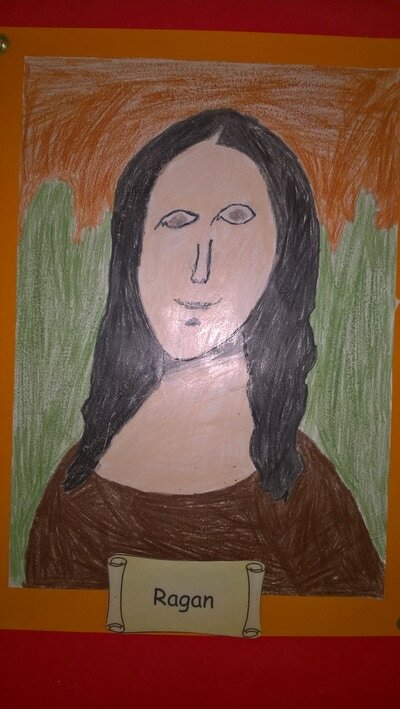 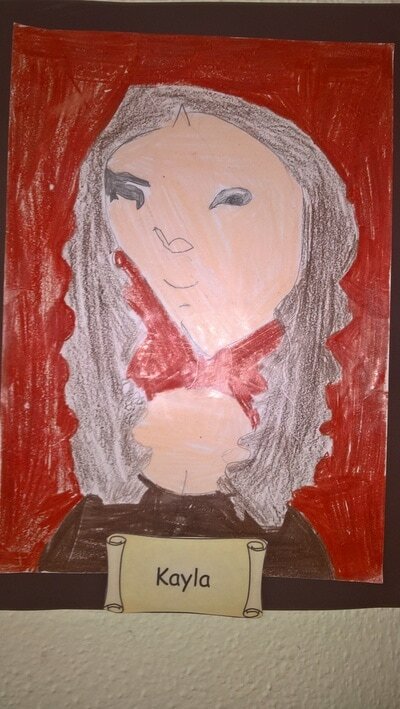 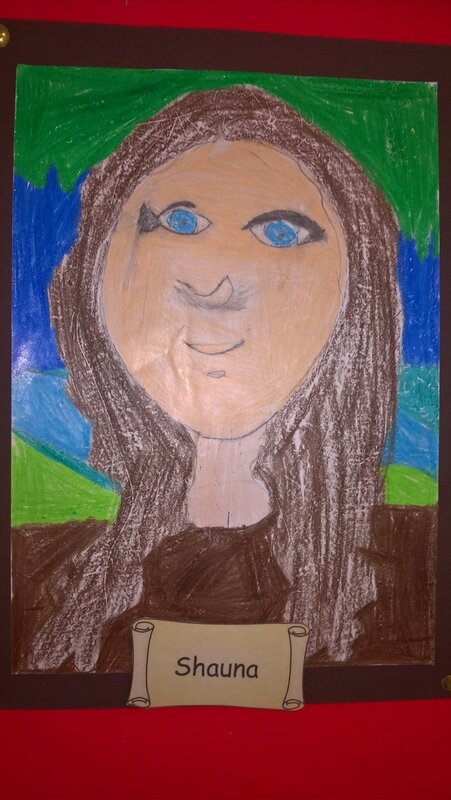 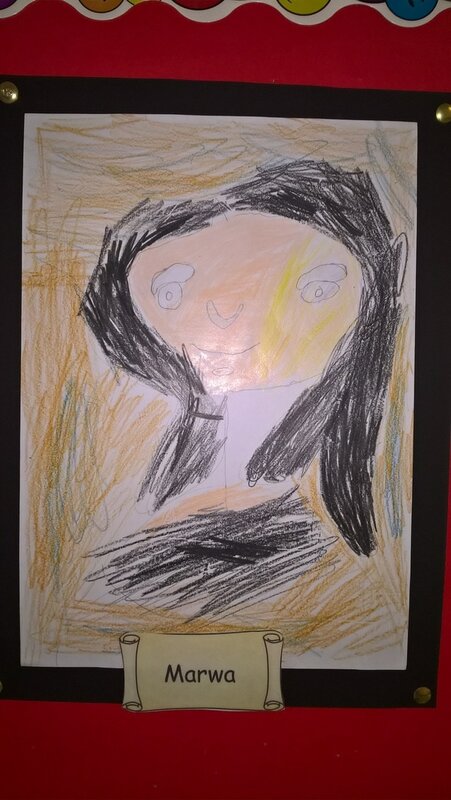 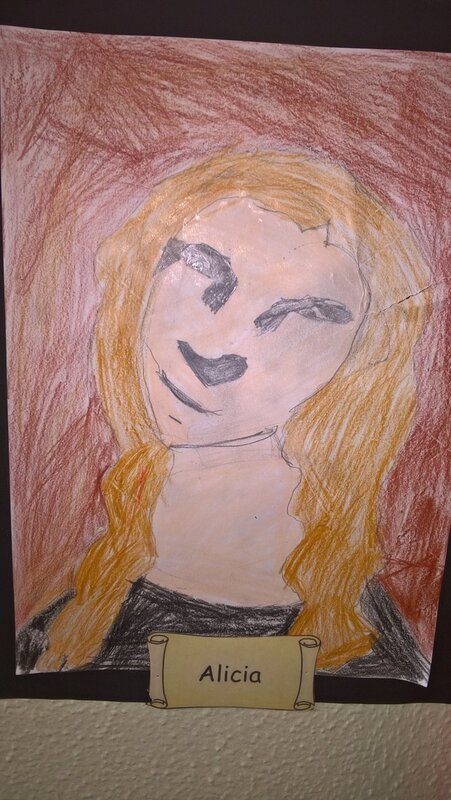 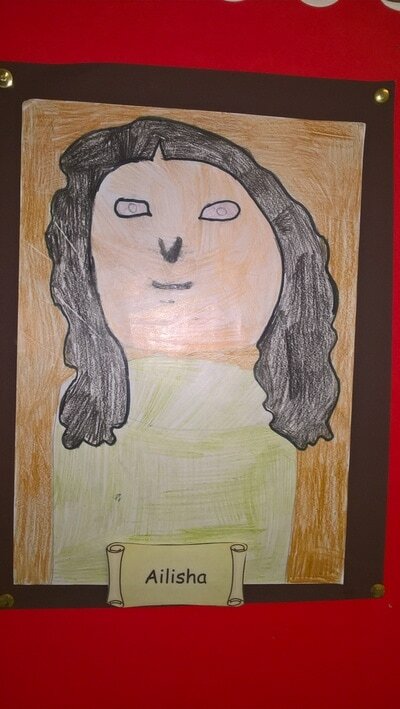 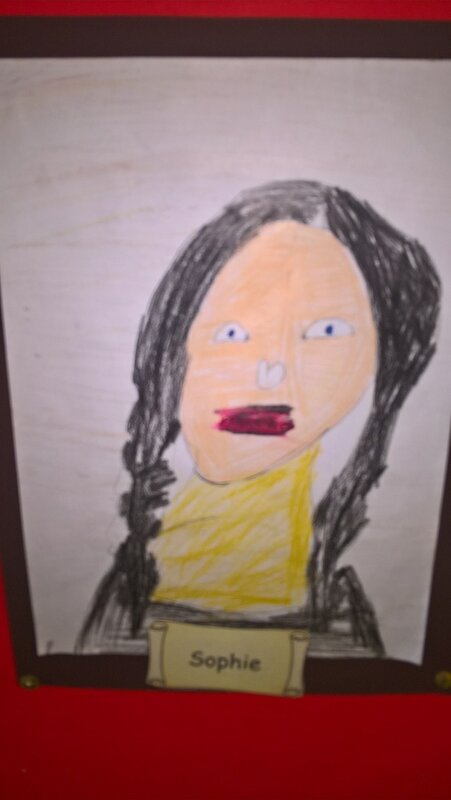 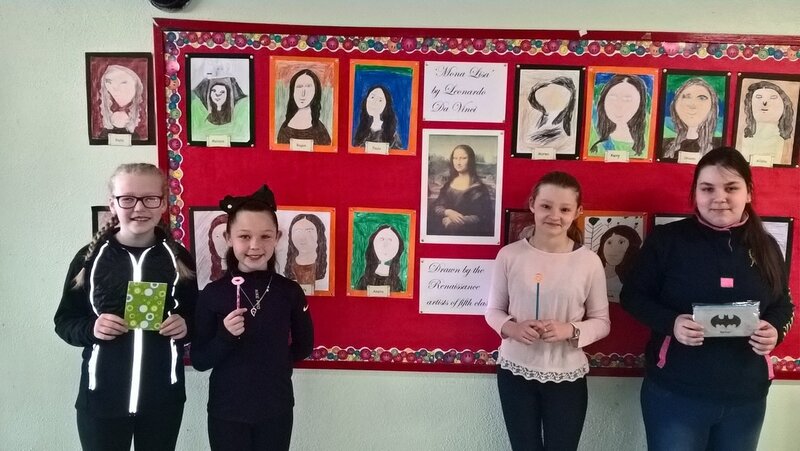 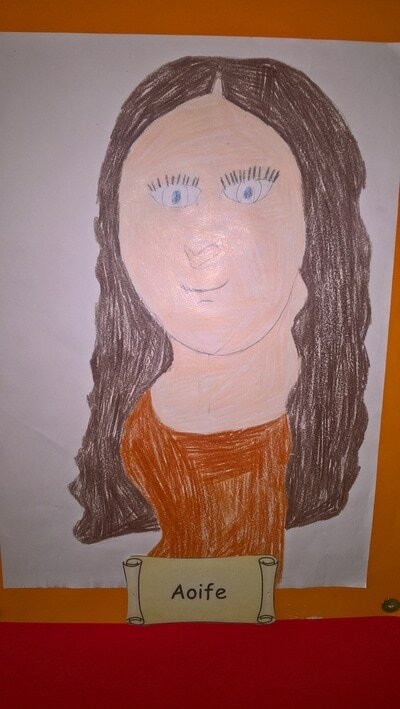 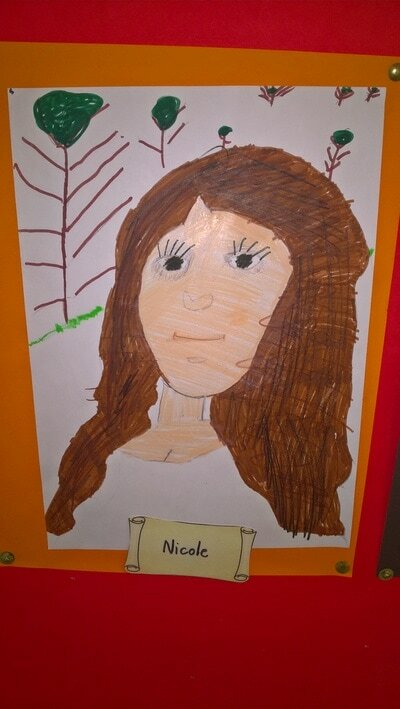 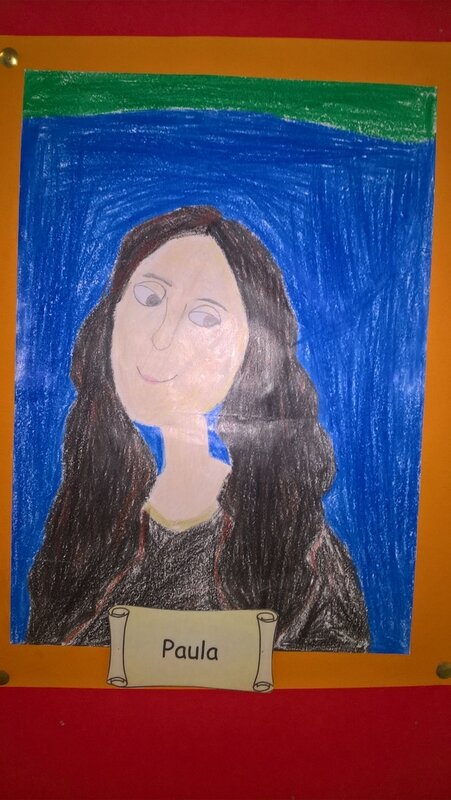 Having looked at specific paintings and the techniques used by renaissance artists, we created our very own personal interpretations of the 'Mona Lisa' by Leonardo Da Vinci. We held a 'best drawing' competition using a copy of the original painting as a guide. 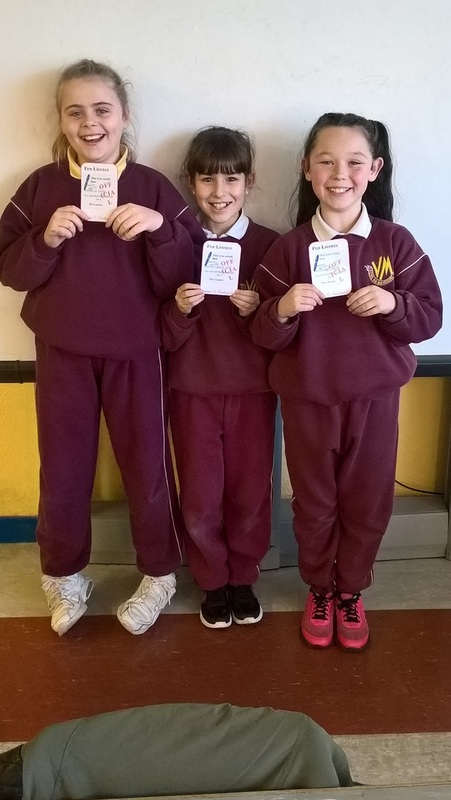 In first place was Ragan, in second place was Paula, and in joined third place were Aoife and Amelia. 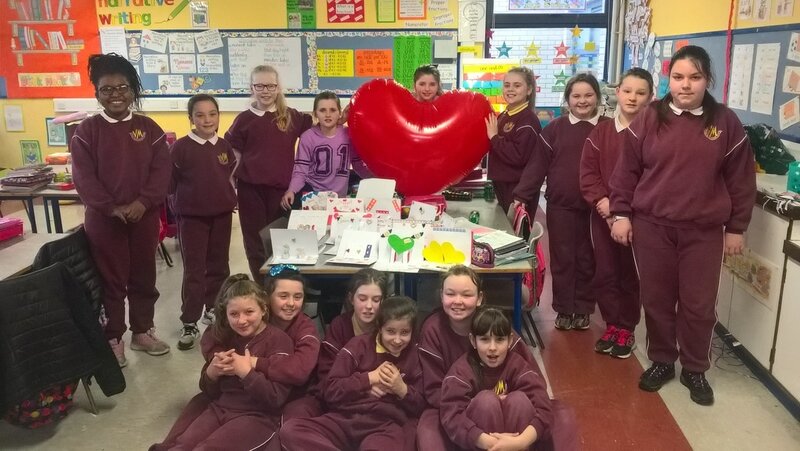 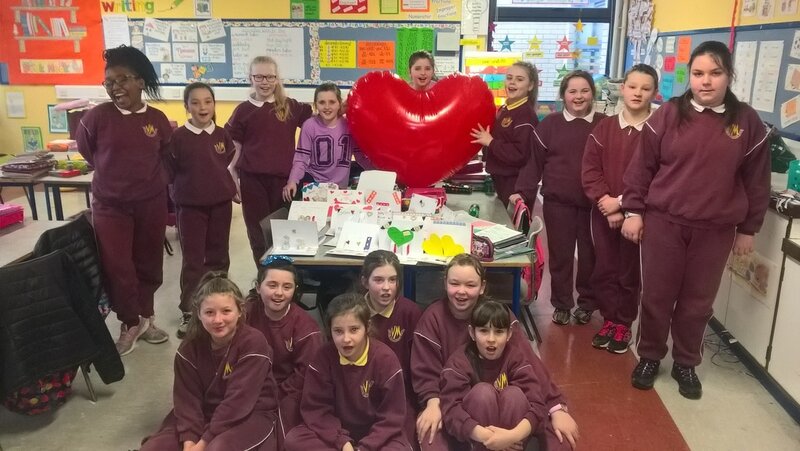 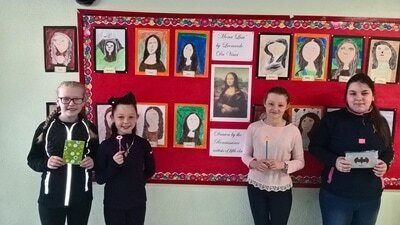 Well done to all the girls in 5th class for their brilliant drawings. 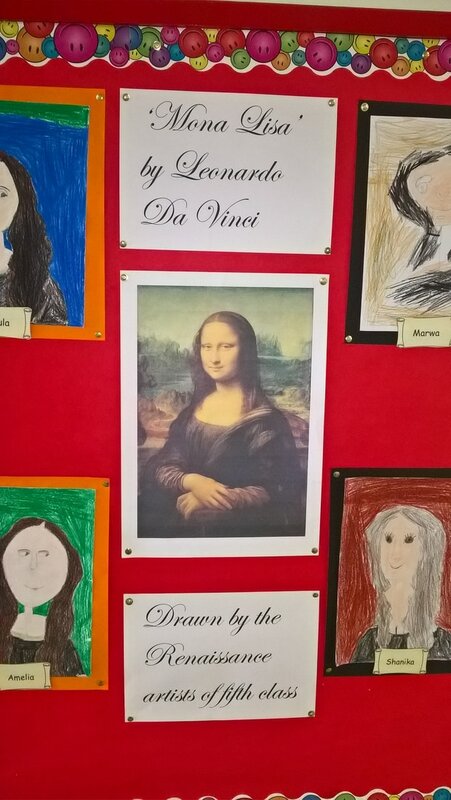 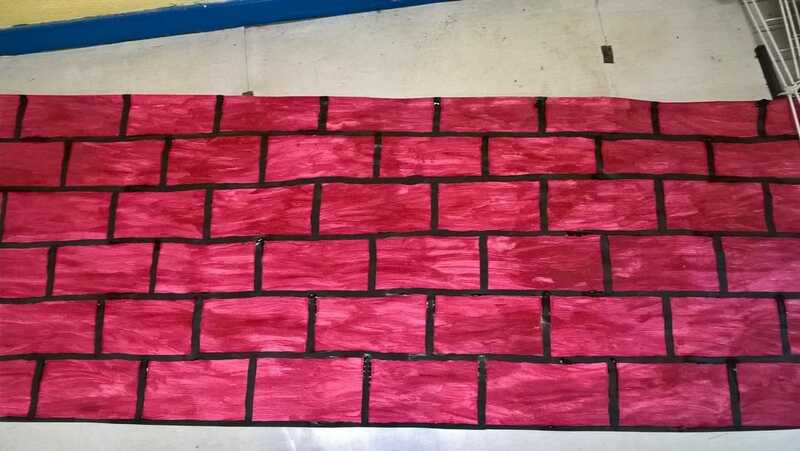 View this fantastic work in our 5th class artist gallery below. As part of our P.E lesson, we had fun trying out some different gymnastics moves. A very big thank you to Miss Shaughnessy for coming along to help us out. Take a look at how we got on. 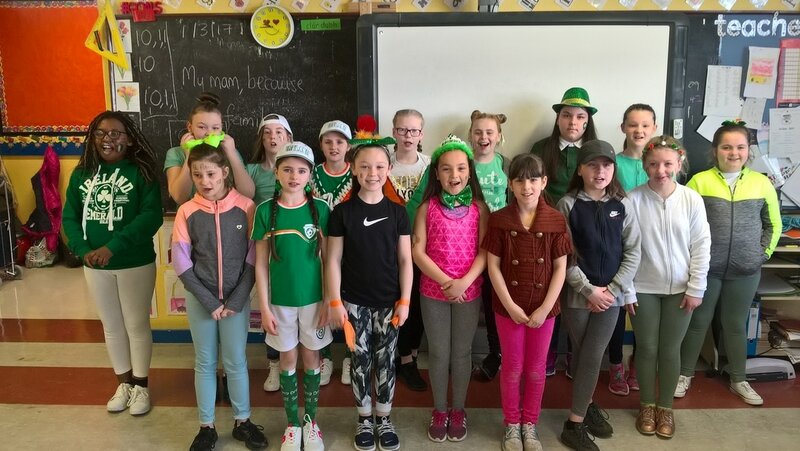 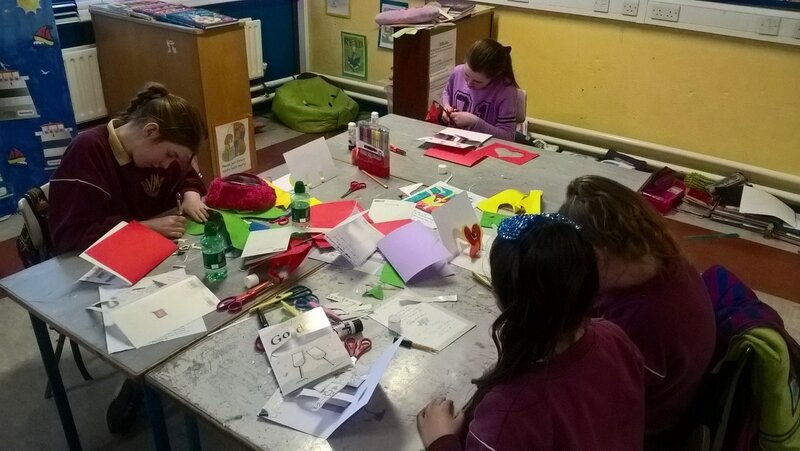 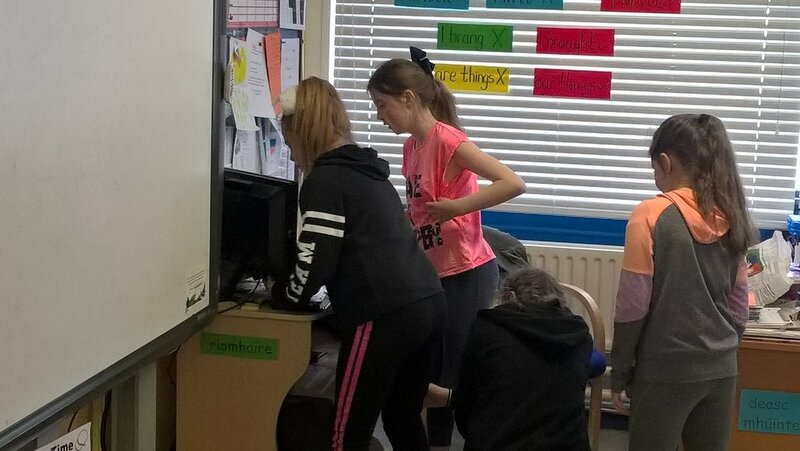 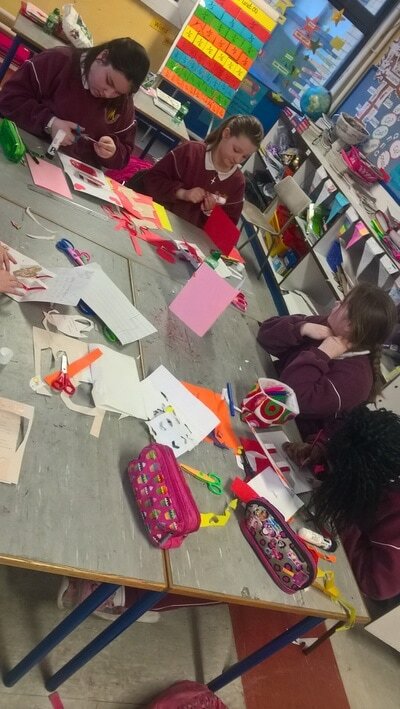 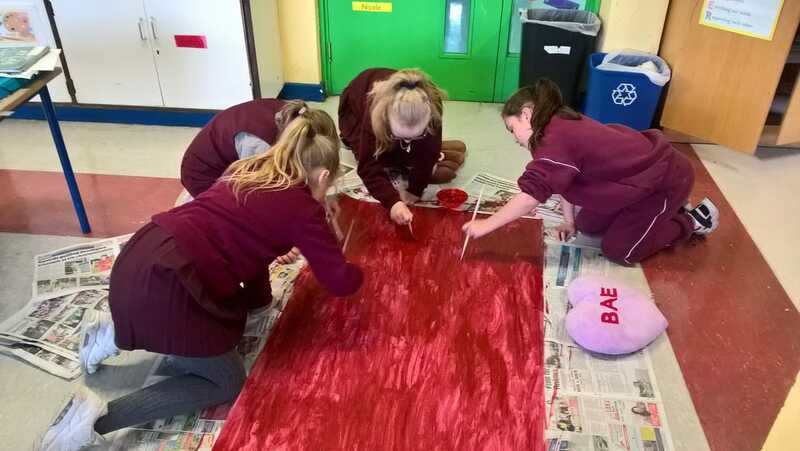 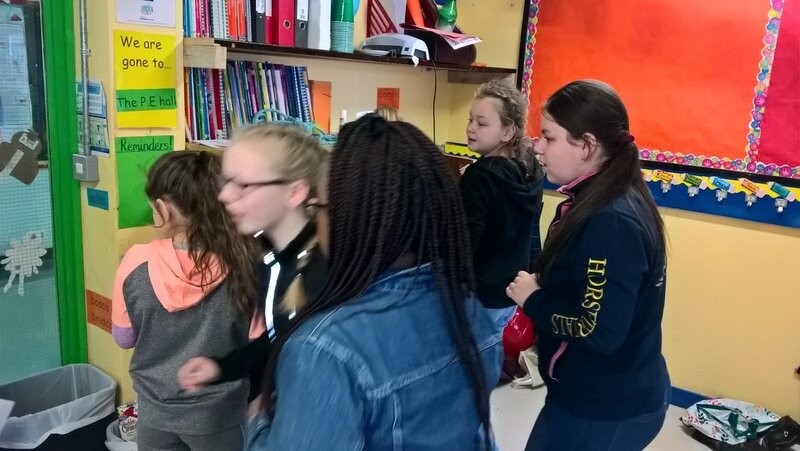 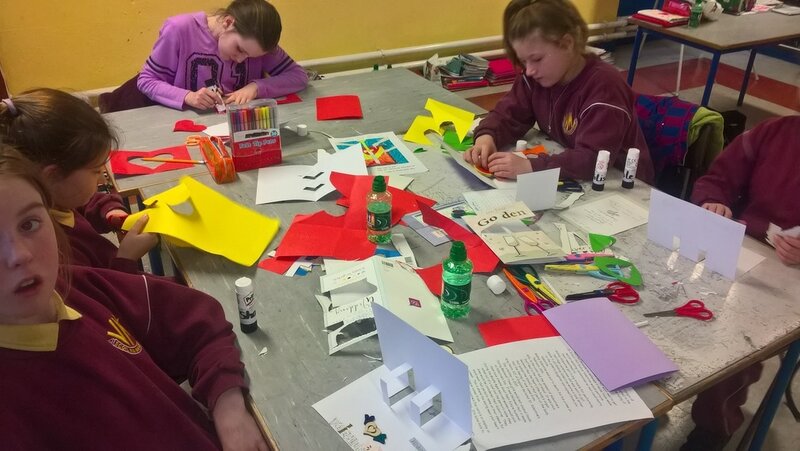 We got up to lots of fun activities for 'seachtain na gaeilge' including activities sa 'seomra gaeilge' with Mr McGuinness' sixth class, a 'trath na gceist' with third, fourth and sixth classes, and our 'Lá glas' performance day. 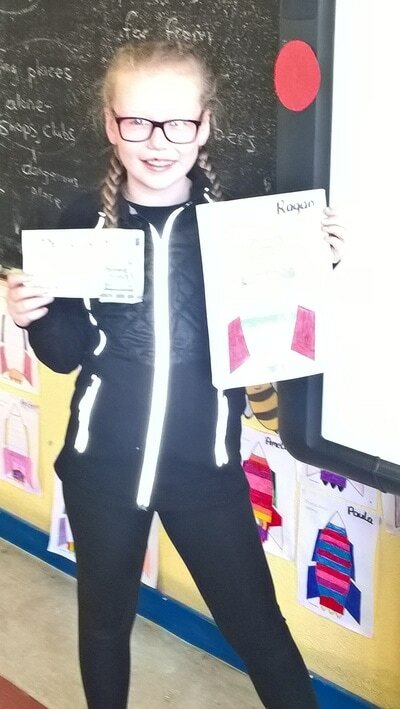 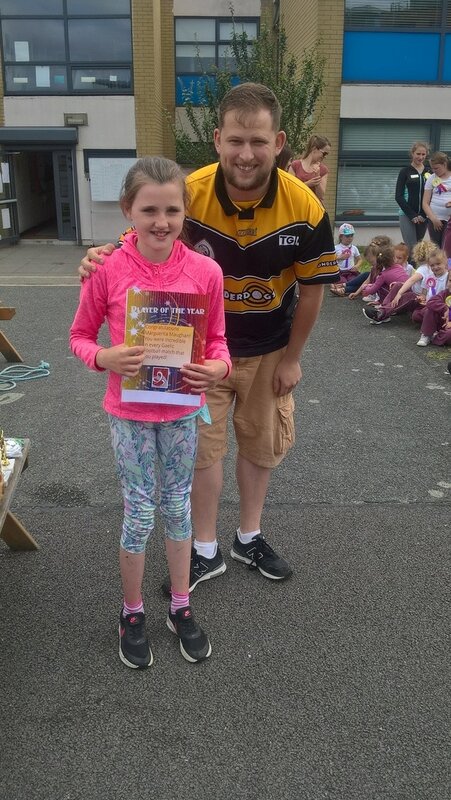 We won prizes for taking part in the activities 'as gaeilge' and we performed a very cool rendition of 'the cup song' as gaeilge for performance day. 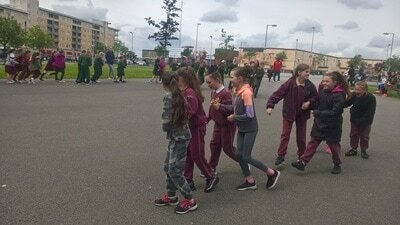 Have a listen to how we got on during practice. 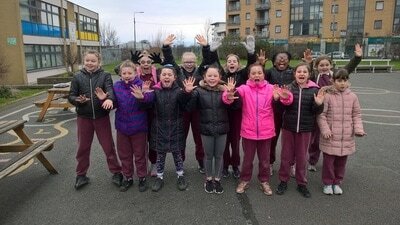 Spring has sprung!!! 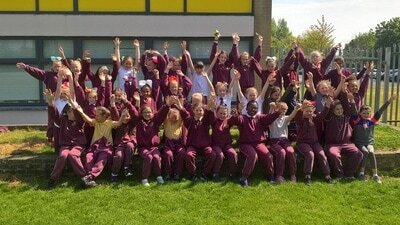 And so we decided to take our PE lesson outdoors into the glorius Spring sunshine. 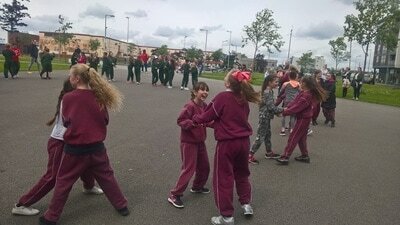 We had great fun skipping and getting outside to enjoy the weather. 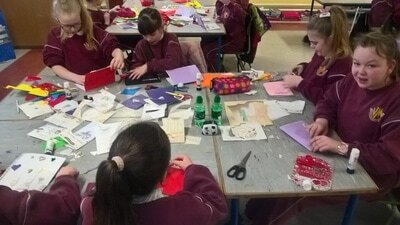 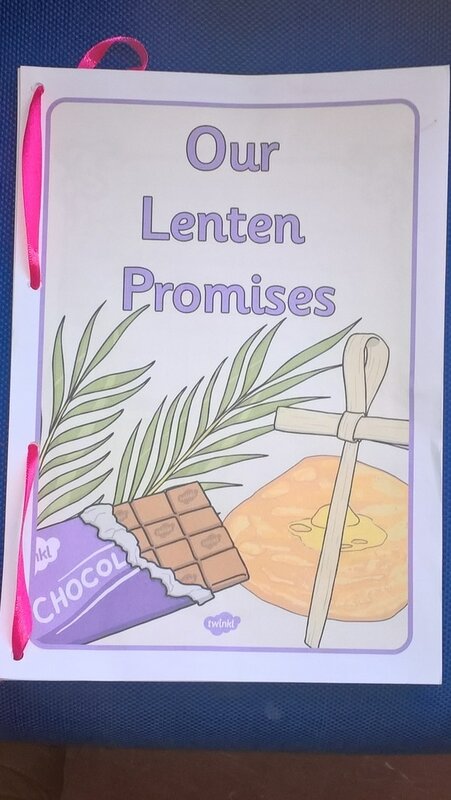 For the season of Lent, 5th class came up with some ideas of different things we could give up, as well as a number of different things we could improve on both at home and at school. 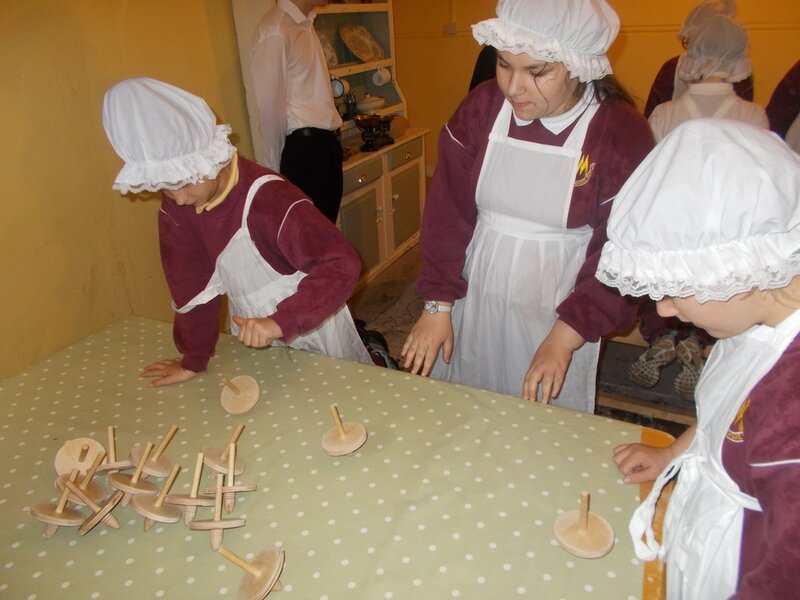 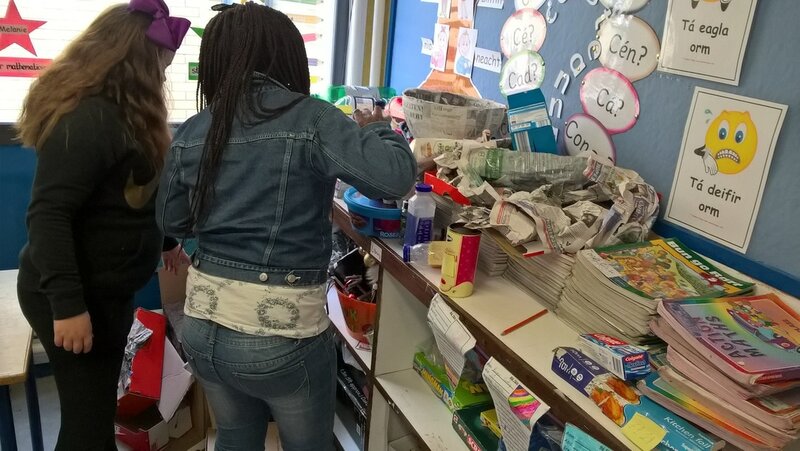 Some ideas included improving on behaviour, attendance, some academic subjects, work effort and lots more. We combined our ideas in a booklet entitled 'Our Lenten Promises', with each girl allocated a page in the booklet to record her goals for the Lenten season. What is 'onomatopoeia'? 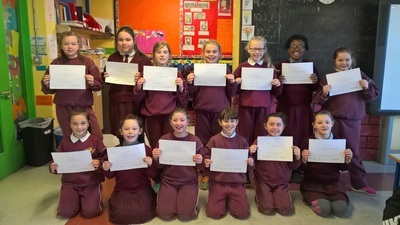 We recently learned in 5th class that a word which has 'onomatopoeia' is a word which mimics the action that it represents. Some examples we came across were 'slurp', 'achoo! 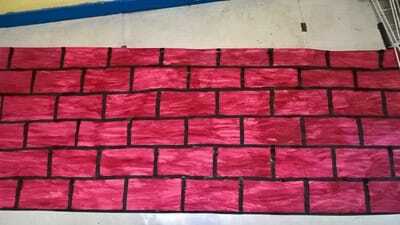 ', 'bang! 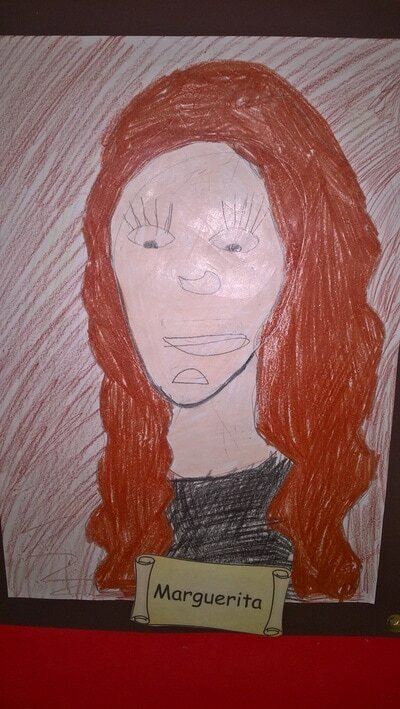 ', 'zap! 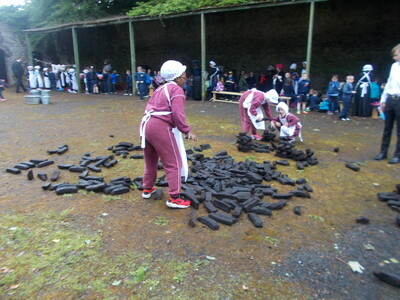 ', 'whack', 'chomp', 'crack' and many more. 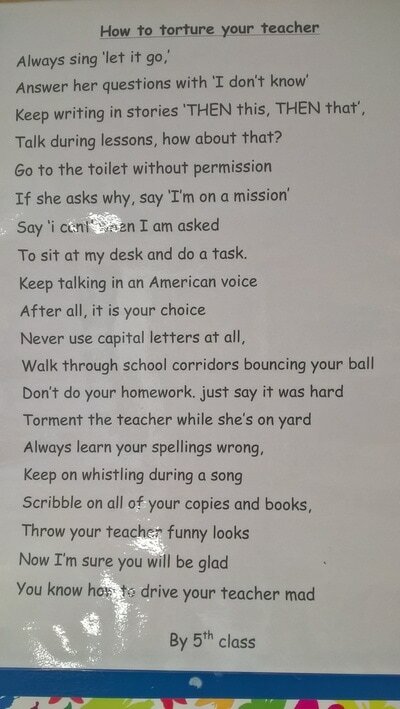 Using onomatopoeia, we as a class penned a poem which featured as many of these words as possible entitled 'The school'. 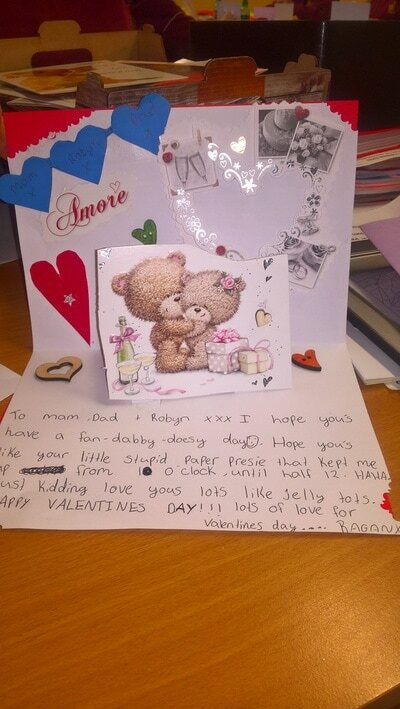 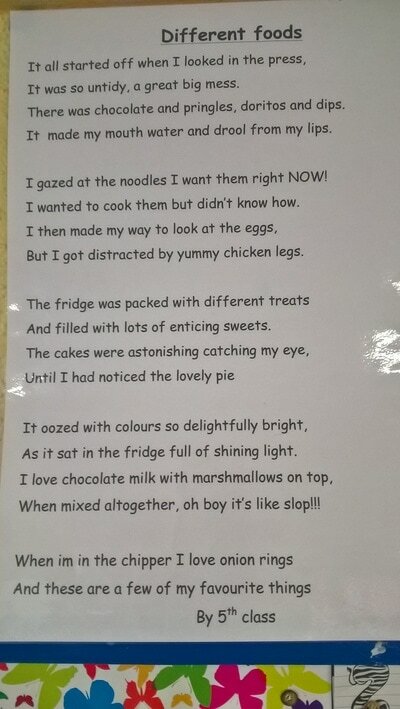 Have a read and see if you can spot the words which have onomatopoeia. 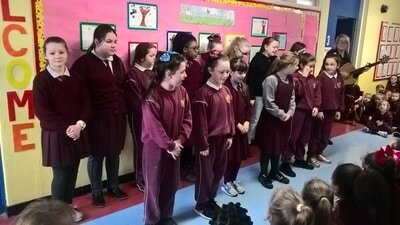 We had a whole school concert in Virgin Mary GNS, organised by the very talented Ms Rattigan. Each class performed their own individual class song, as well as all classes performing 'the Arky Arky song' altogether at the end of the concert. For our performance, we in 5th class performed the song 'count on me' by Bruno Mars. 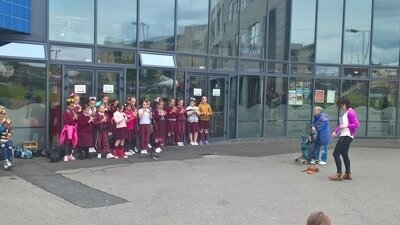 Well done to all classes involved...you all performed brilliantly! 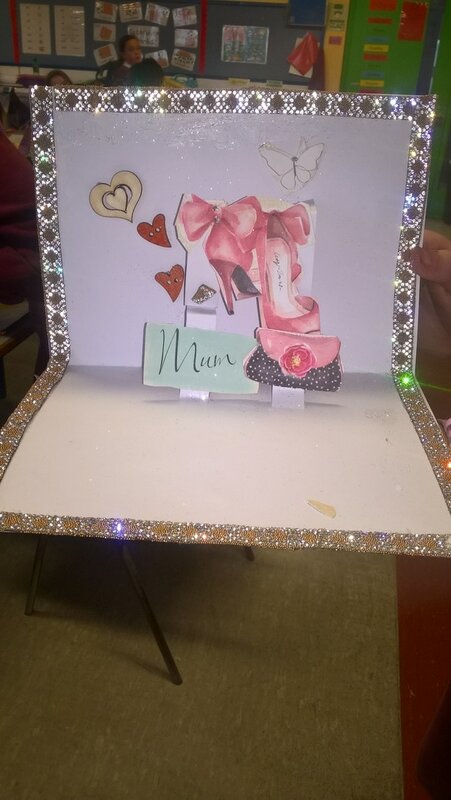 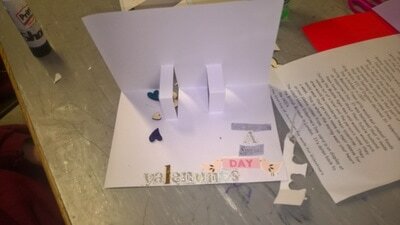 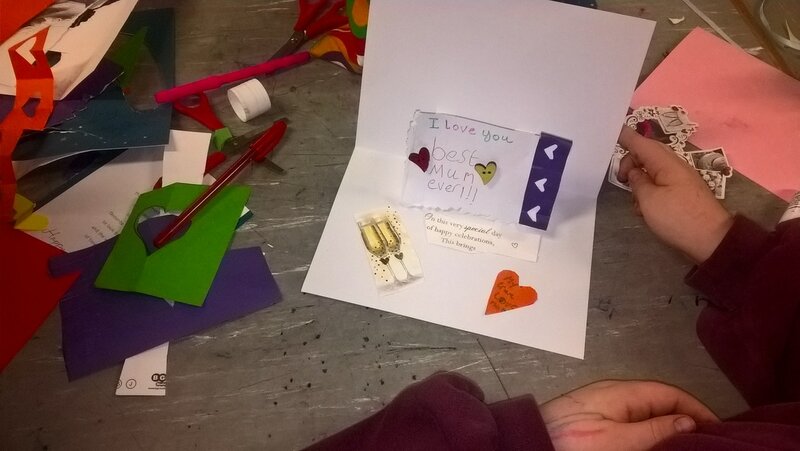 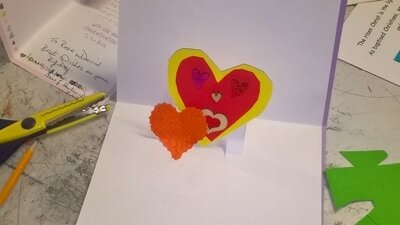 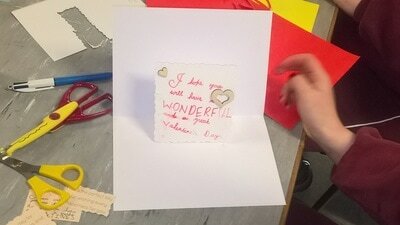 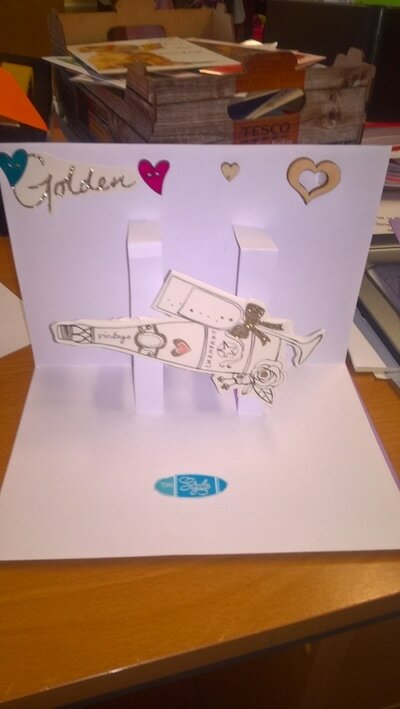 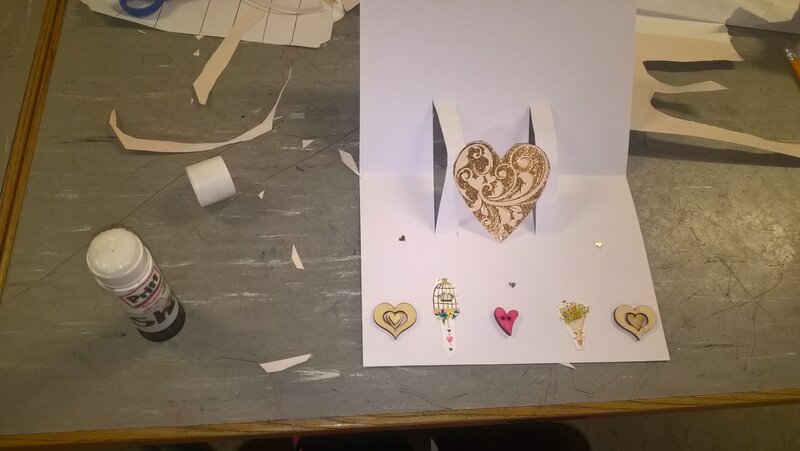 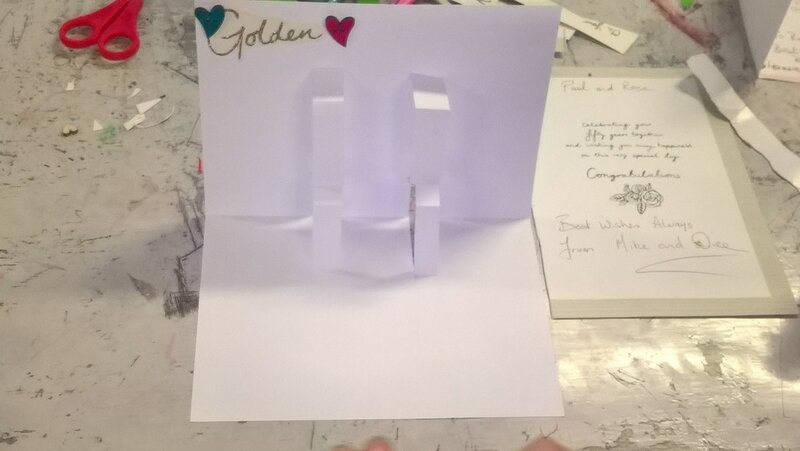 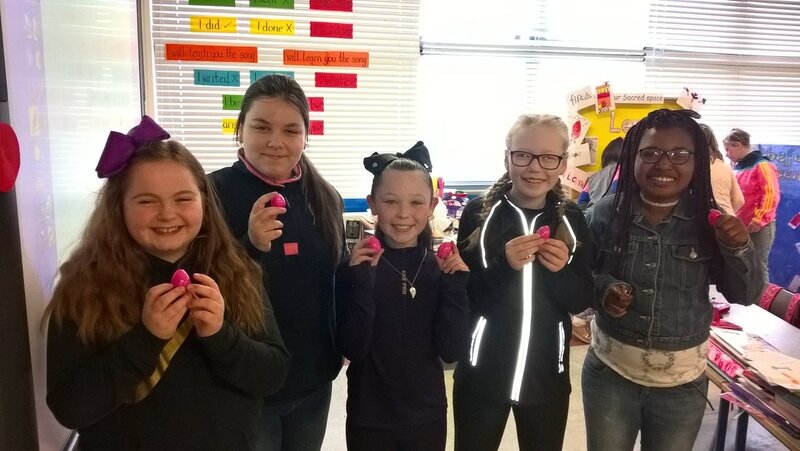 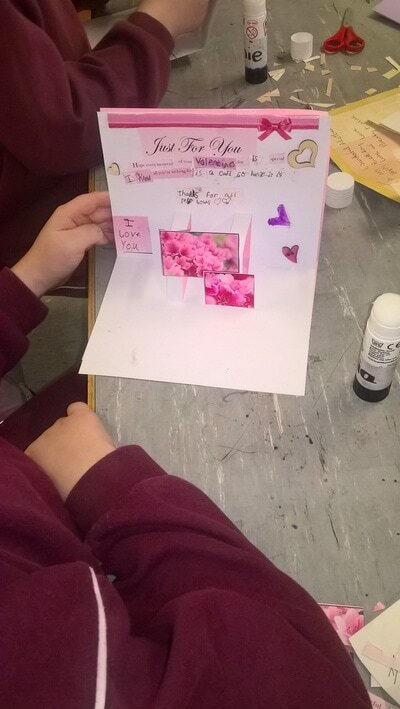 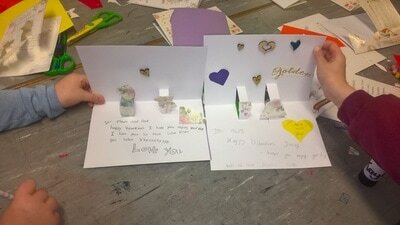 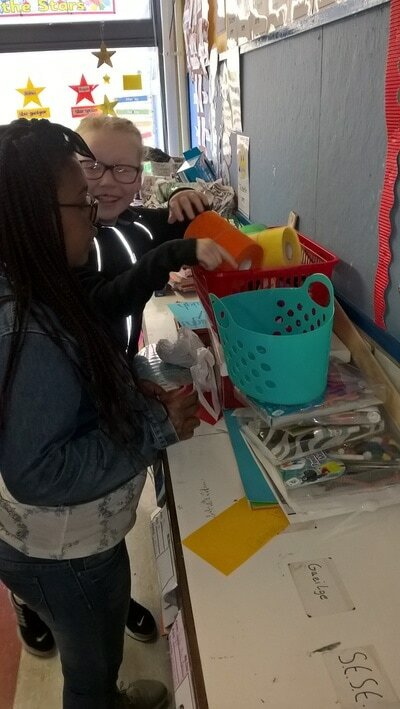 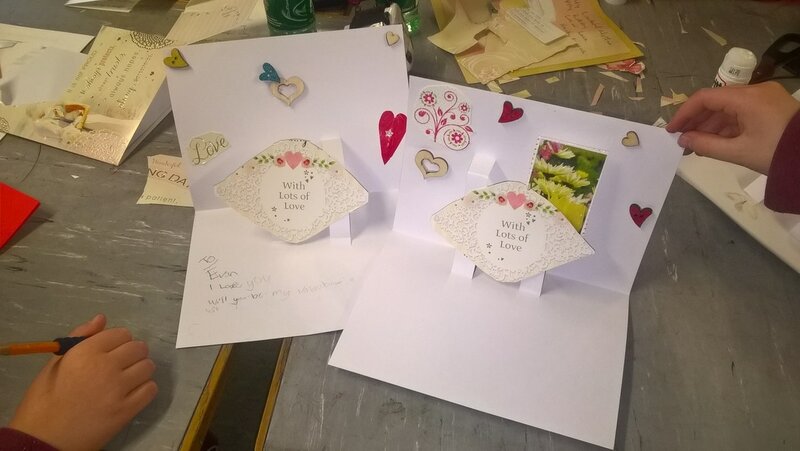 We constructed beautiful hand made Valentine's day cards by recycling old greeting cards, and adding some extra decorative touches with a splash of creativity. On February 10th, all primary school children in Ireland were encouraged to take part in a mass physical activity break for ten minutes at 10am. 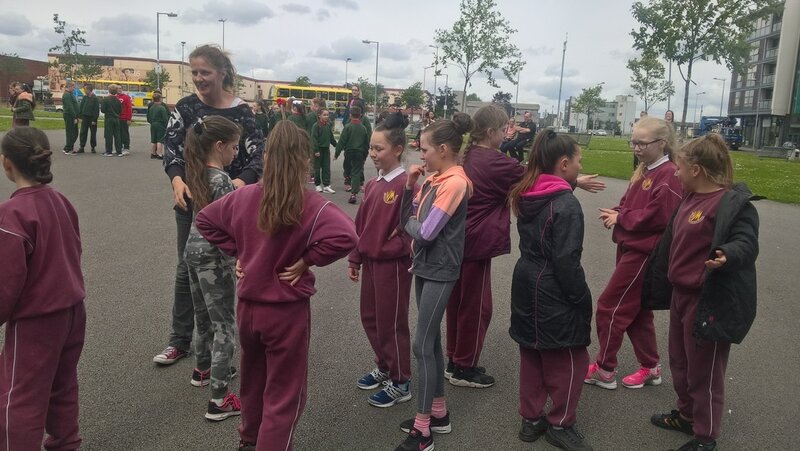 With a great exercise routine from Ms Shaughnessy and some funky dance moves from Mr O' Donovan, we were able to take part in this exciting event. 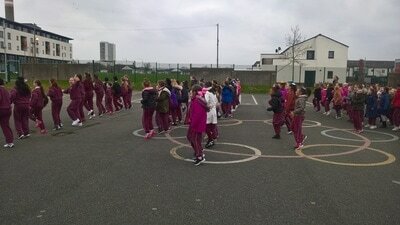 Recently we started learning hip hop dancing in Virgin Mary Girls school. 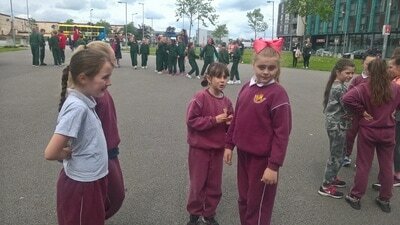 It is very exciting learning lots of new cool dance moves while having lots of fun with our classmates. 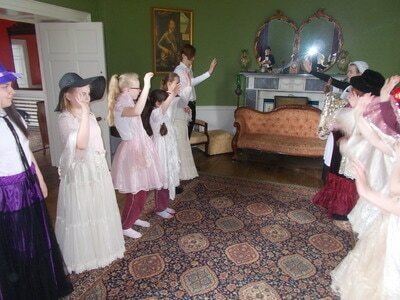 Here we are practicing a new dance routine which our hip hop dance tutors are teaching us. 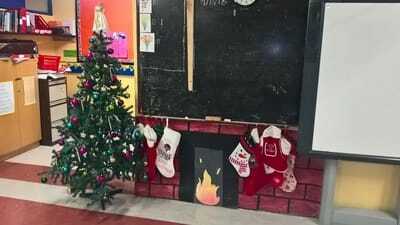 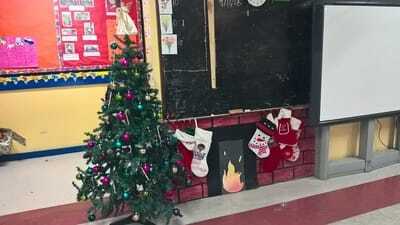 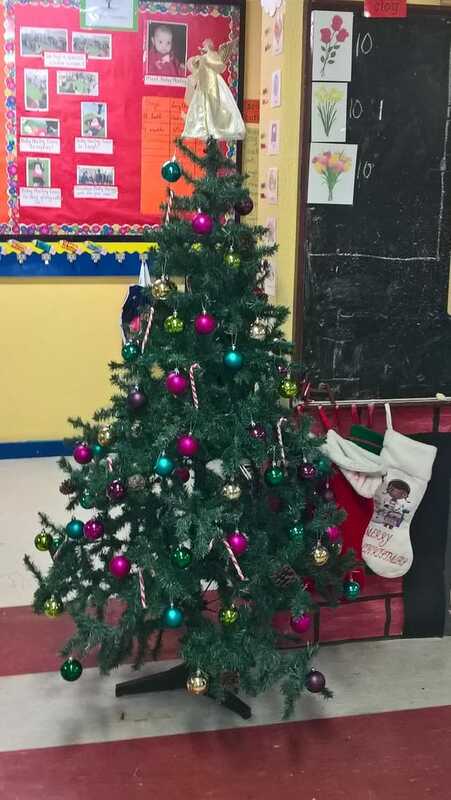 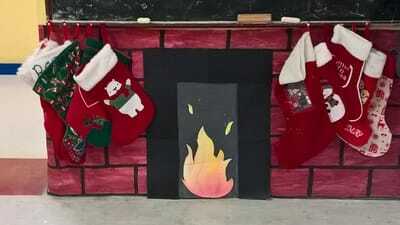 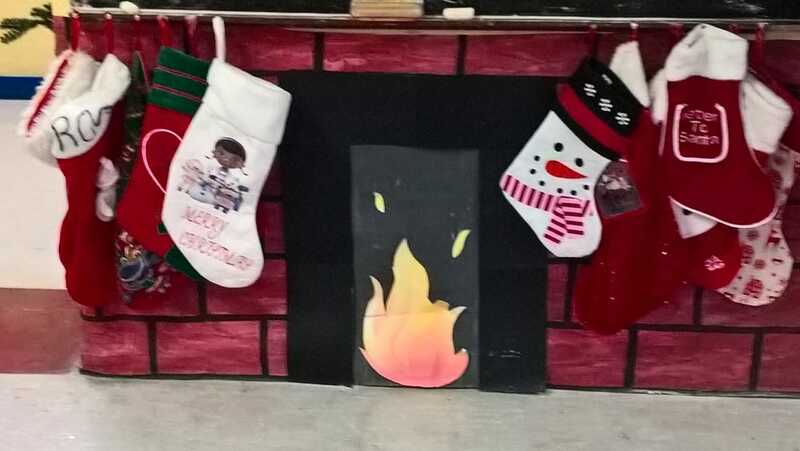 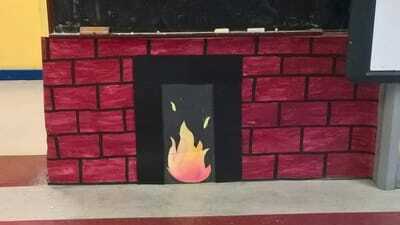 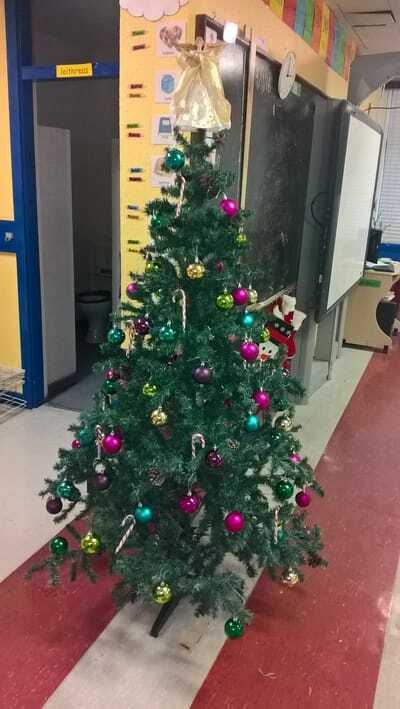 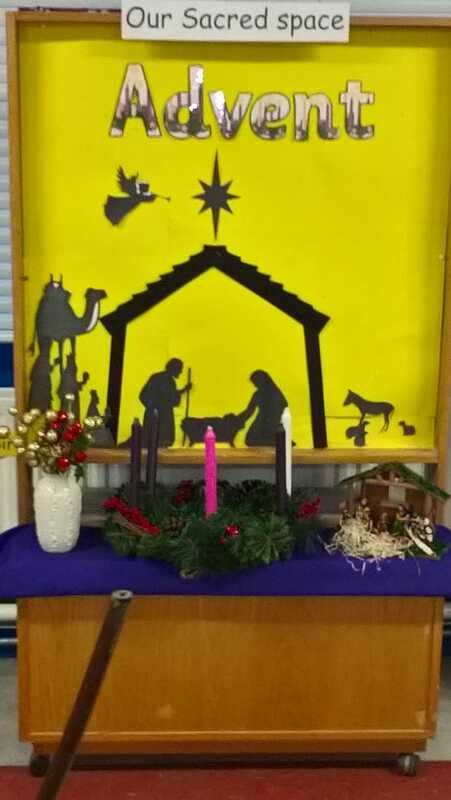 ​Merry Christmas and a very happy new year, from 5th class. Recently we had another special visit to Virgin Mary Girl's school...this time, Ciarán Kilkenny from the all Ireland winning Dublin team stopped by with the Sam Maguire cup. 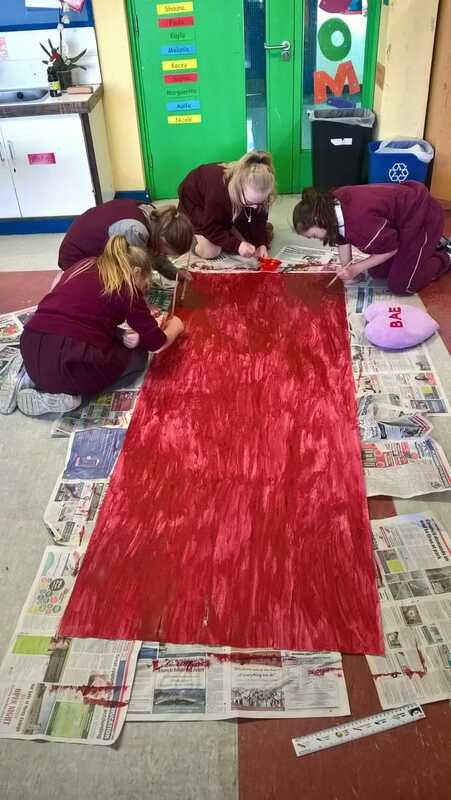 We are also in the process of constructing our very own Sam Maguire, which is still a work in progress! 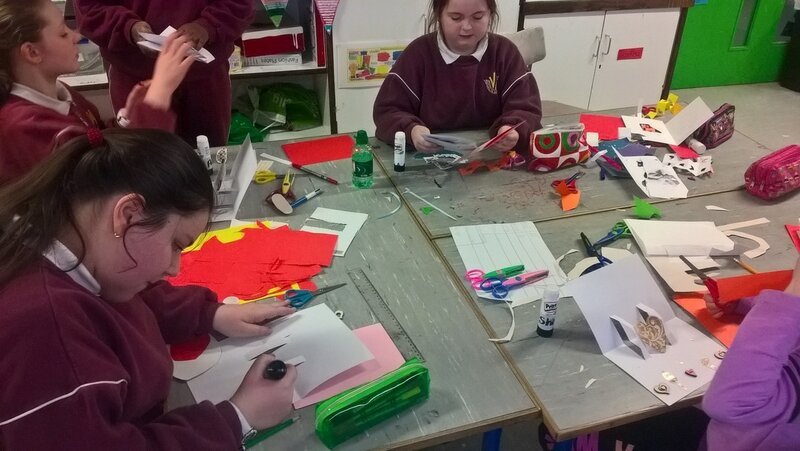 Our school held a Winter Fair on Friday 9th December, and we in 5th class made our very own contribution by making some Christmas chocolate sleighs to sell. There was great excitement in the Virgin Mary boys and girls schools recently. Our schools were very lucky to win a competition with 98fm which meant we had an extra special visit from 'Panto Polly'and Dustin the Turkey. 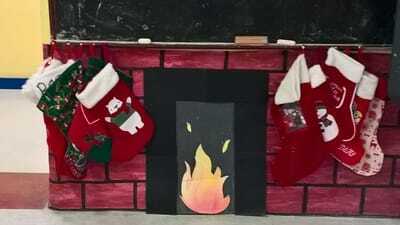 It was a fun filled morning and we even got to see our teachers perform on stage! 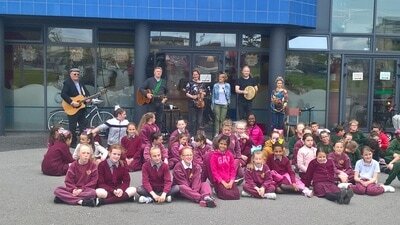 ​Here we are below getting our photo taken with the 98fm crew who were on board 'big red' especially for the occasion. Look at our lovely certificates we received for our participation in Maths week 2016 at D.I.T Kevin's Street and again during Science week 2016 at the National Concert Hall. 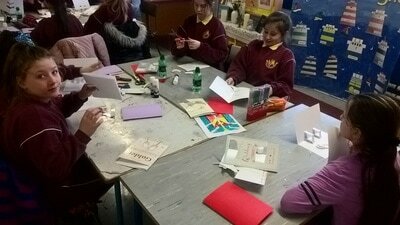 We in fifth class are working on perfecting the art of handwriting, with each girl working to acquire her own pen licence. 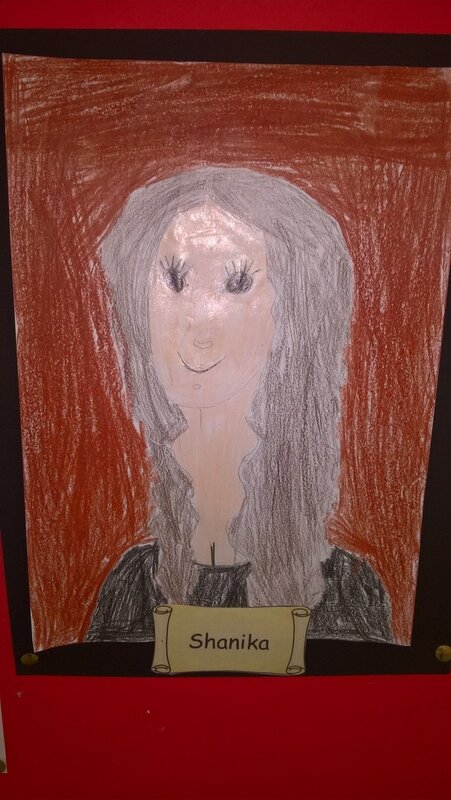 This will allow her to make the transition from pencil to pen. 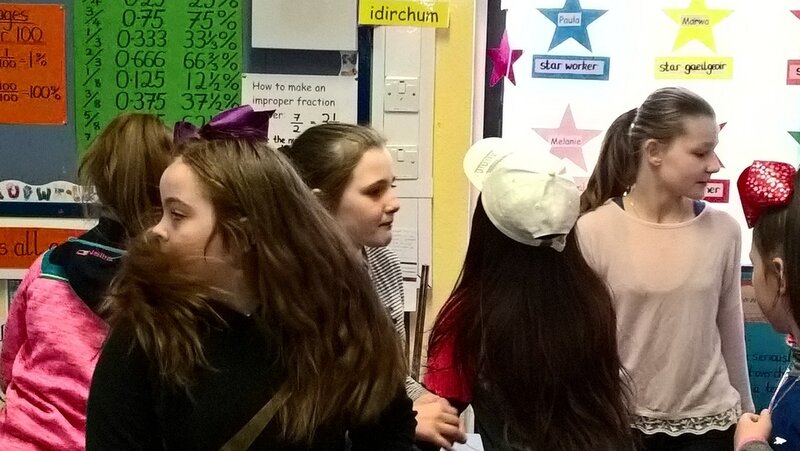 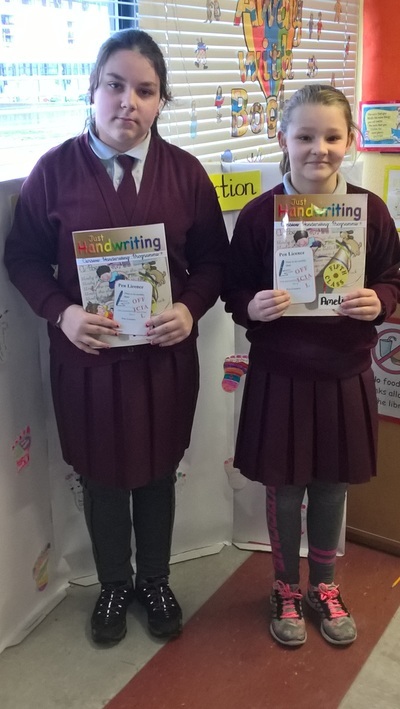 So far a small number of girls have been successful in obtaining their pen licence, with everyone else motivating one another and working really hard on perfecting their handwriting skills. 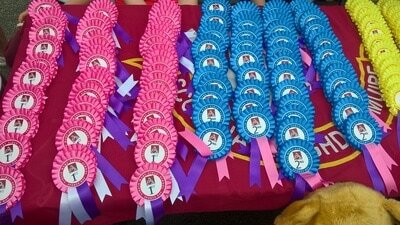 Keep an eye out each week to see who has successfully obtained their pen licence. 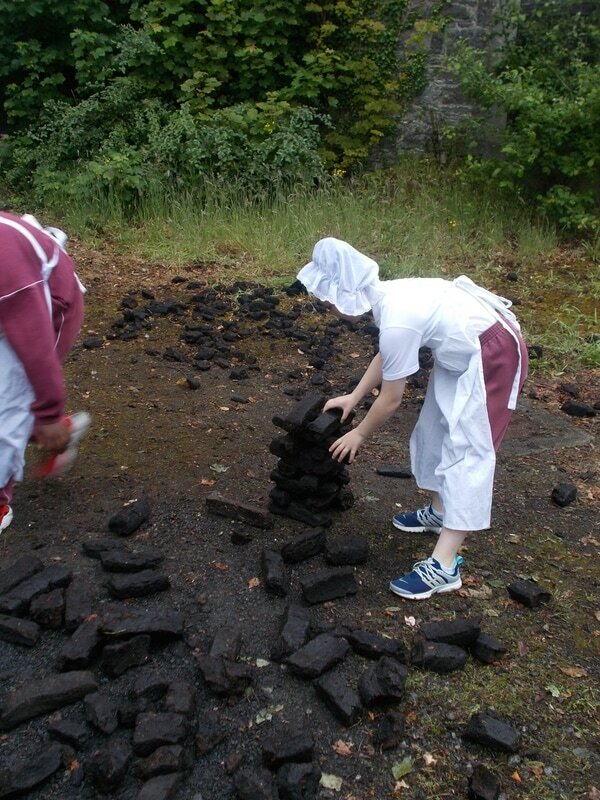 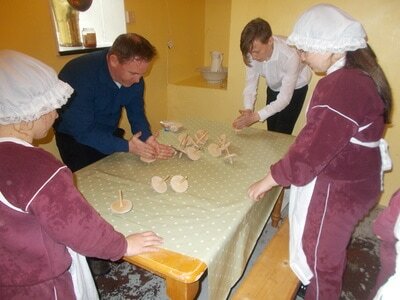 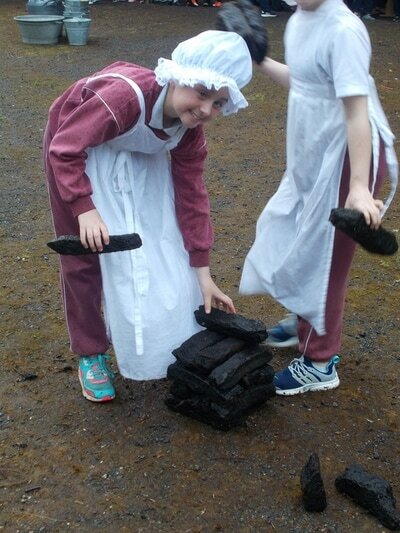 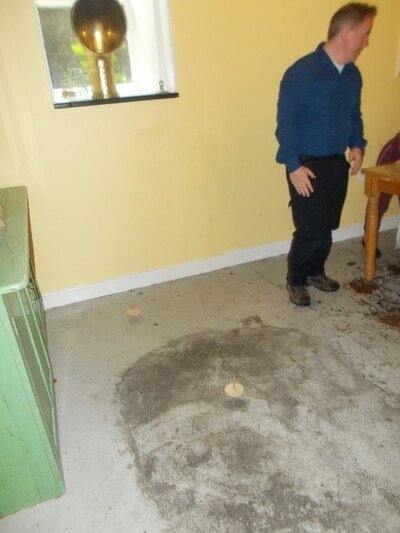 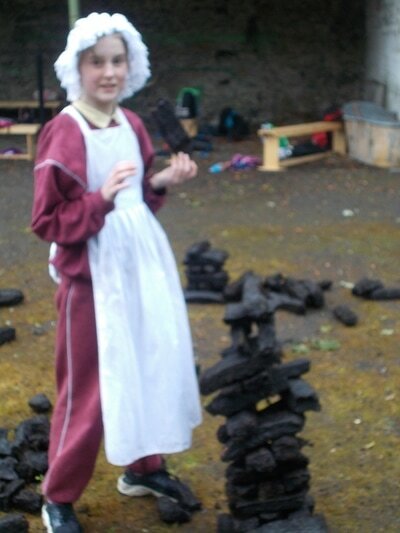 As part of science week, 5th and 6th classes went on a trip to D.I.T Kevin's Street. 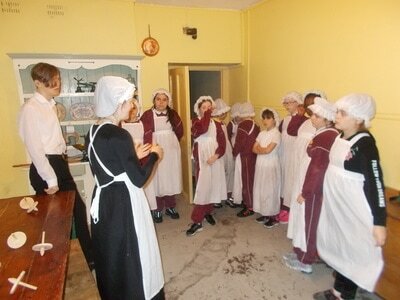 While we were there, we learned about the many properties and components of air. 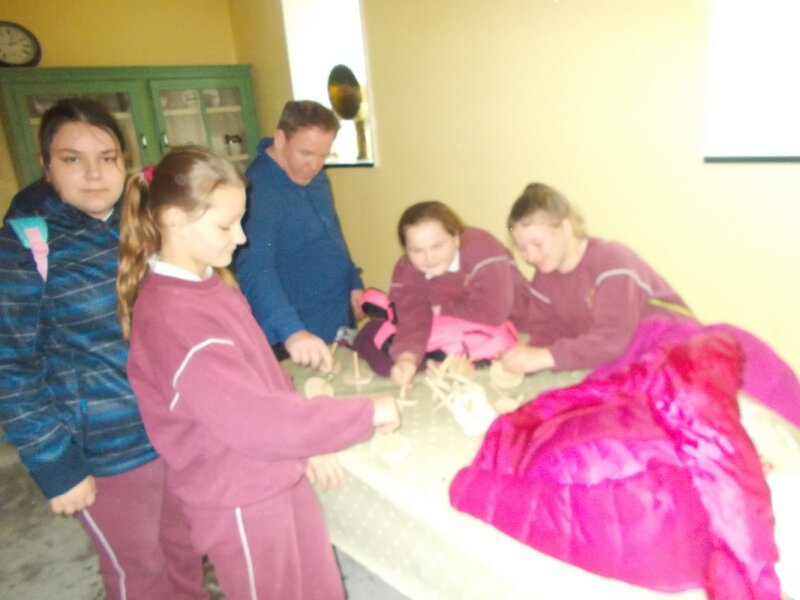 We experienced some really cool experiments and learned all about a very famous Irish scientist named Robert Boyle. 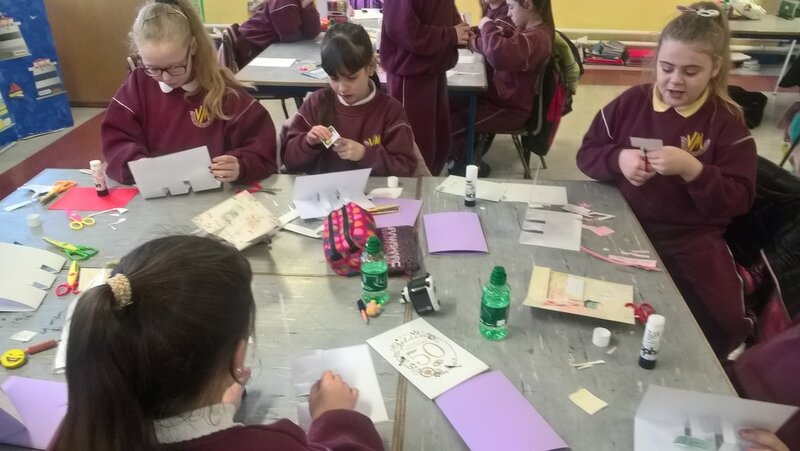 As part of Science week, 3rd, 4th, 5th and 6th classes were invited to a workshop in the National Concert Hall to take part in a combination of science and music activities. We learned all about sound and how it travels through vibrations. 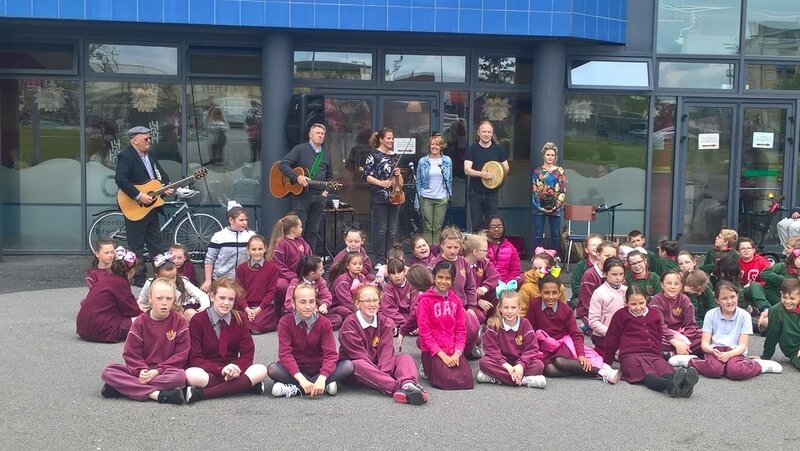 Using a range of musical instruments we were able to explore this further with the help of some science and music students from Trinity College Dublin. 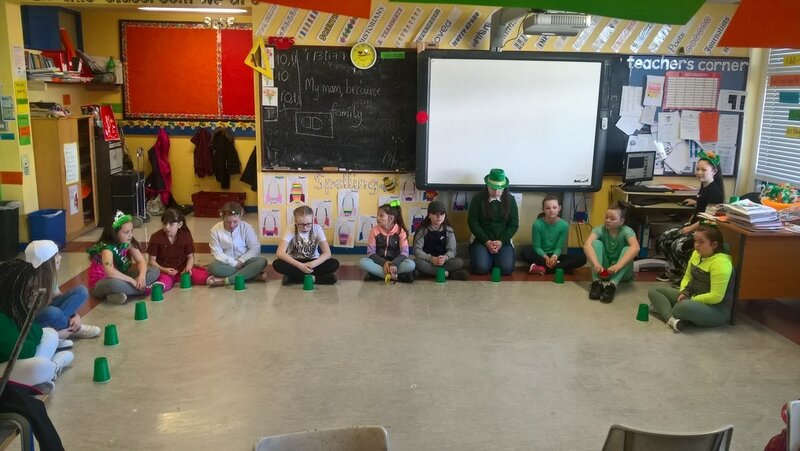 Our class got to try out some musical instruments including drums, a harp and piano, exploring how each instrument creates vibrations to make it's own individual sound. At the end of the workshop we were allowed to construct our very own musical instruments using a range of materials including rice, pasta, balloons, elastics, cardboard, plastic cups, tubes and glass bottles. 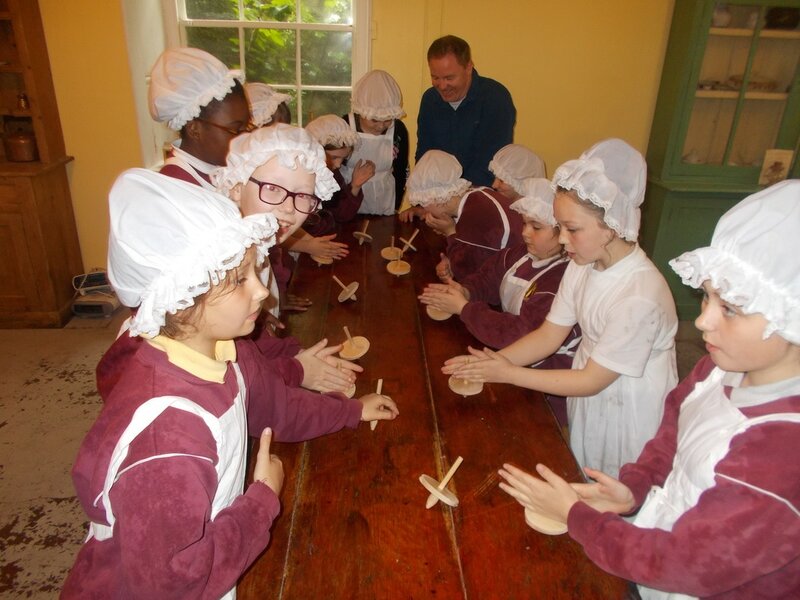 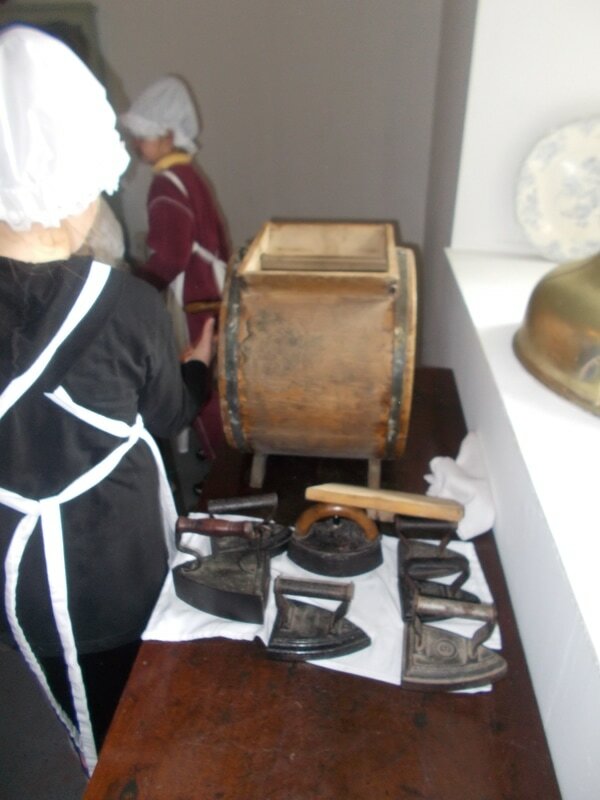 Check out our pictures below and see if you can guess what kind of instruments we made! November is a very special month of the year for remembering all of our loved ones who have died and gone to heaven. As a special tribute to our friends and members of our family who have passed away, we created a remembrance tree for them on our Sacred Space in our classroom. 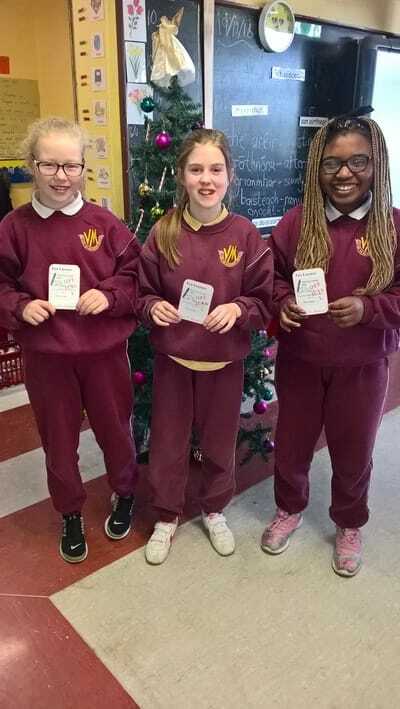 Each girl wrote down the names of her loved ones on a tag, which she then hung on the remembrance tree. 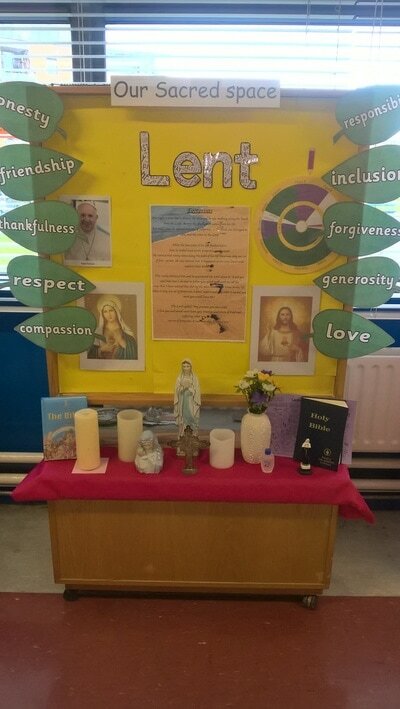 Every day for the month of November, we will say a special prayer for the names on our remembrance tree. 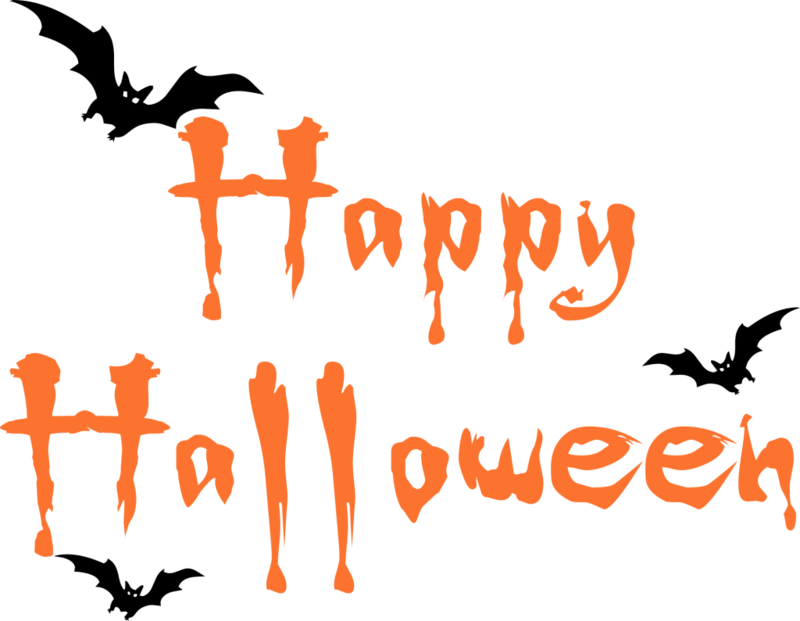 Everyone had a great time at the school Halloween Disco, seeing all the other classes and teachers dressed up for the occasion. Each class took part in a fun dance off, with the best dancers in each class winning a cool prize. 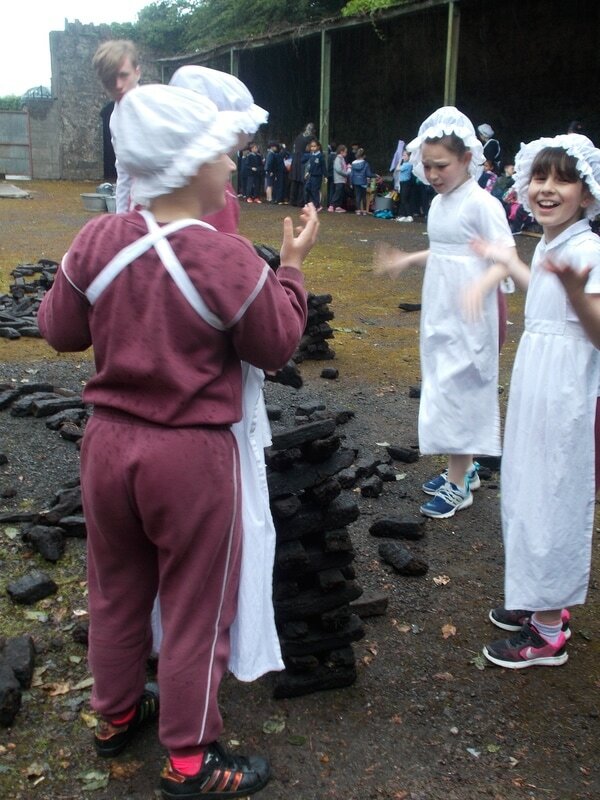 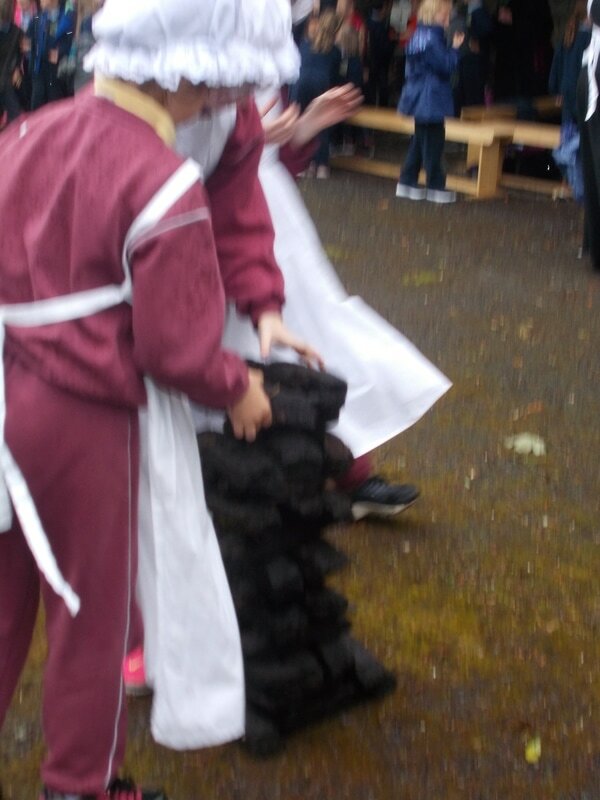 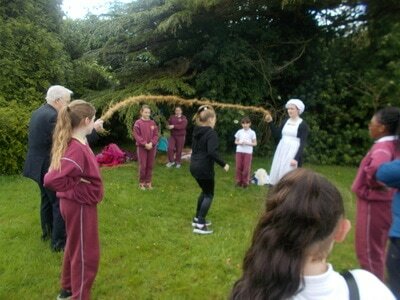 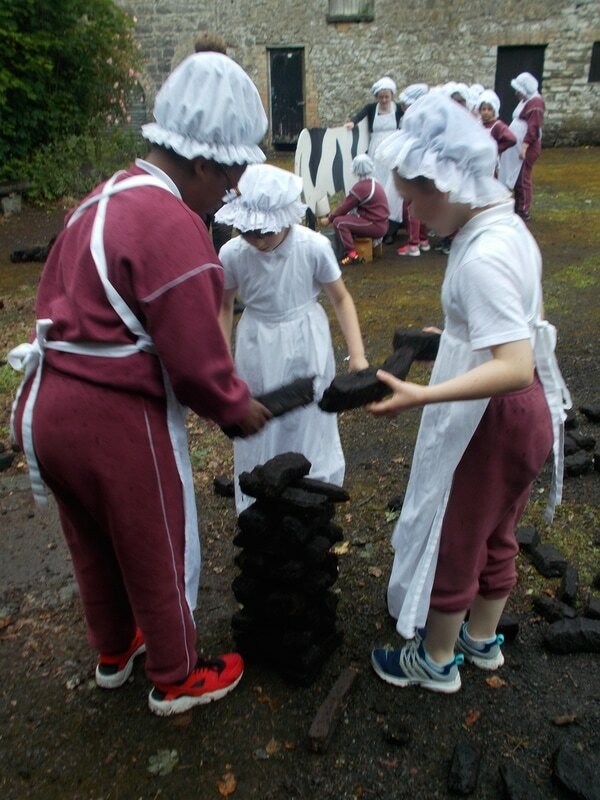 In 5th class we played some traditional Halloween games, whilst also learning about the history of Halloween and how the tradition has come to be as we know it today. We had 'Lá gorm' (blue day) in Virgin Mary GNS to celebrate the Dubs team reaching the all Ireland Senior football final. As part of our celebrations, we learned how to play the tune 'Molly Malone' on our tin whistles. 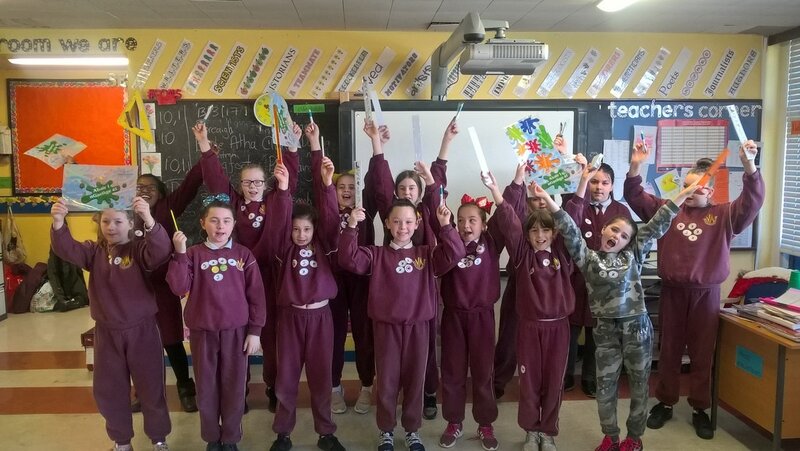 In our English activities we wrote some acrostic poems about Dublin, as well as learning about famous places and landmarks in our home county. 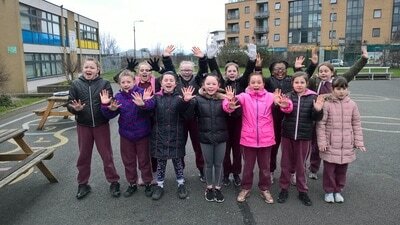 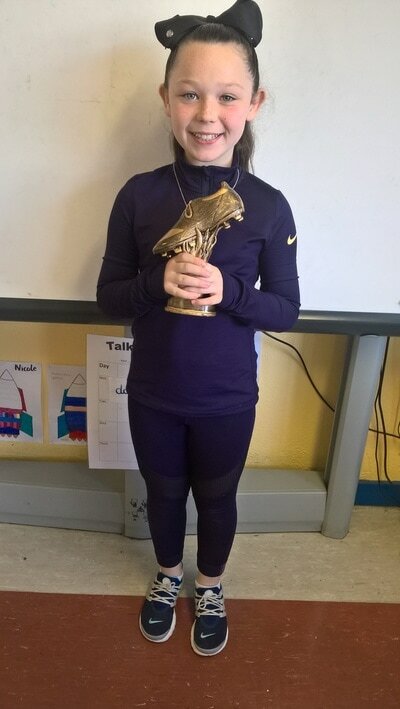 Our class love Gaelic football and many of us are on the school Gaelic football team. 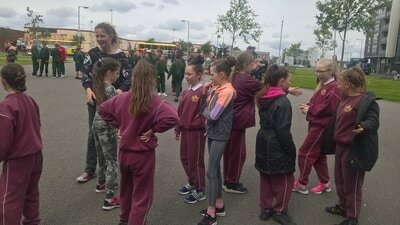 It was so exciting for us to watch the Dubs playing in the final, and we were thrilled when Dublin triumphed to victory in the end. UP THE DUBS! !.